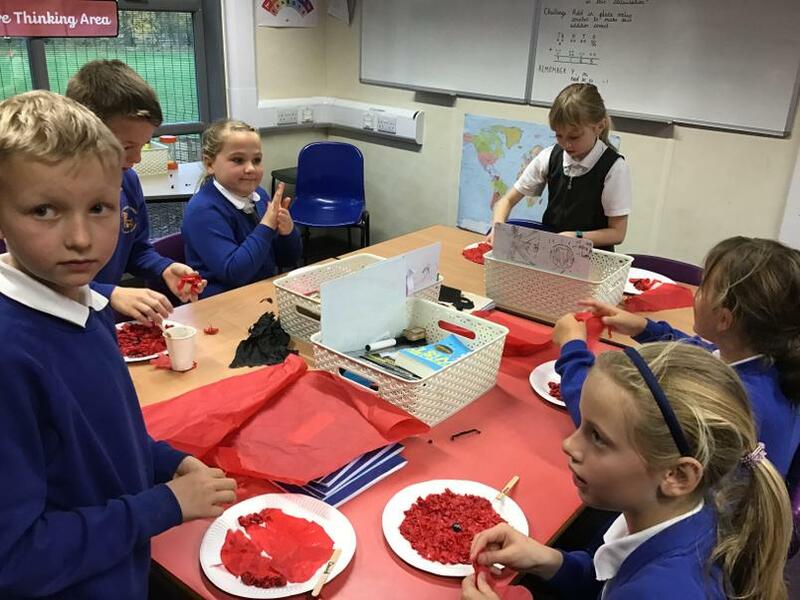 We are Foxes class. 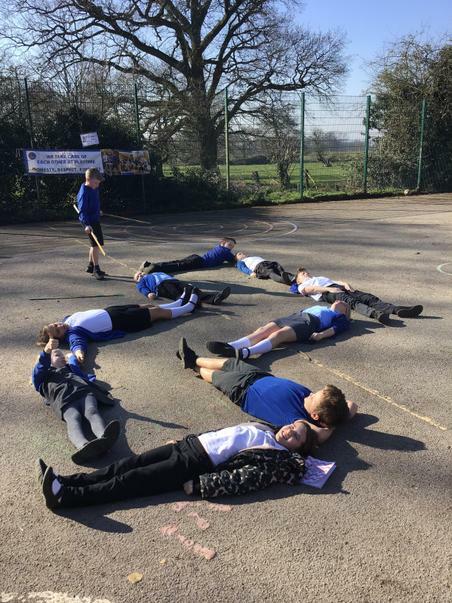 We are Year 4 and 5. 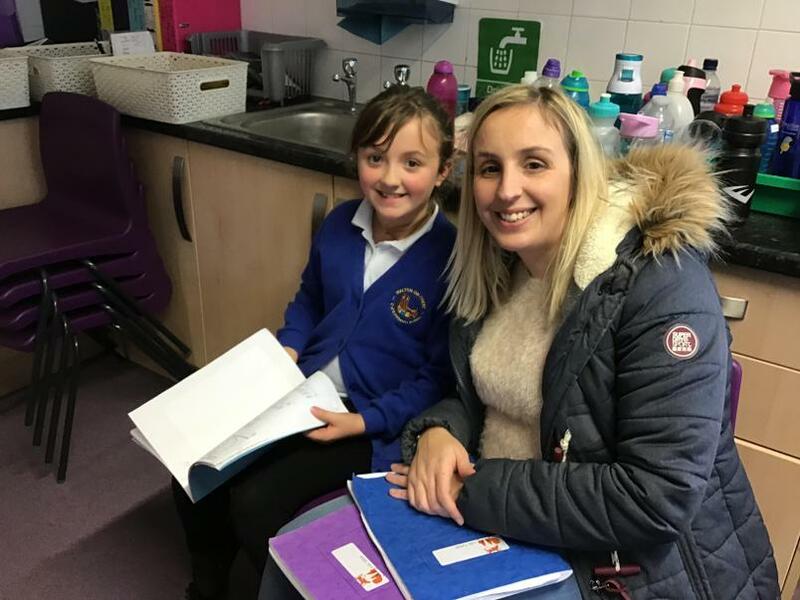 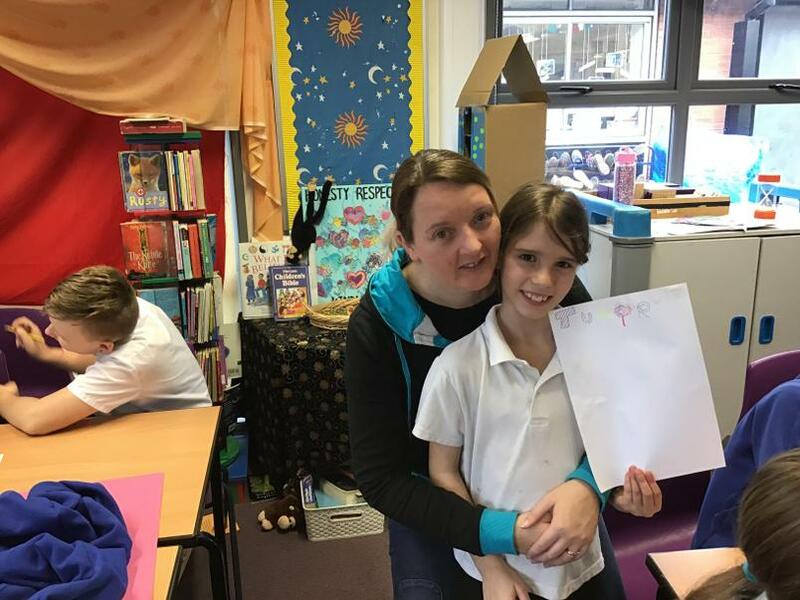 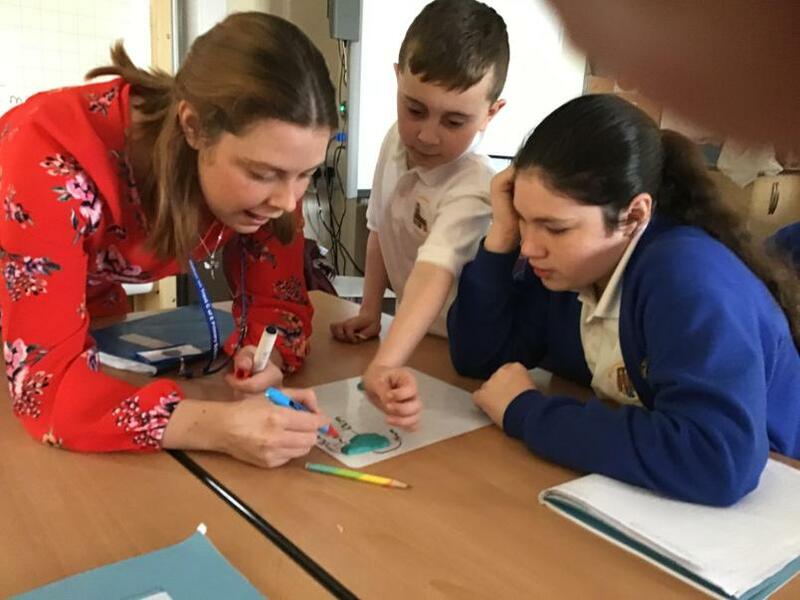 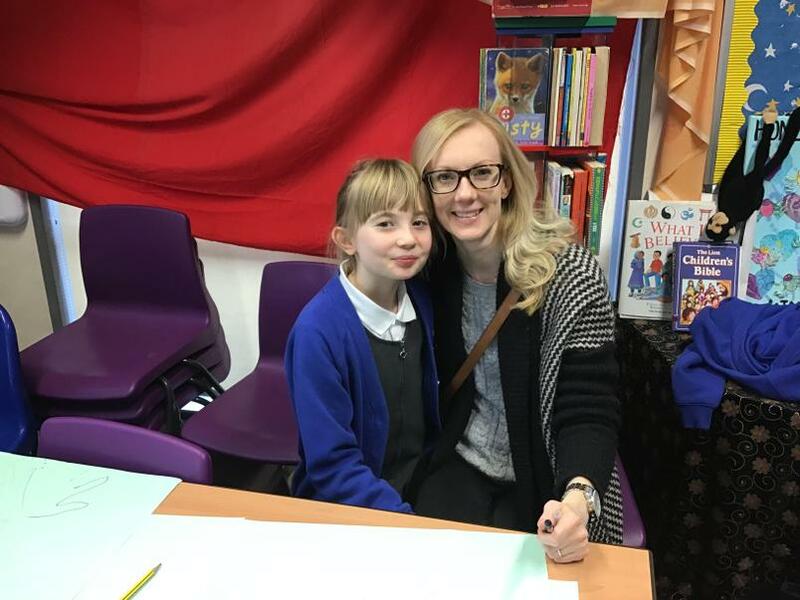 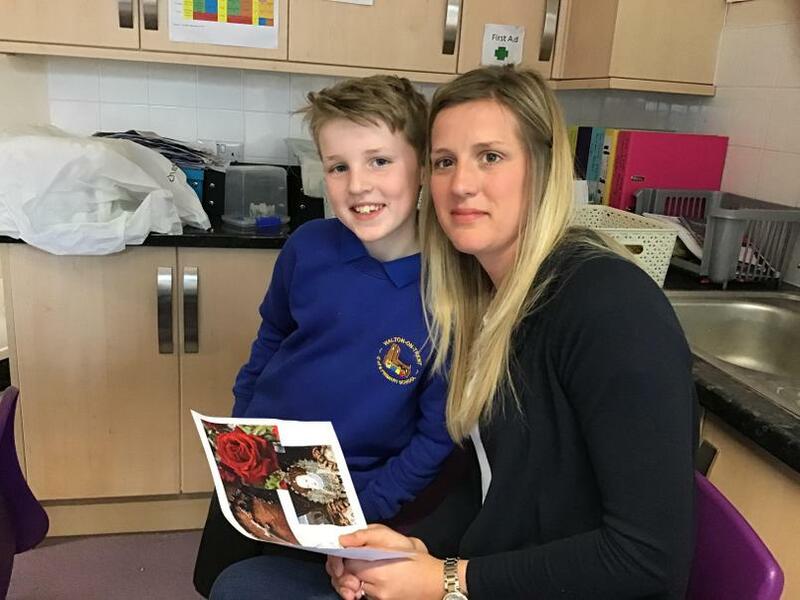 Our teacher is Mrs Stewart, supported by Mrs Lee. 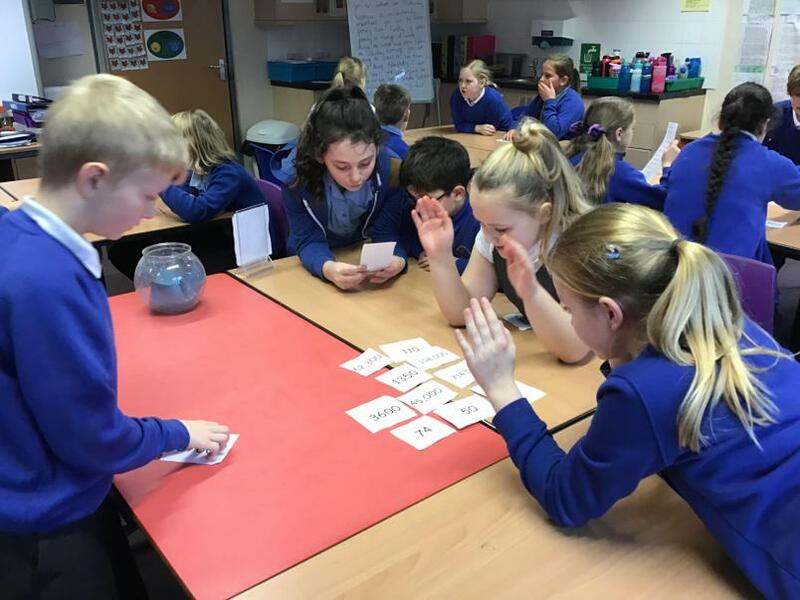 Please make sure that you are practising your spellings and times tables at home! 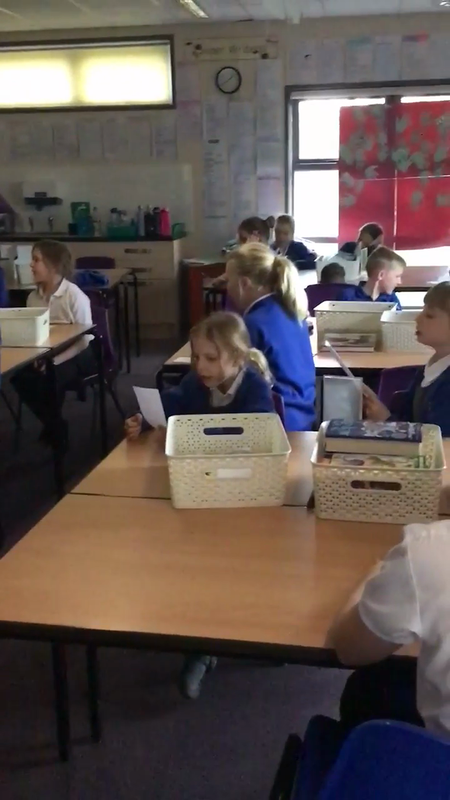 We do our spelling test every Monday afternoon! 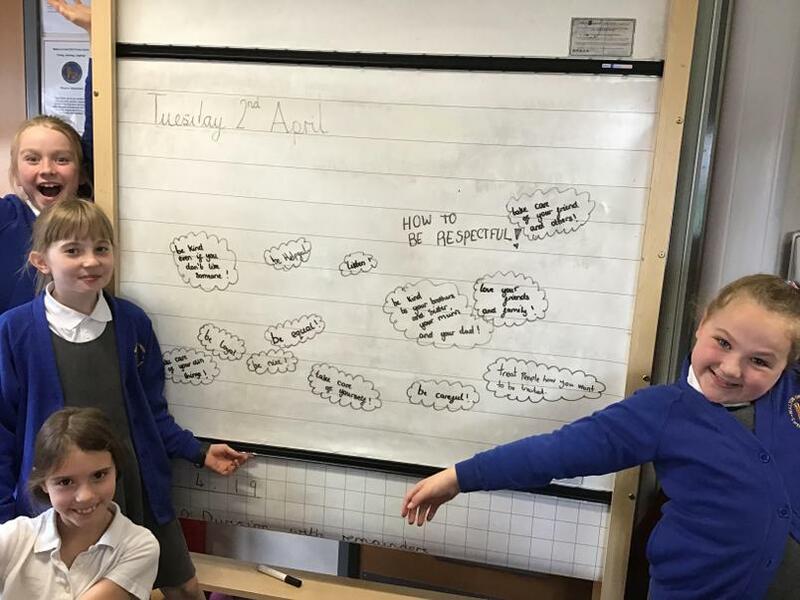 Please could everyone complete the activity highlighted in pink (a story about an alien) and then choose 2 other activities from the list! 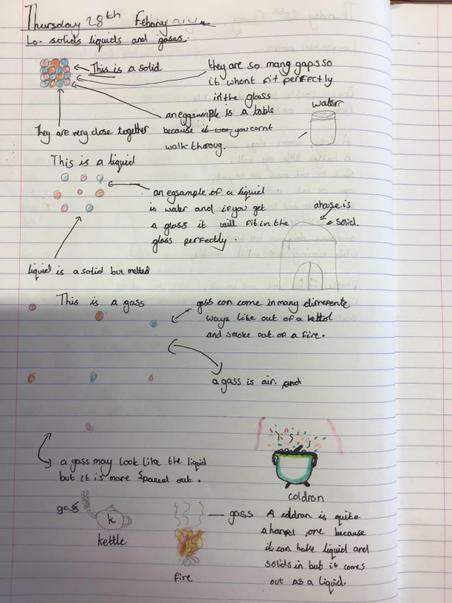 Science - States of Matter (Solids, liquids and gases; changes of state). 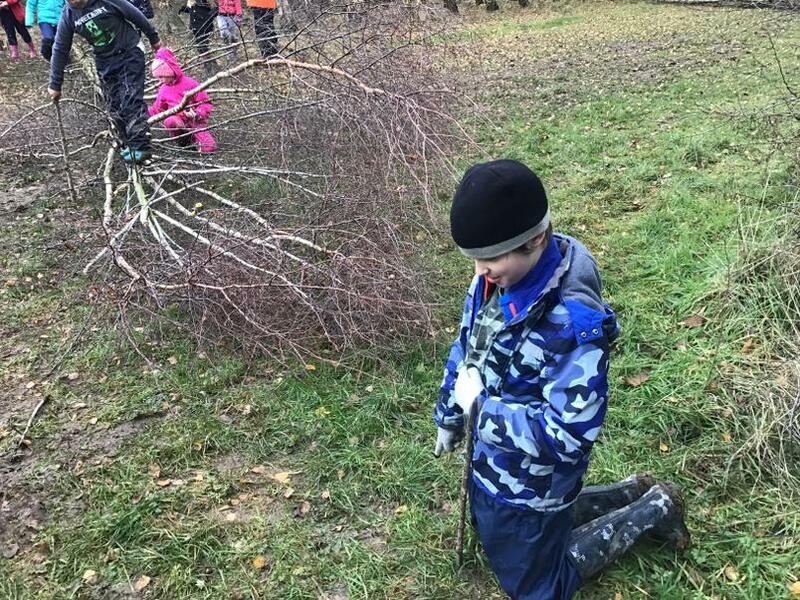 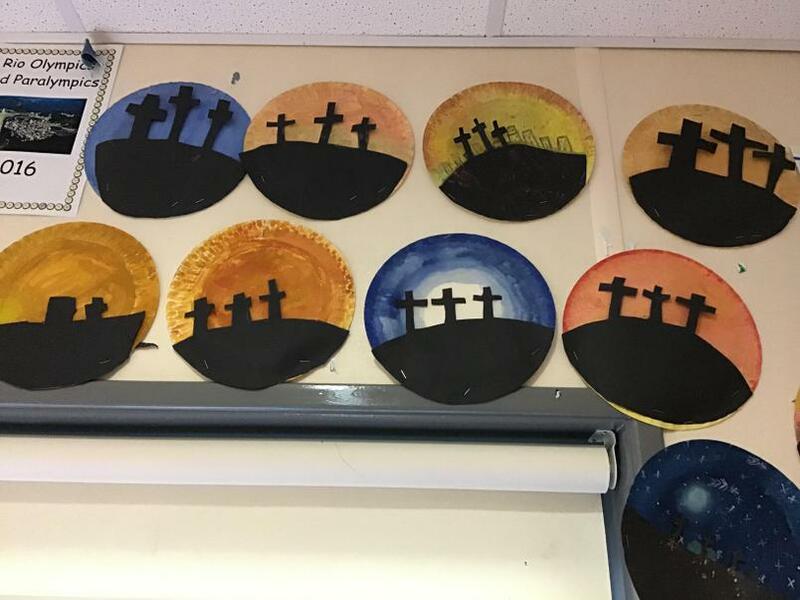 RE - Stations of the Cross and why did Jesus die? 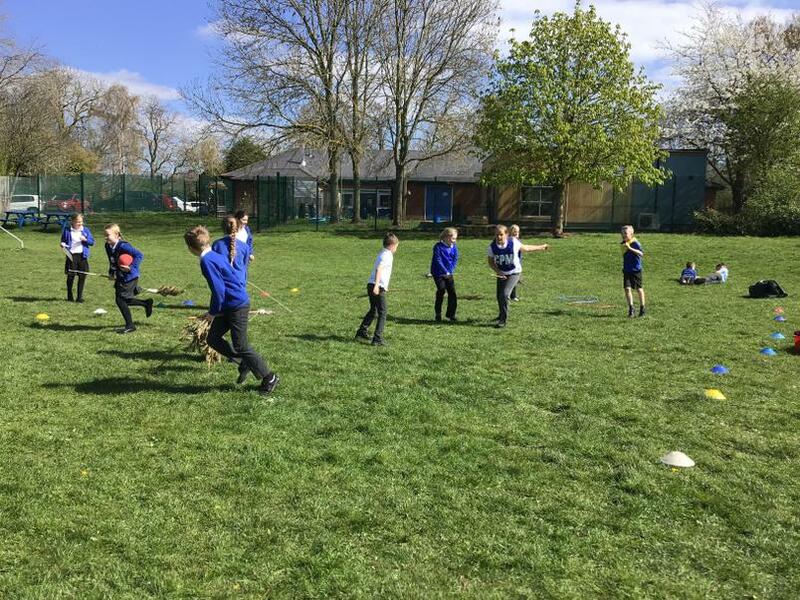 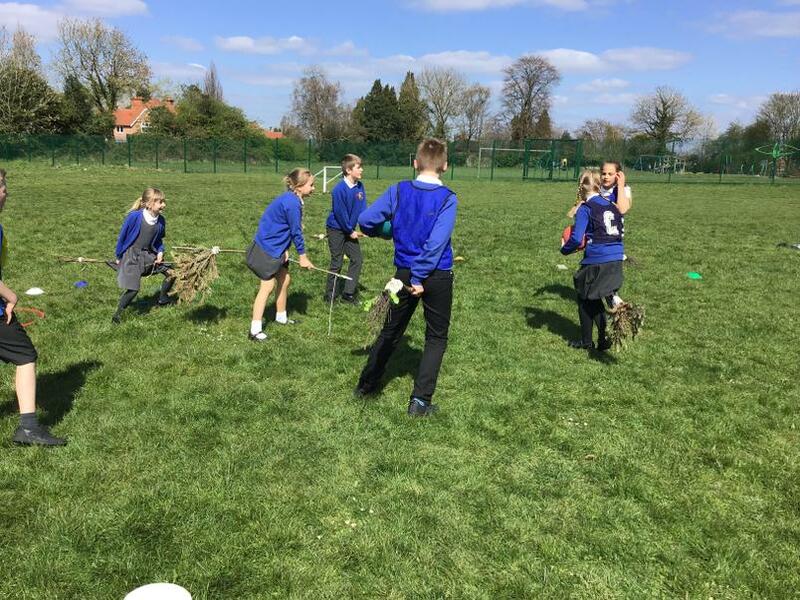 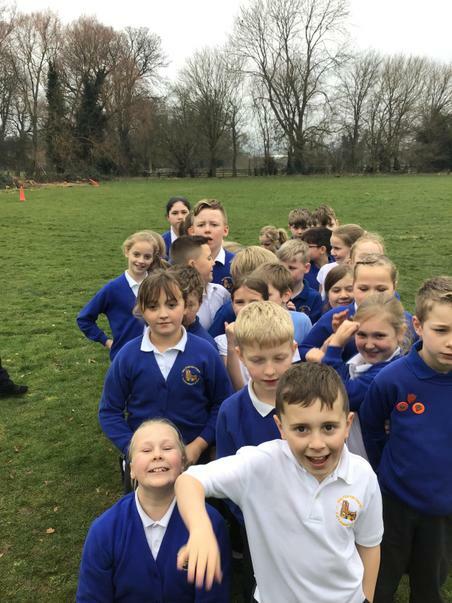 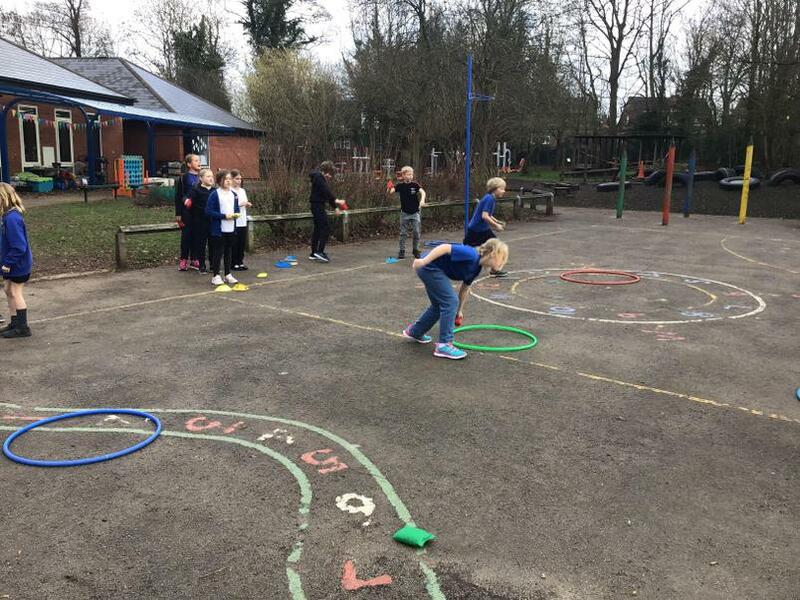 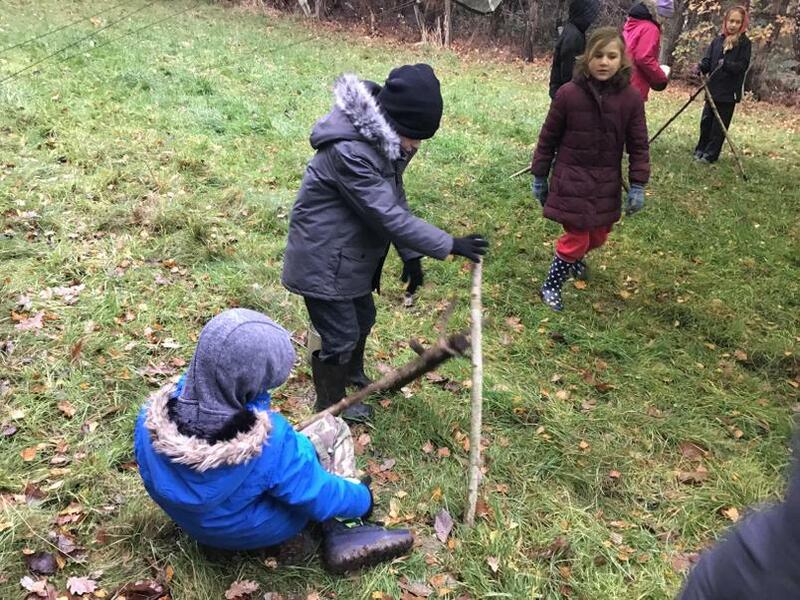 To celebrate how hard we have worked this half term, we built our own broomsticks and played Quidditch! 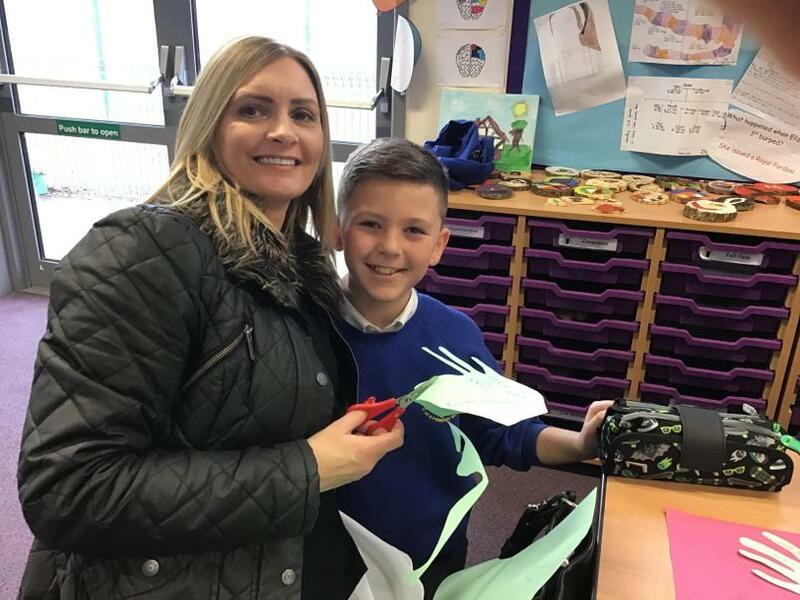 We had a very creative Curriculum Showcase afternoon! 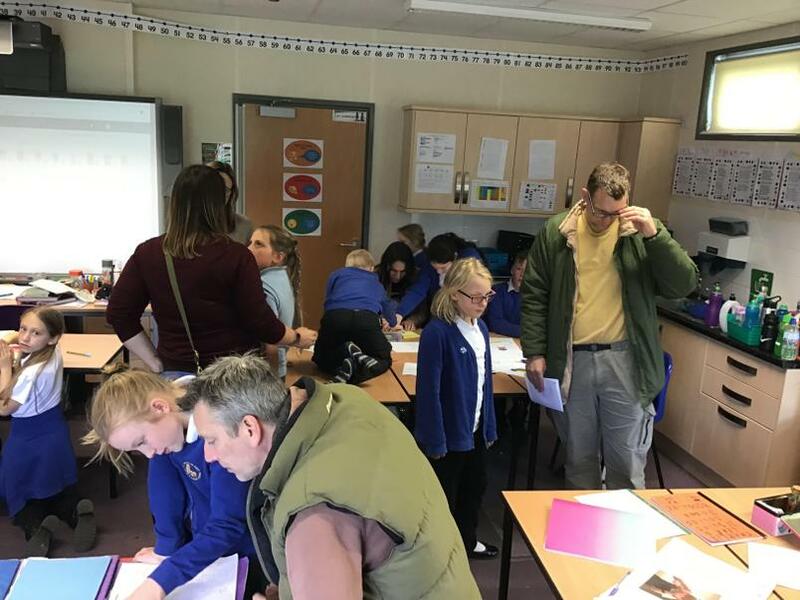 Thank you to all the families that joined us to celebrate our learning this half term! 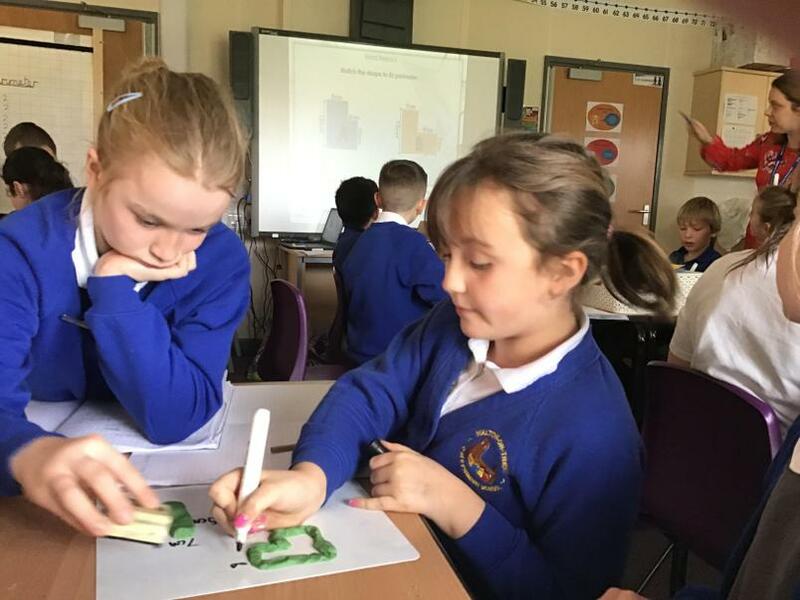 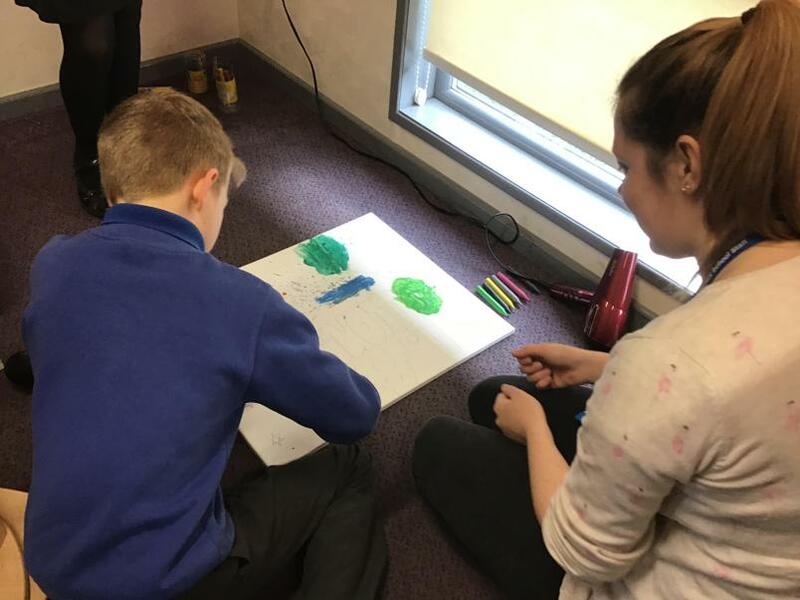 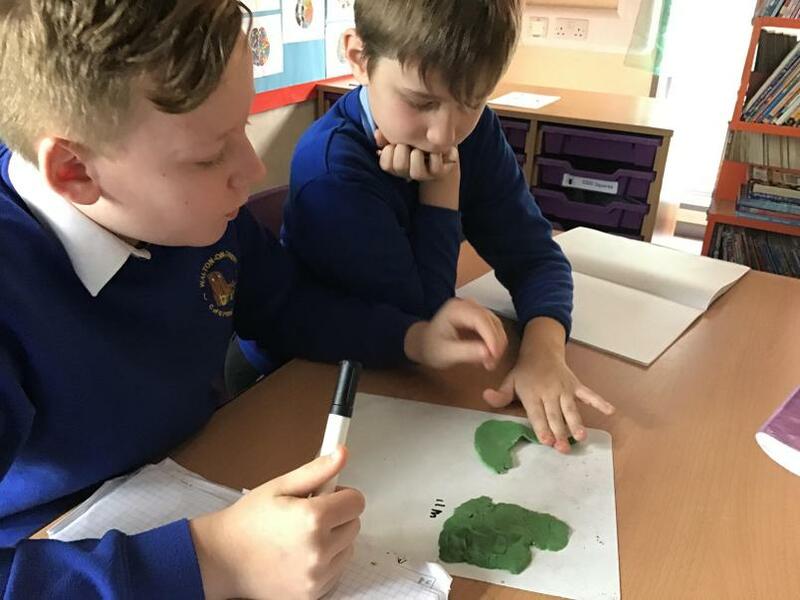 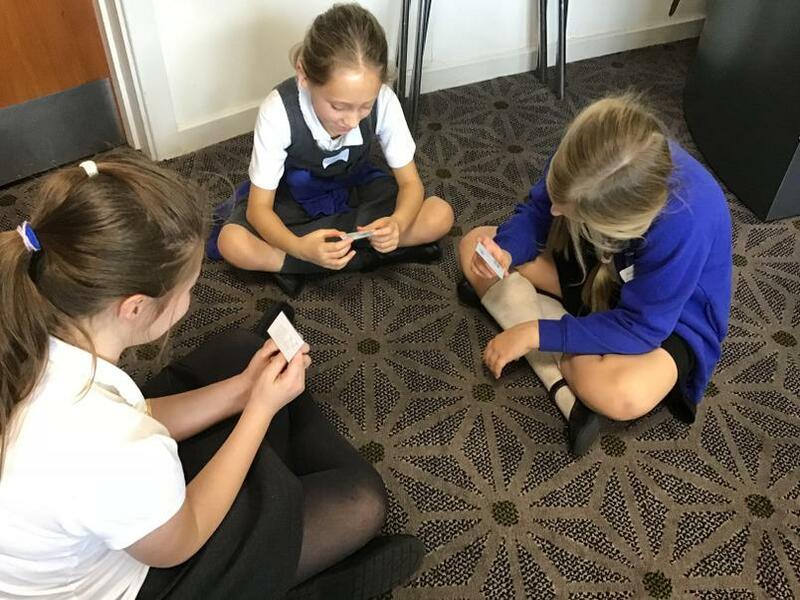 We have been learning formal methods of multiplication and division! 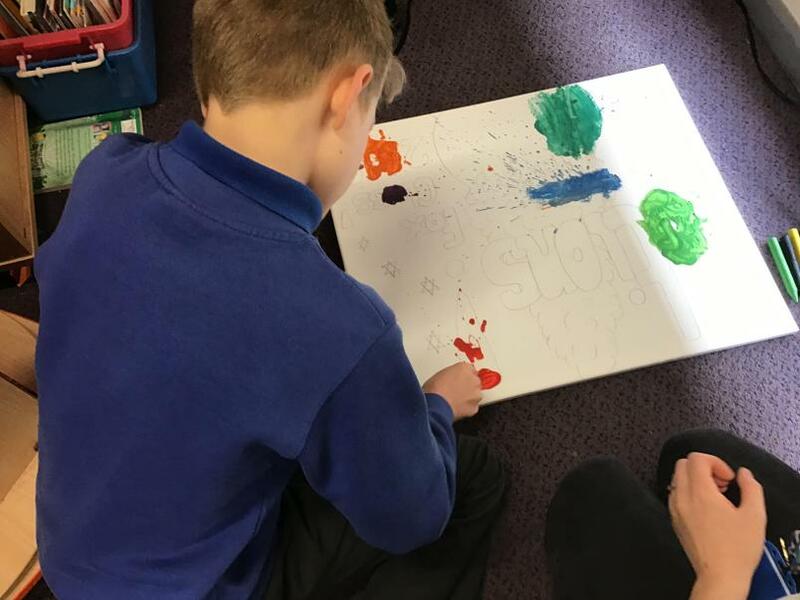 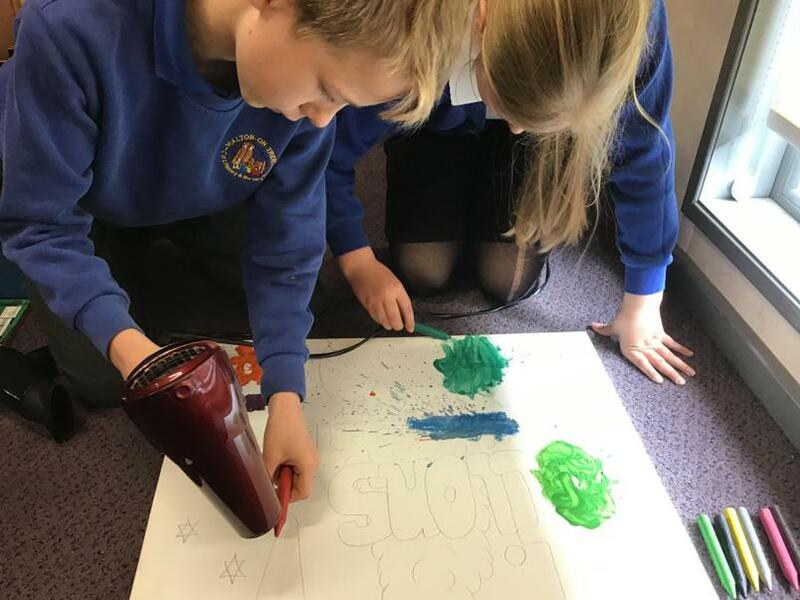 What an awesome canvas we’ve created using a hairdryer to melt wax crayons! 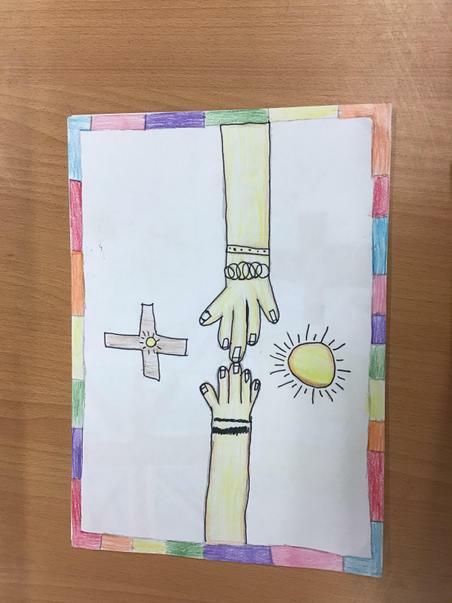 Learning about how Jesus learned and taught about kindness and respect! 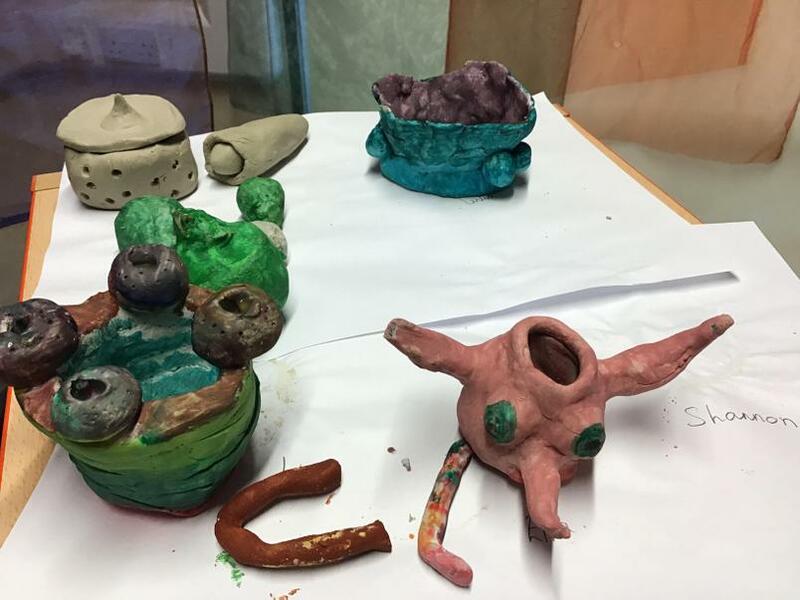 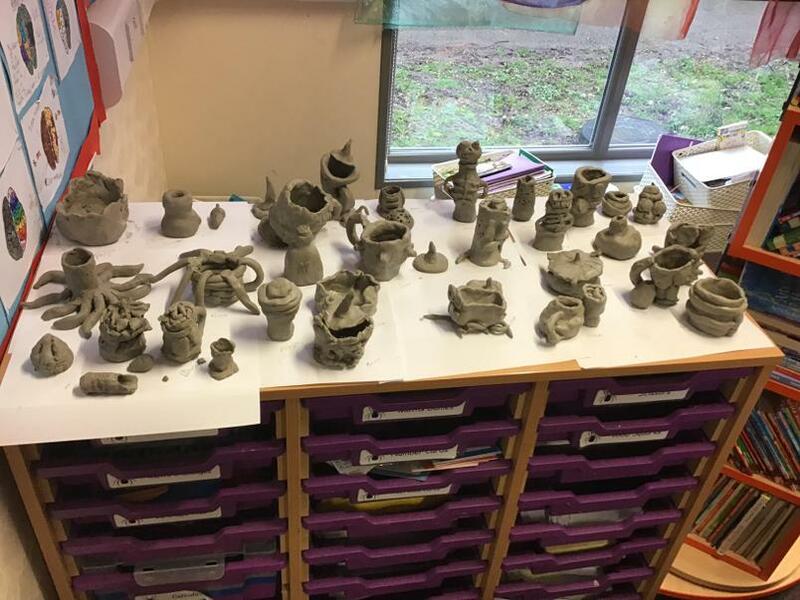 Our finished potion pots! 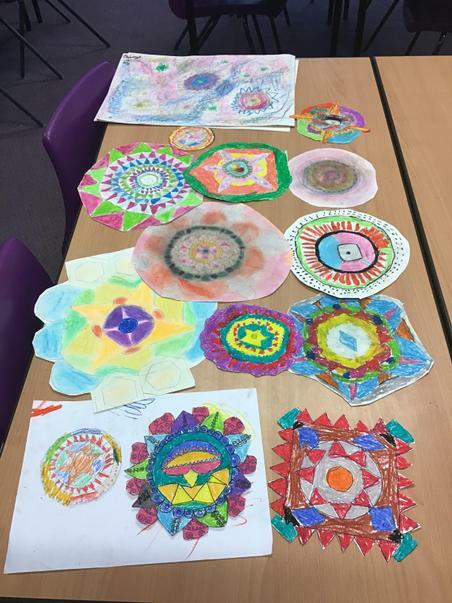 Some fantastic designs! 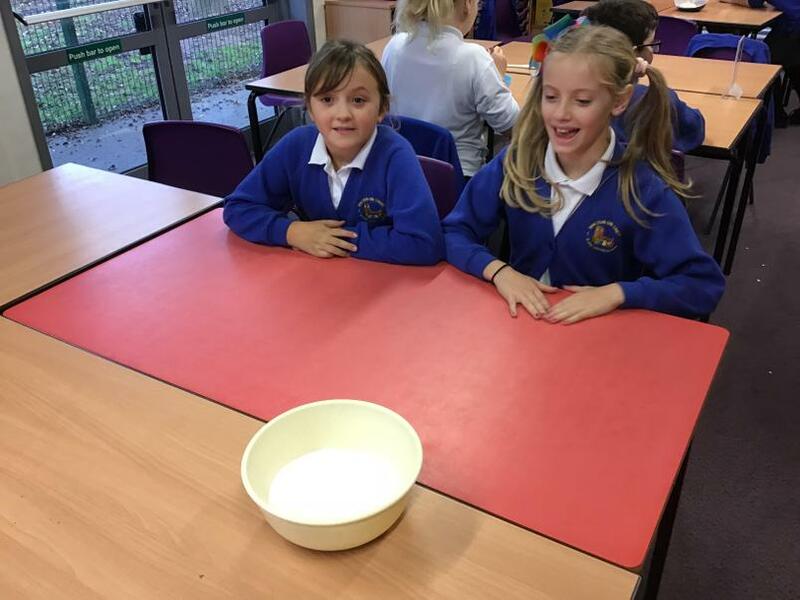 Investigating how liquids and solids can react to create a gas! 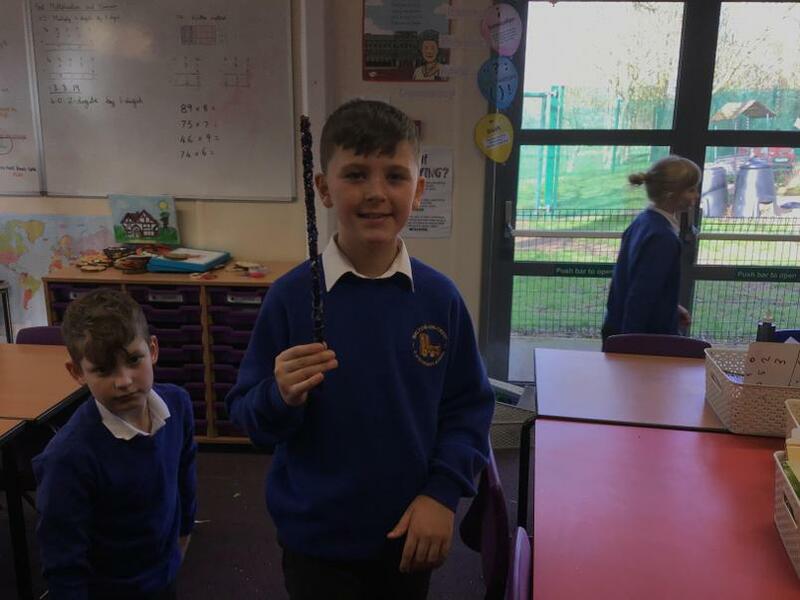 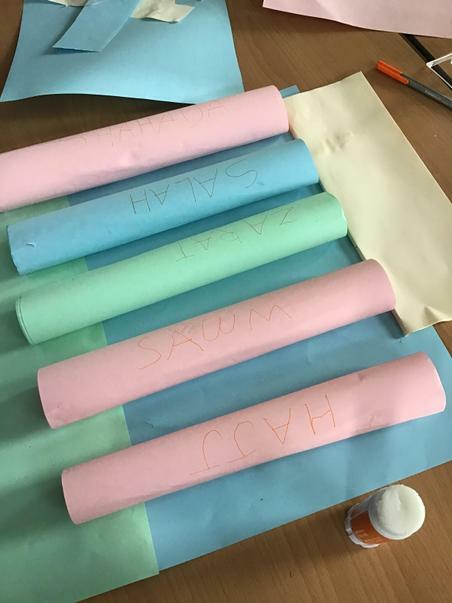 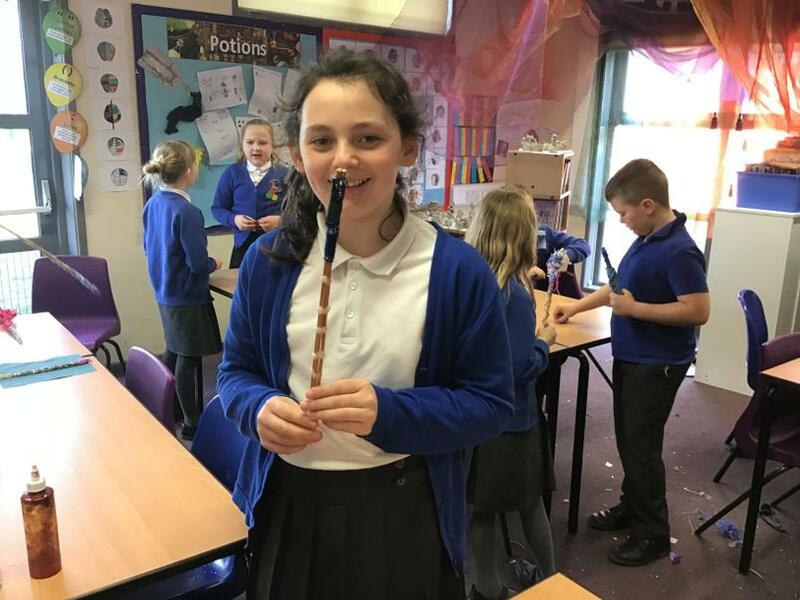 We’ve made wands ready for our Potions lesson tomorrow! 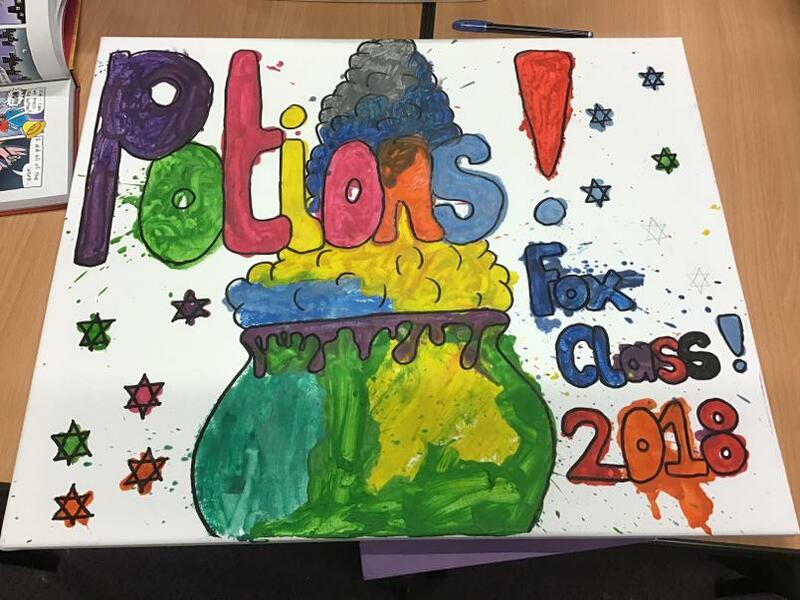 Mrs Stewart was very busy concocting potions at the weekend. 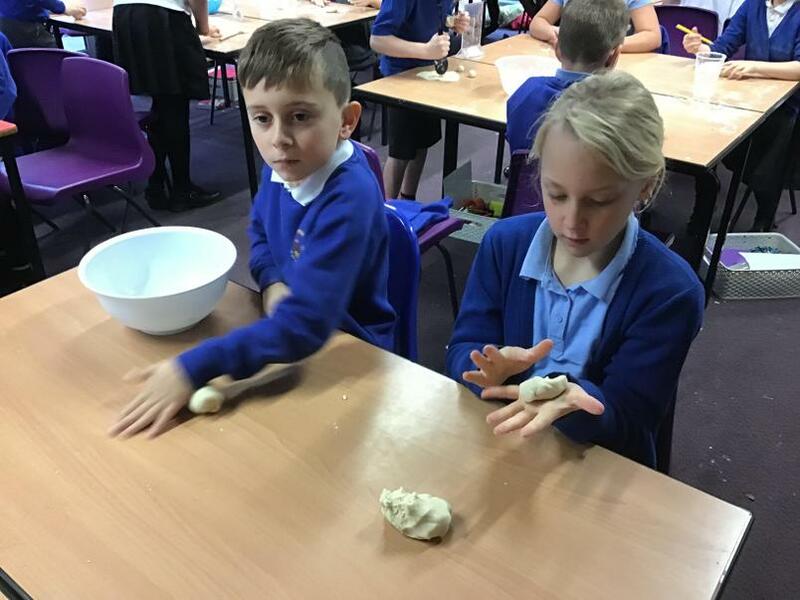 I wonder what sorts of recipes we’re going to write? 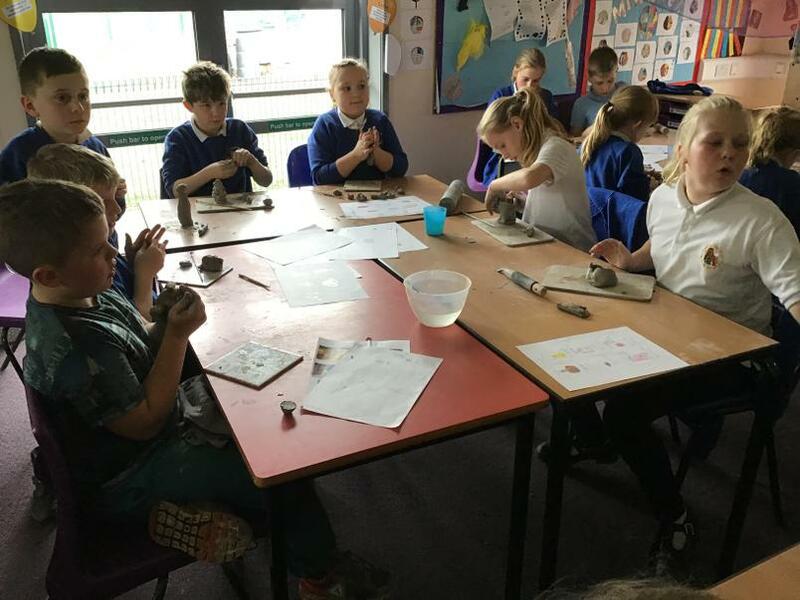 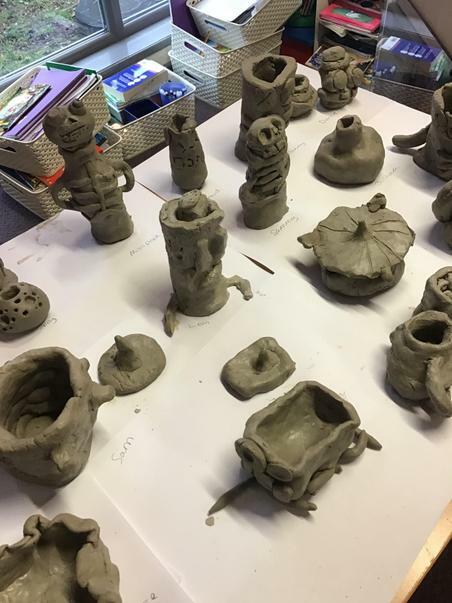 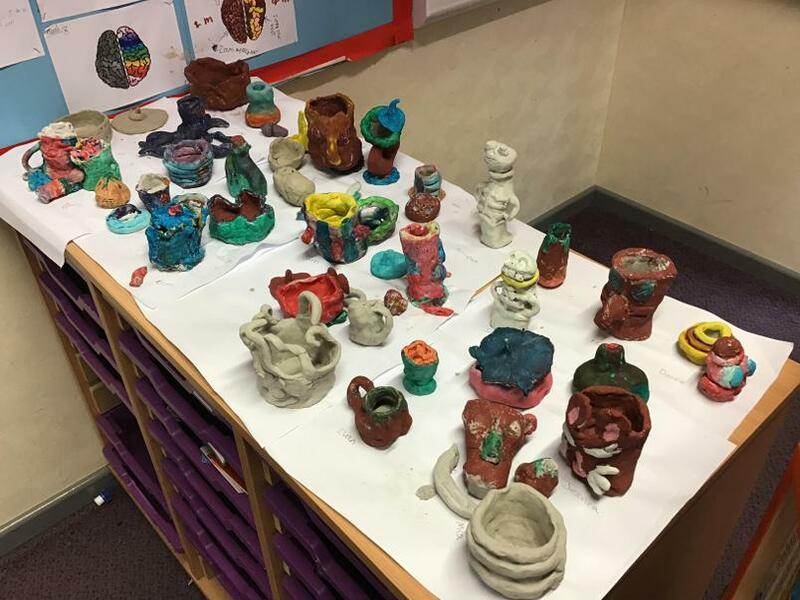 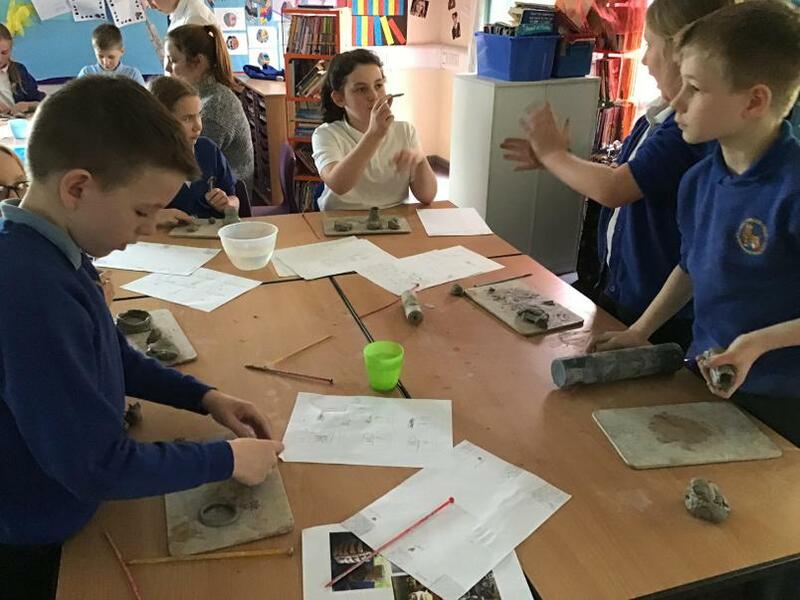 We had a fantastic time getting messy with clay this afternoon and we produced brilliant potion pots! 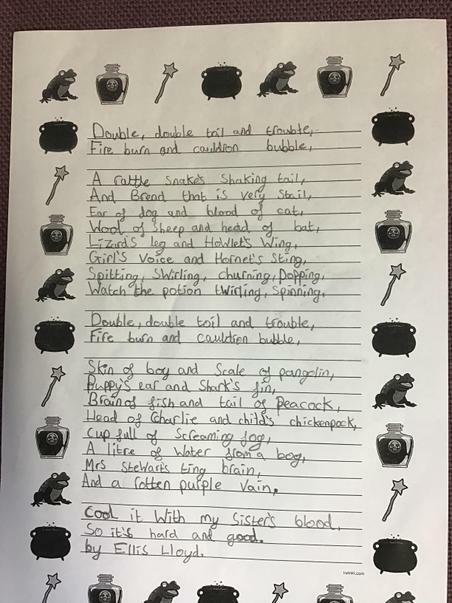 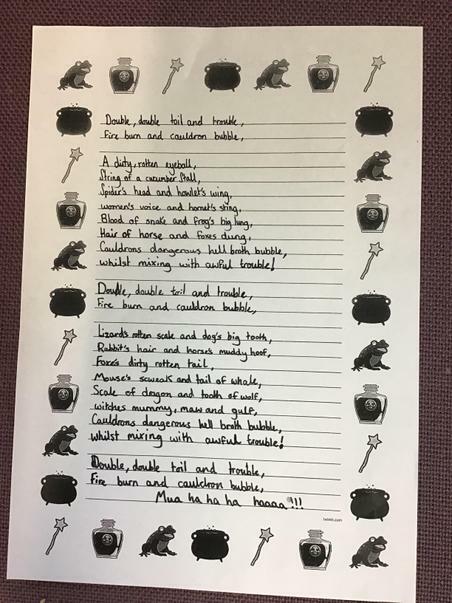 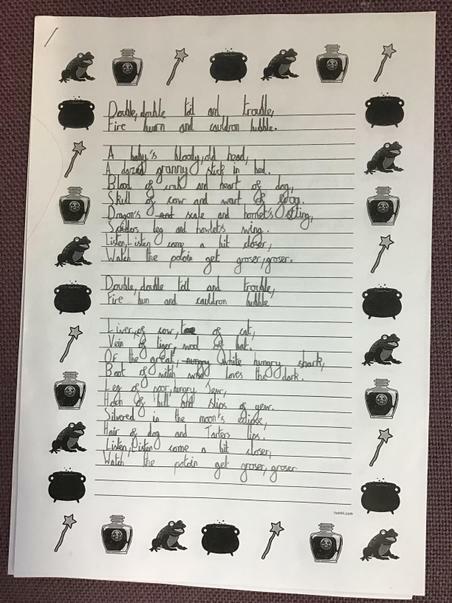 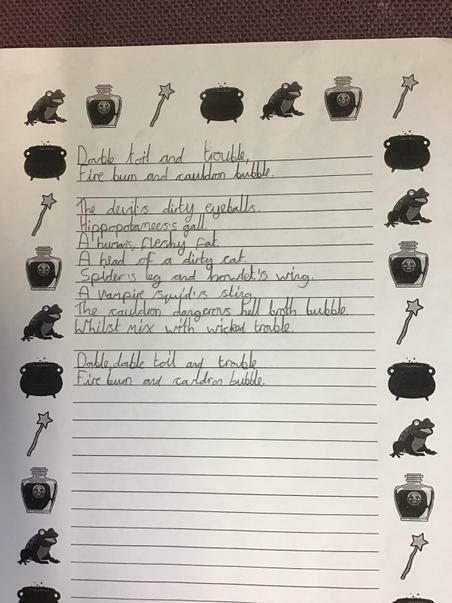 Read some of our fantastically gruesome potion poems! 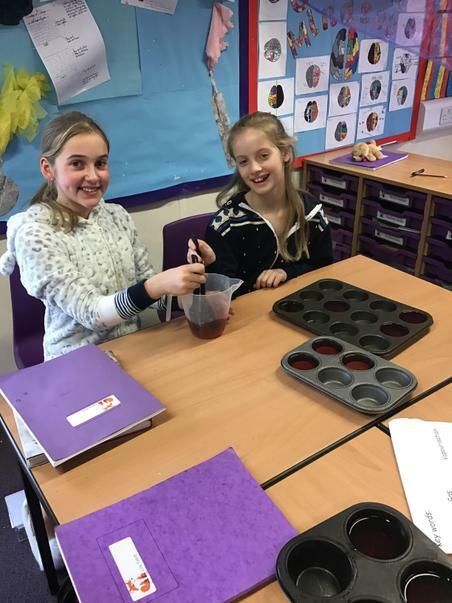 We loved learning about changes of state this afternoon with ice cubes, jelly and chocolate! 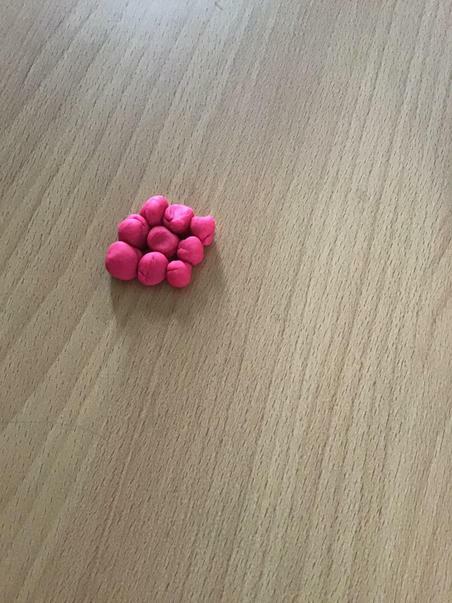 Great news everyone! 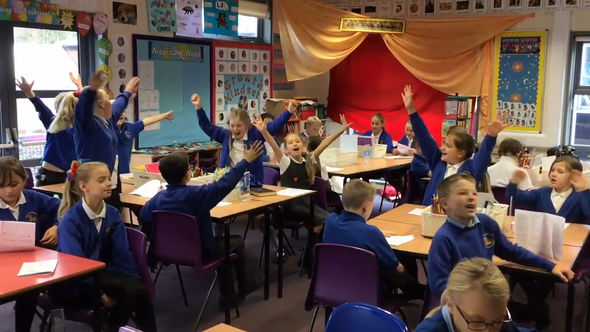 Our video of Calon Lan has been retweeted by Wynne Evans (Go Compare man)! 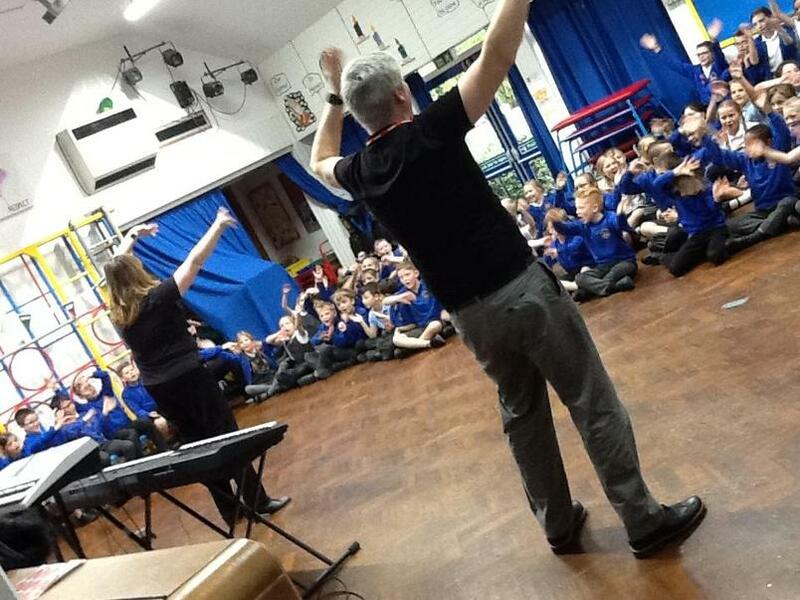 How amazing are we! 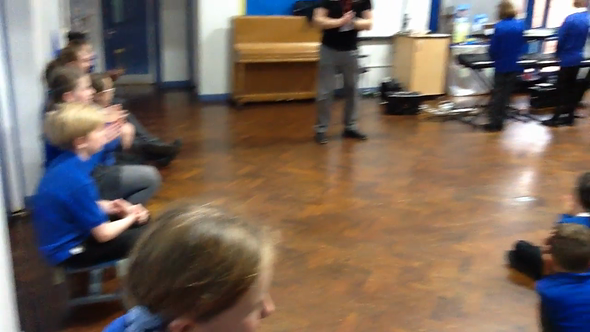 We learnt to sing in Welsh to celebrate St. David’s Day! 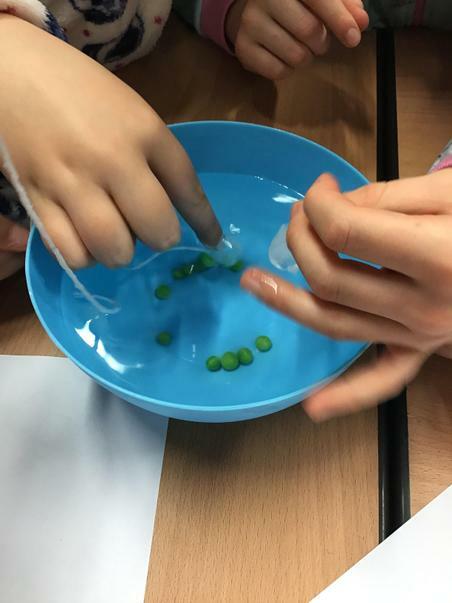 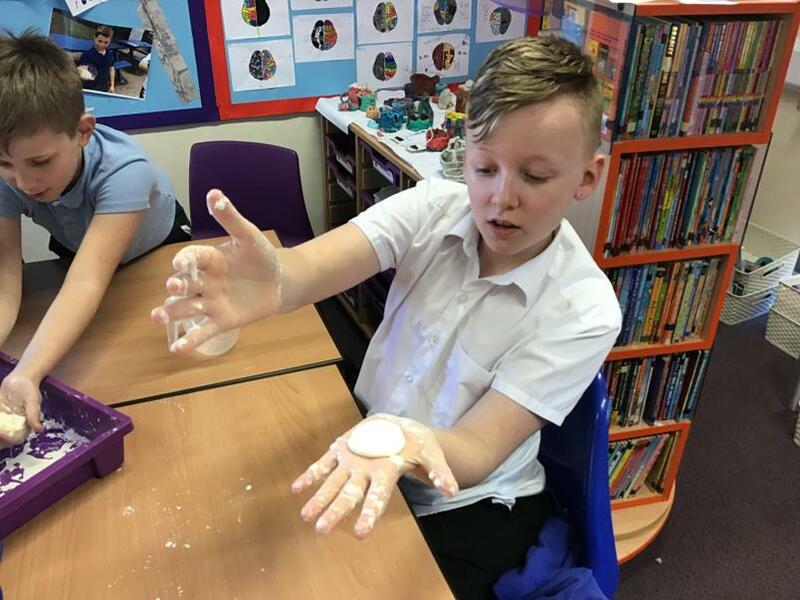 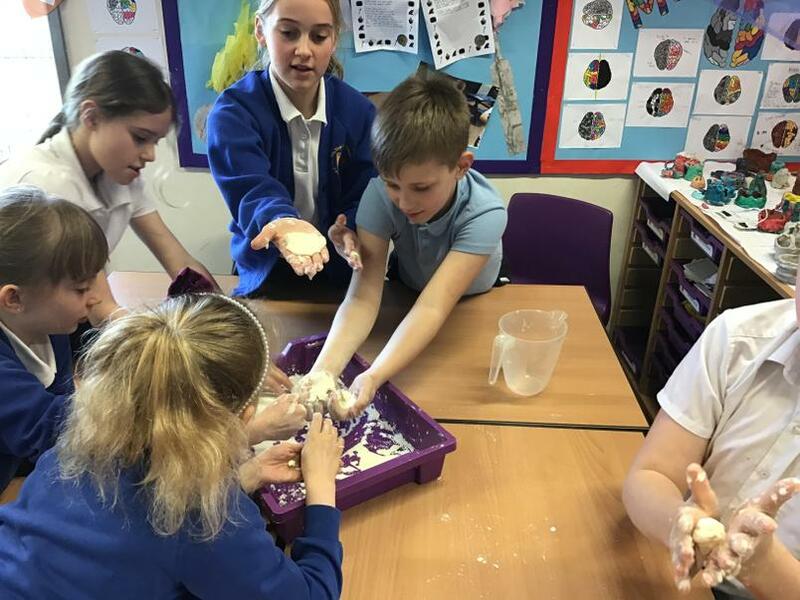 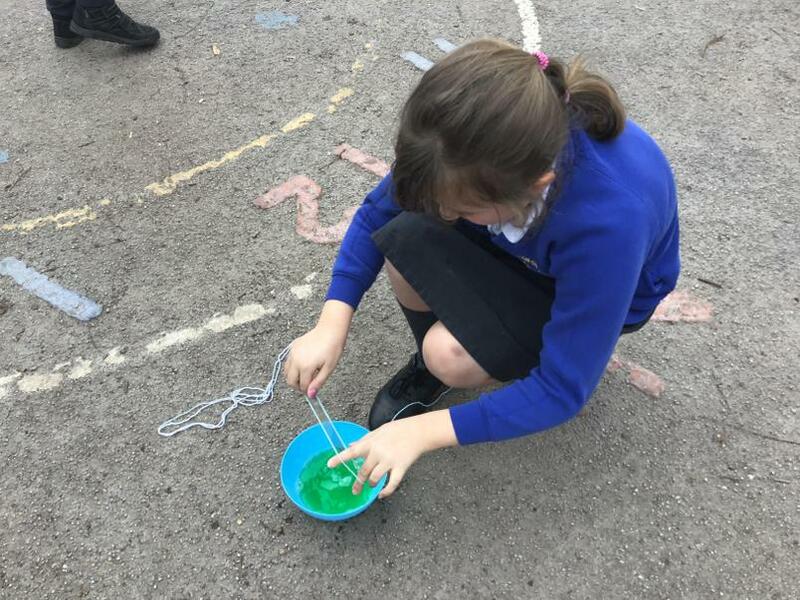 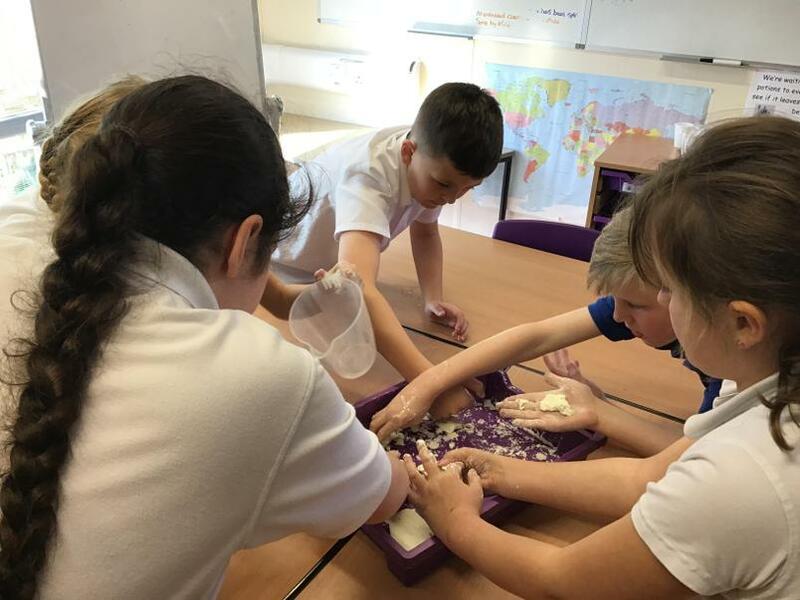 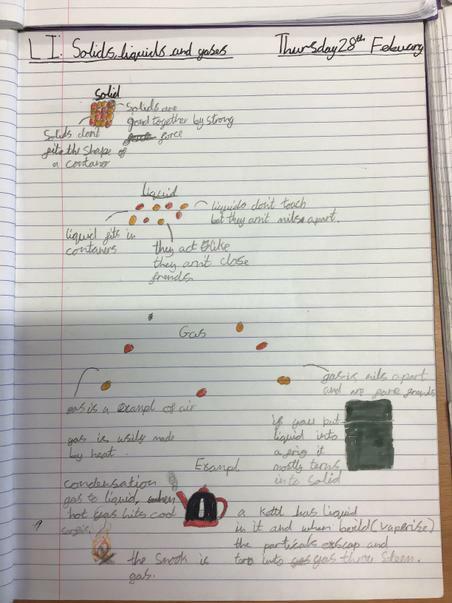 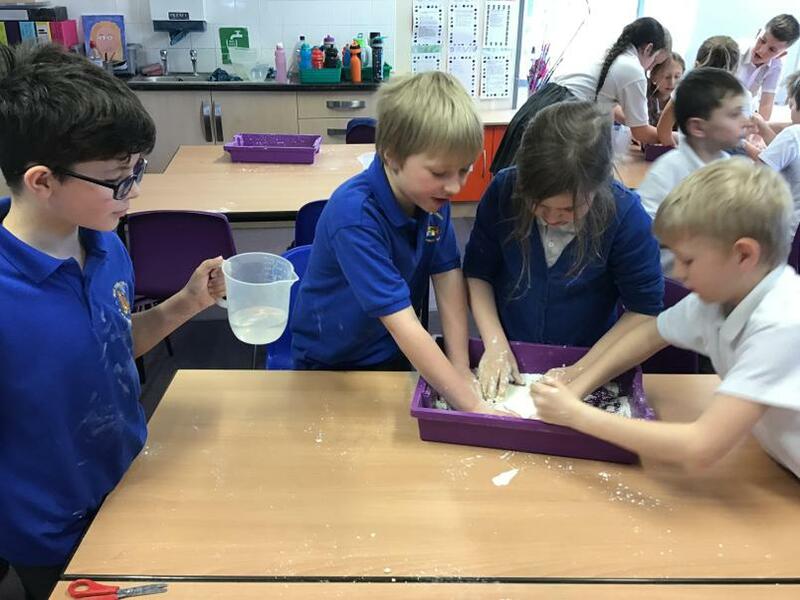 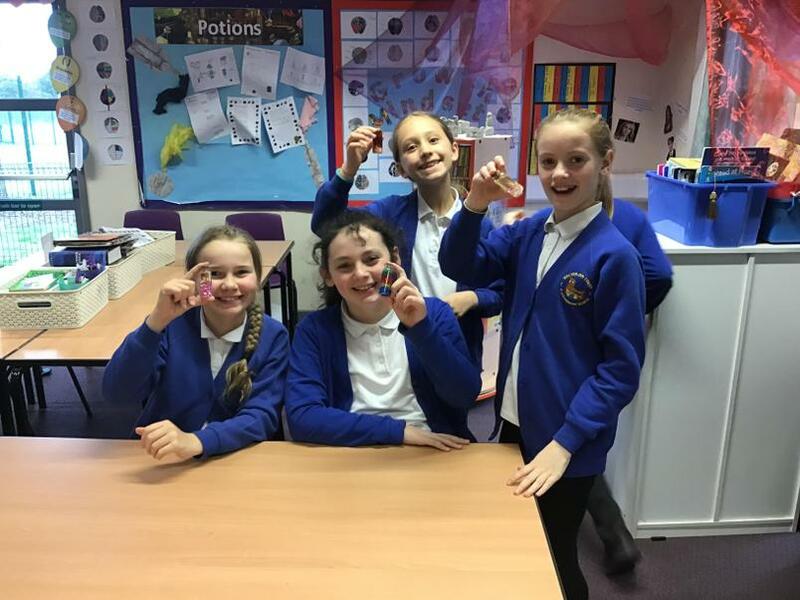 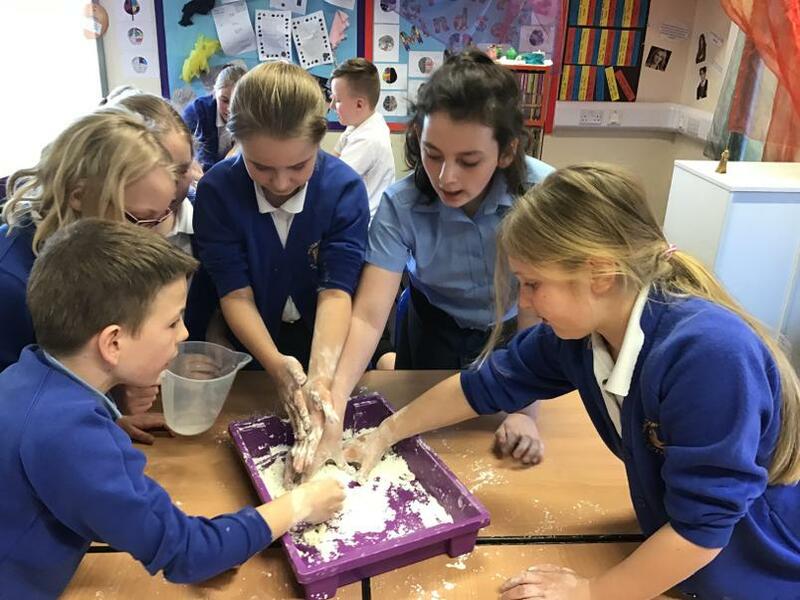 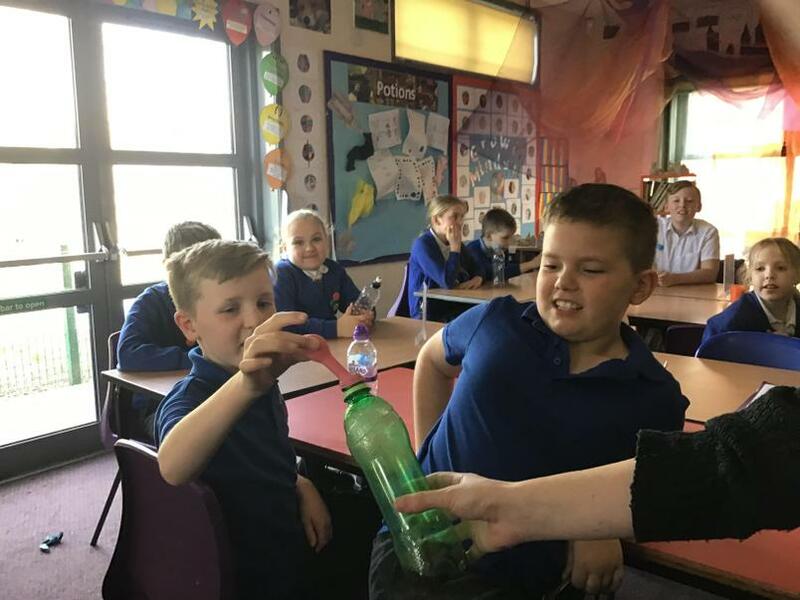 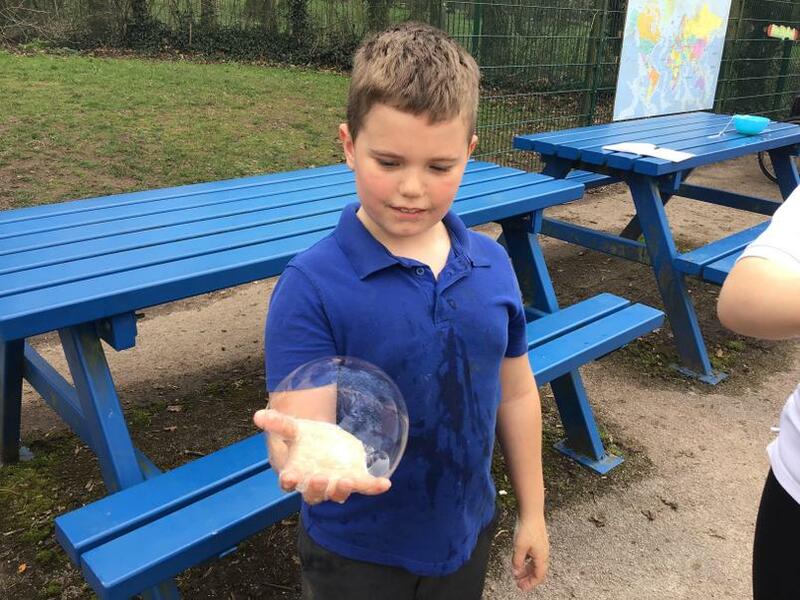 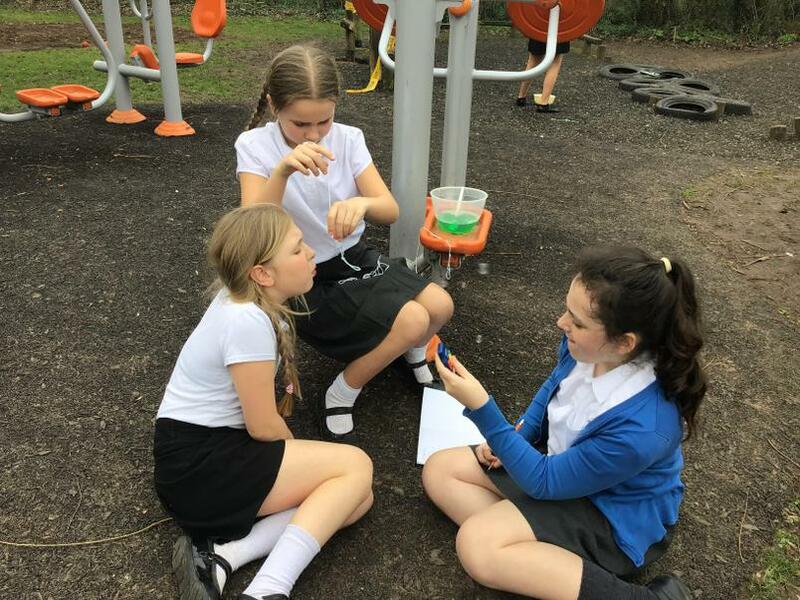 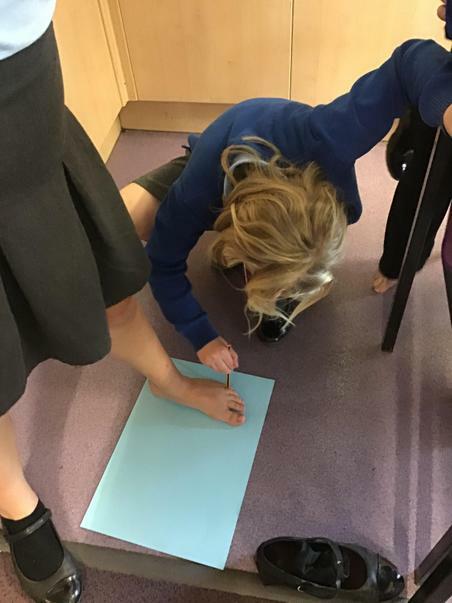 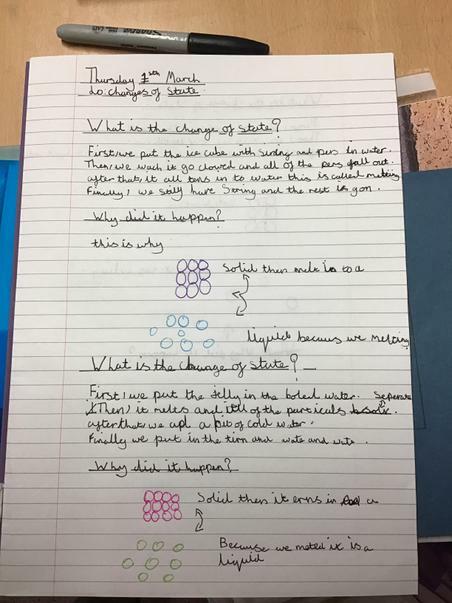 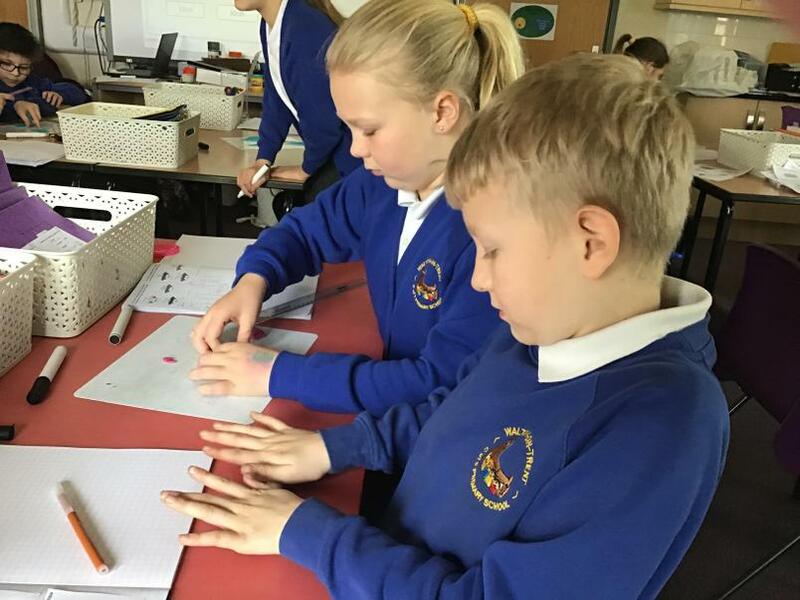 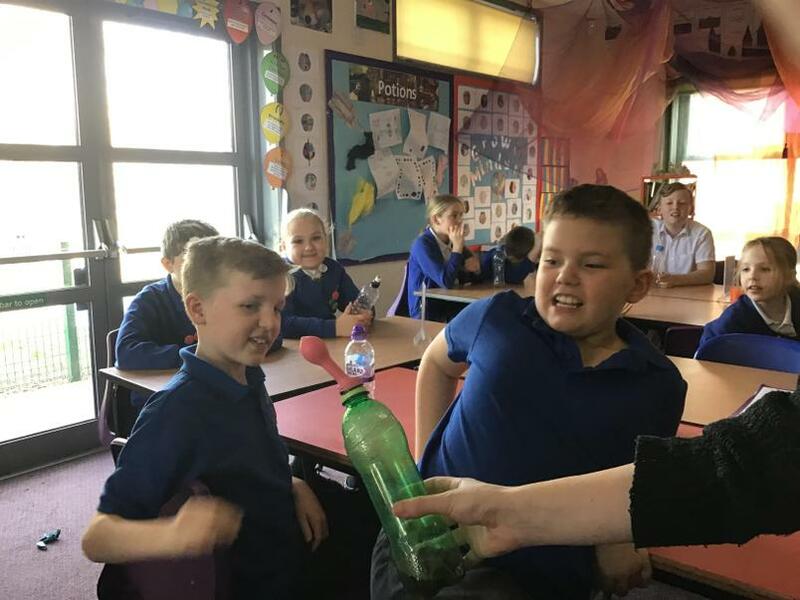 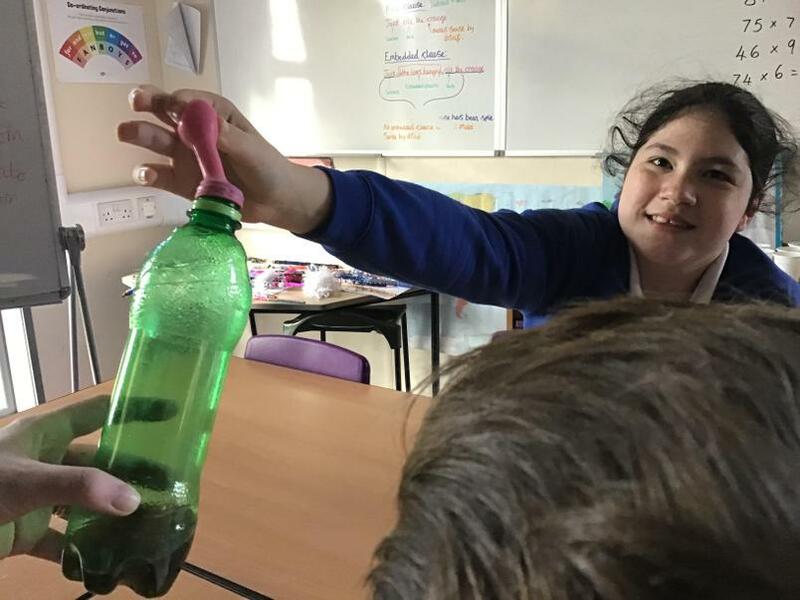 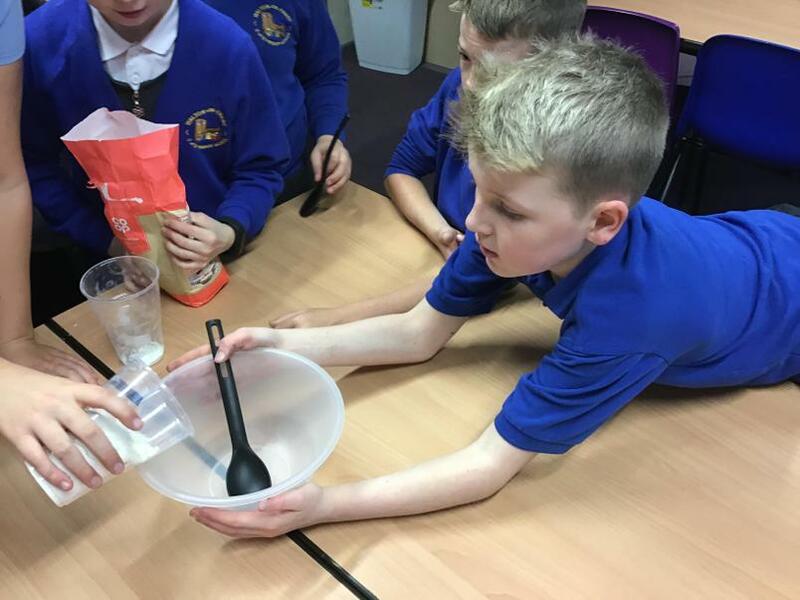 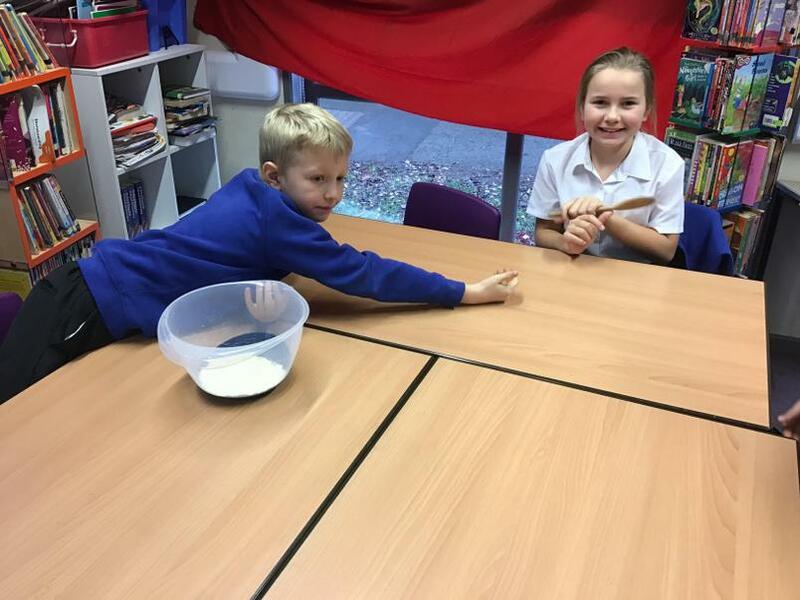 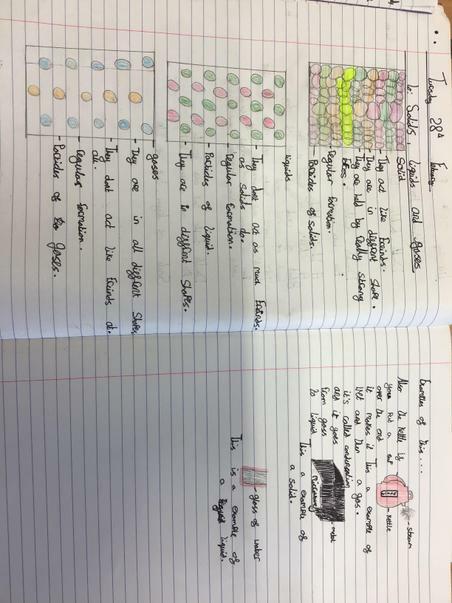 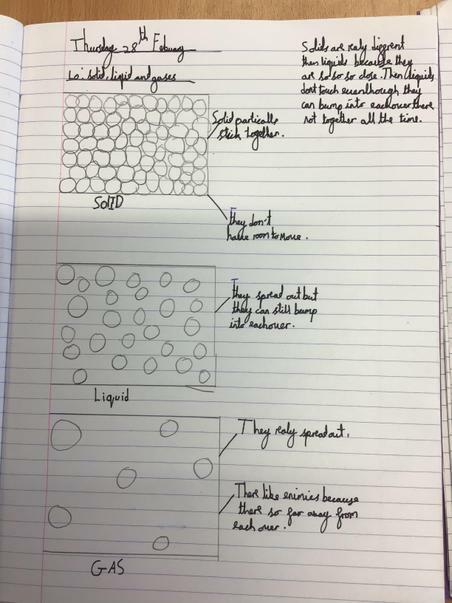 Brilliant science lesson learning about particles in solids, liquids and gases! 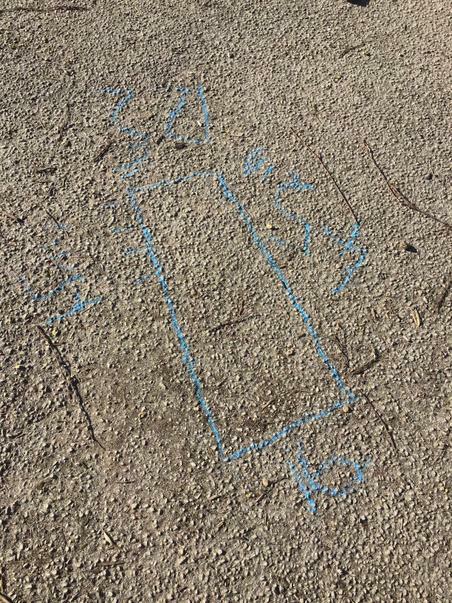 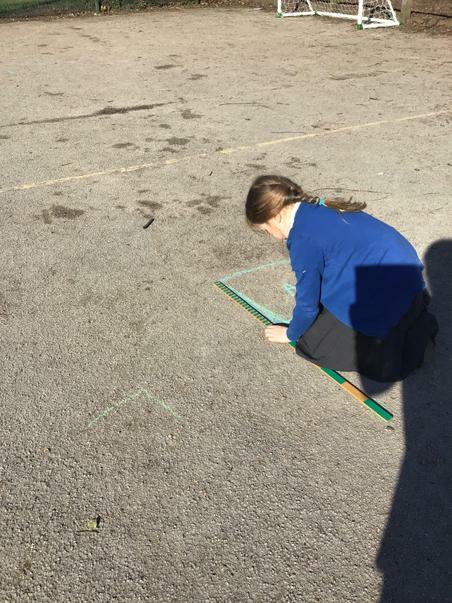 Perimeter on the playground - fantastic work! 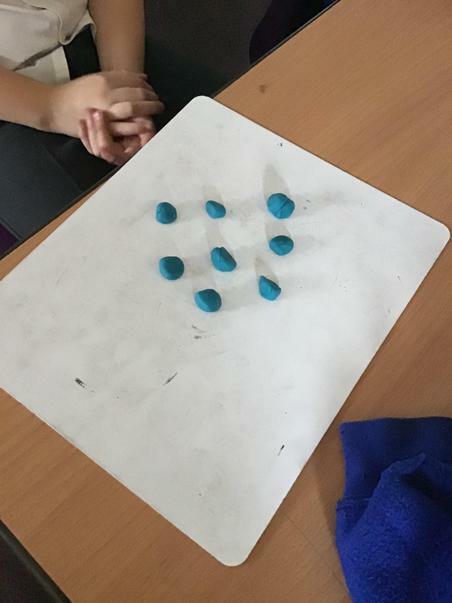 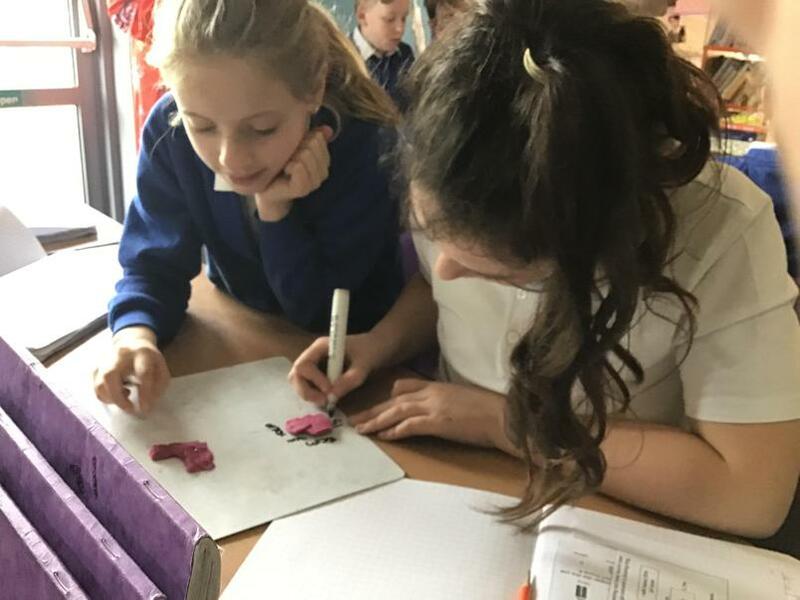 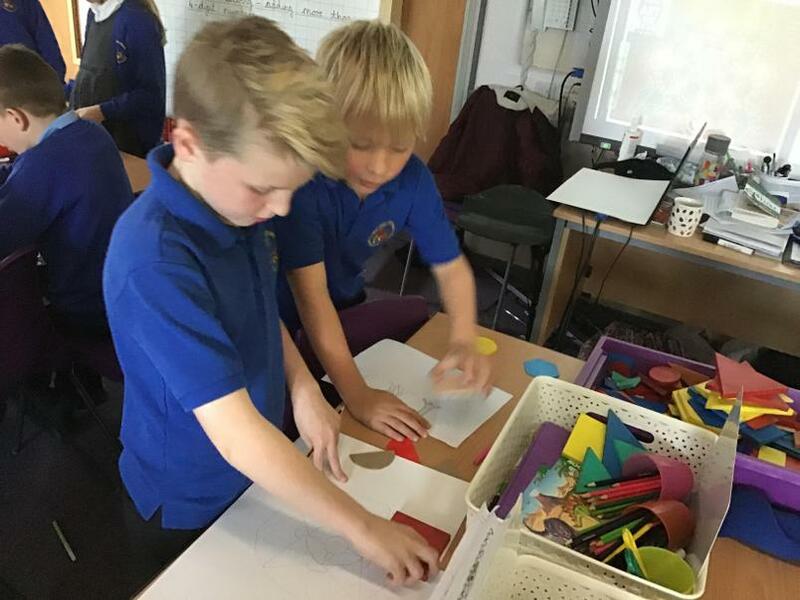 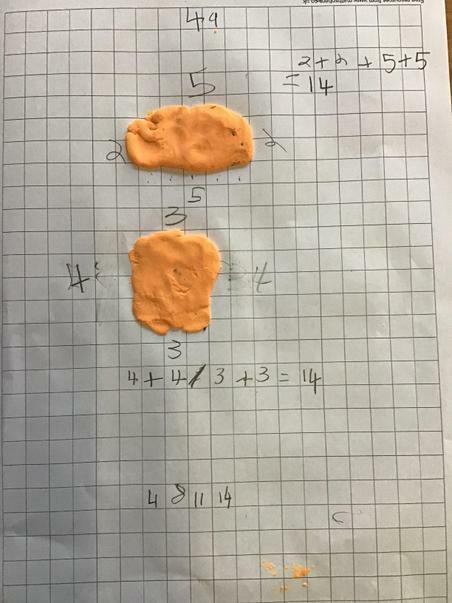 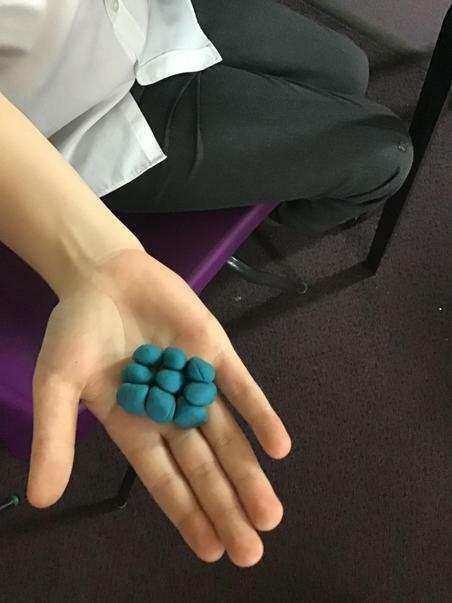 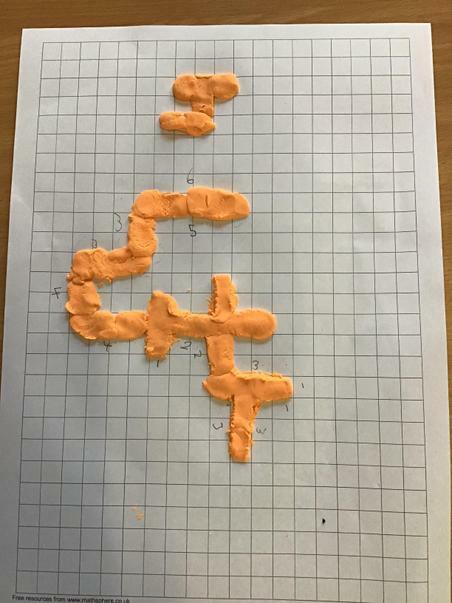 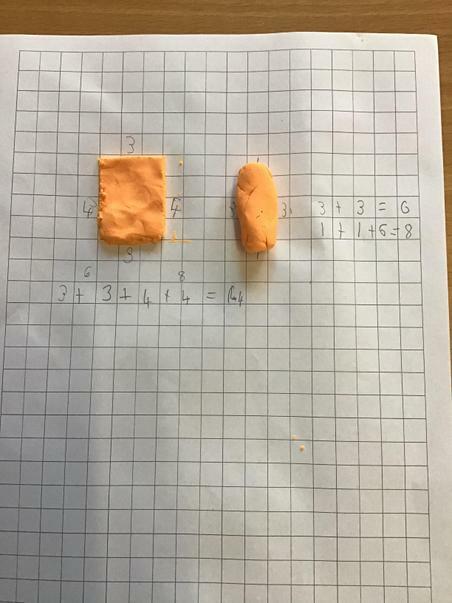 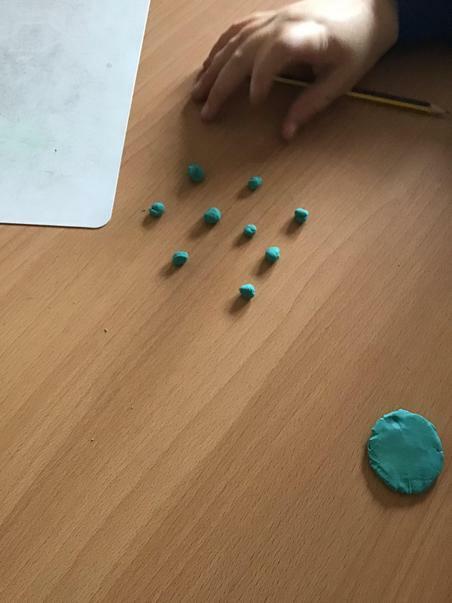 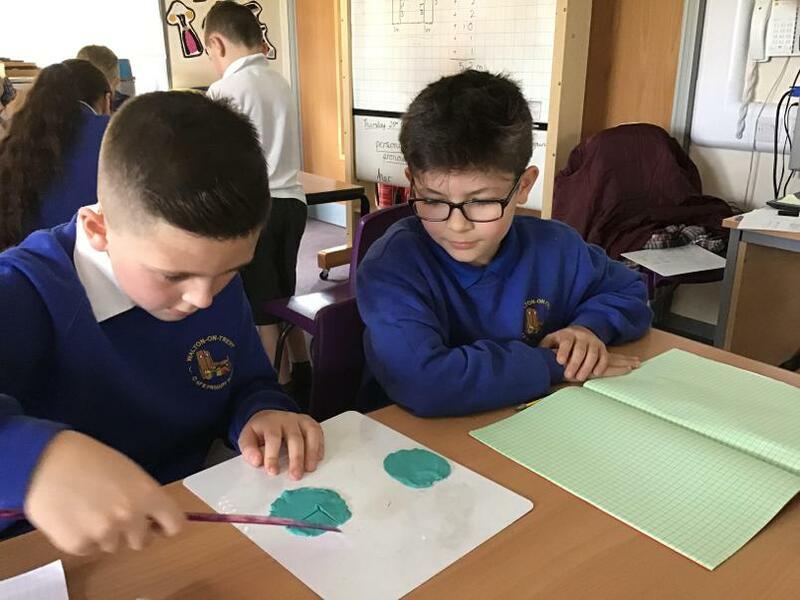 Year 4 loved learning about perimeter with play dough! 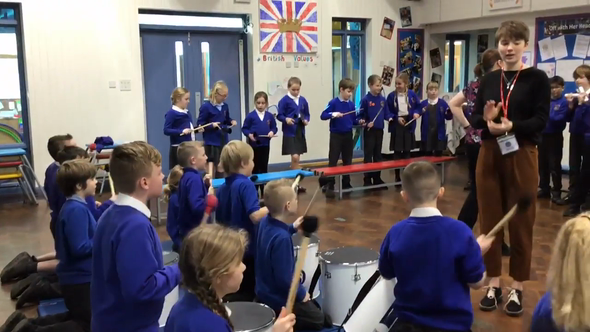 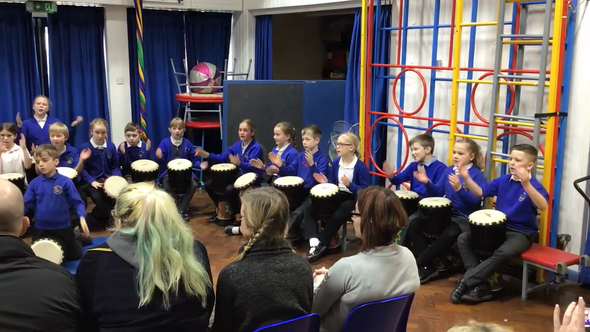 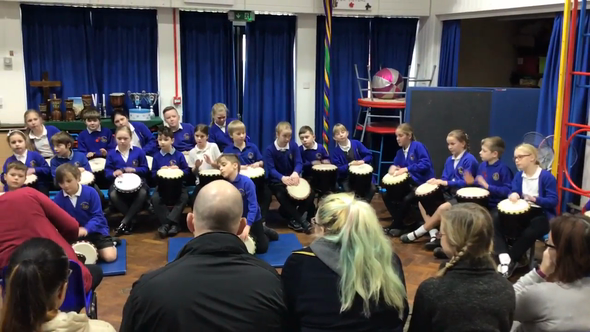 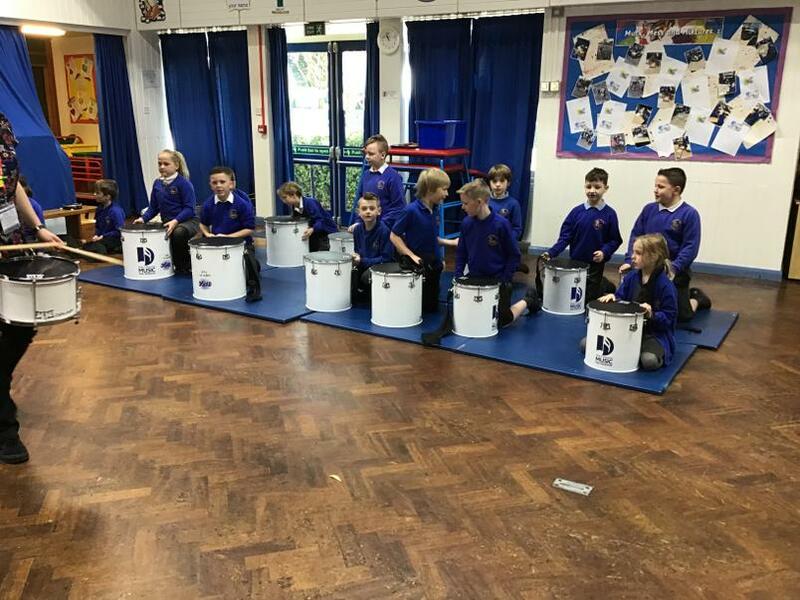 We loved our first session of Samba band. 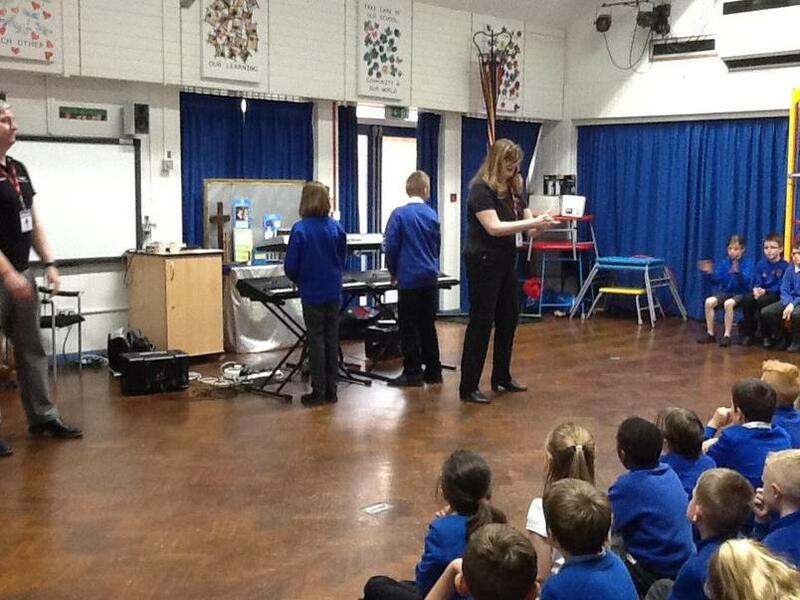 It was very noisy! 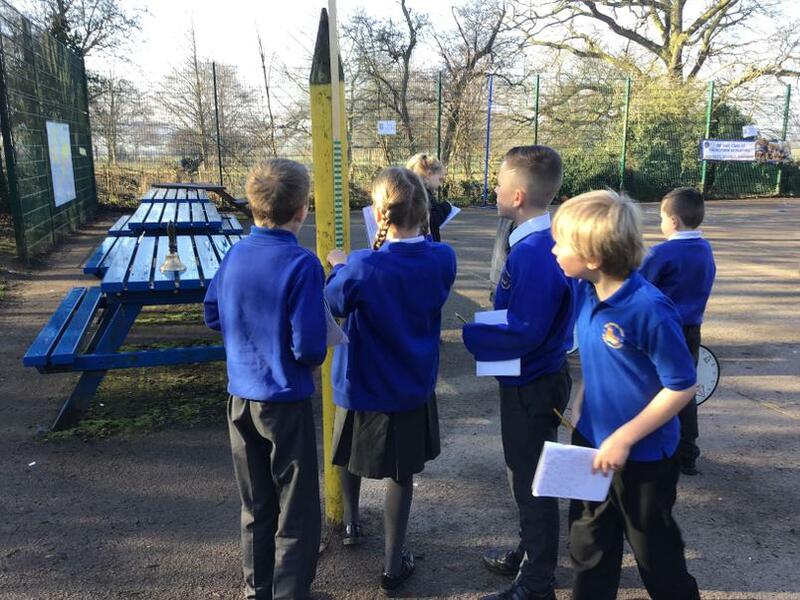 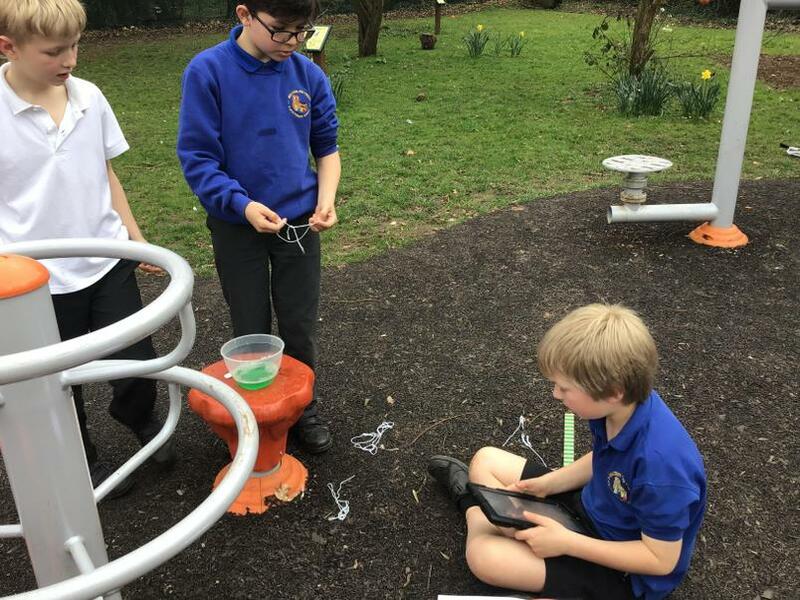 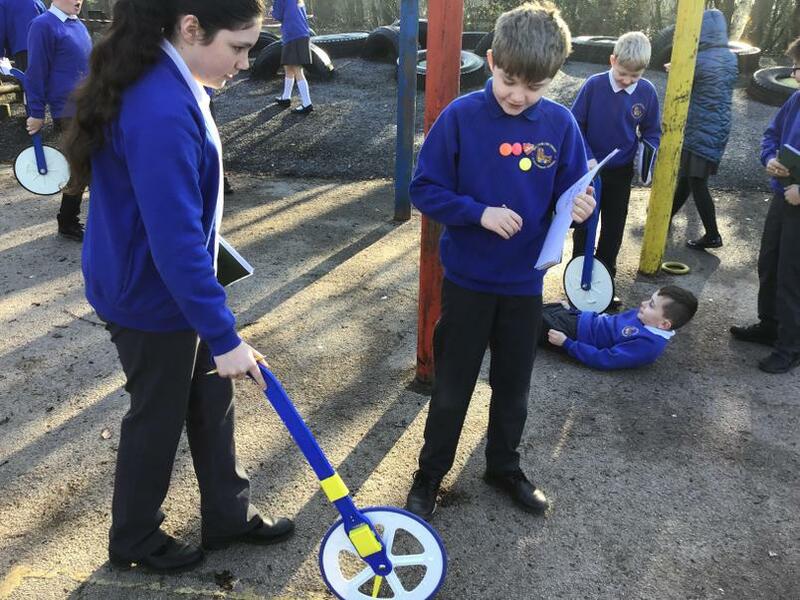 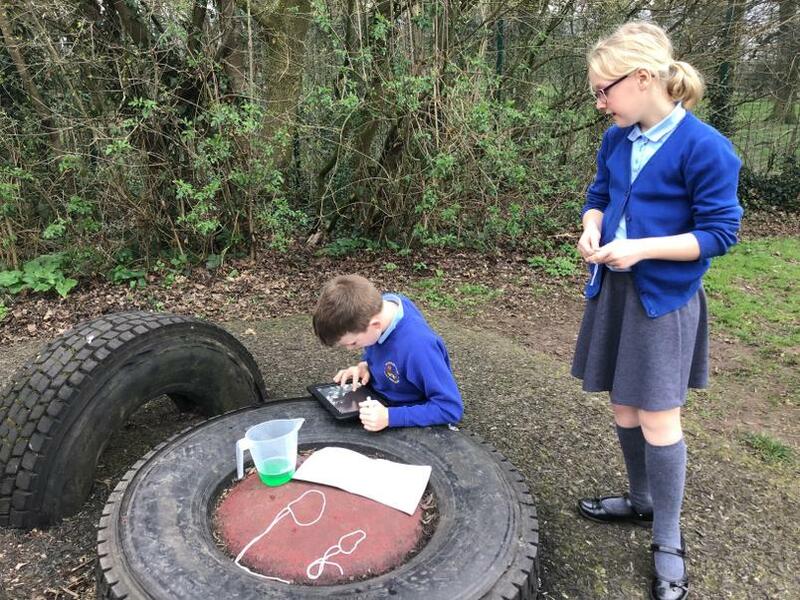 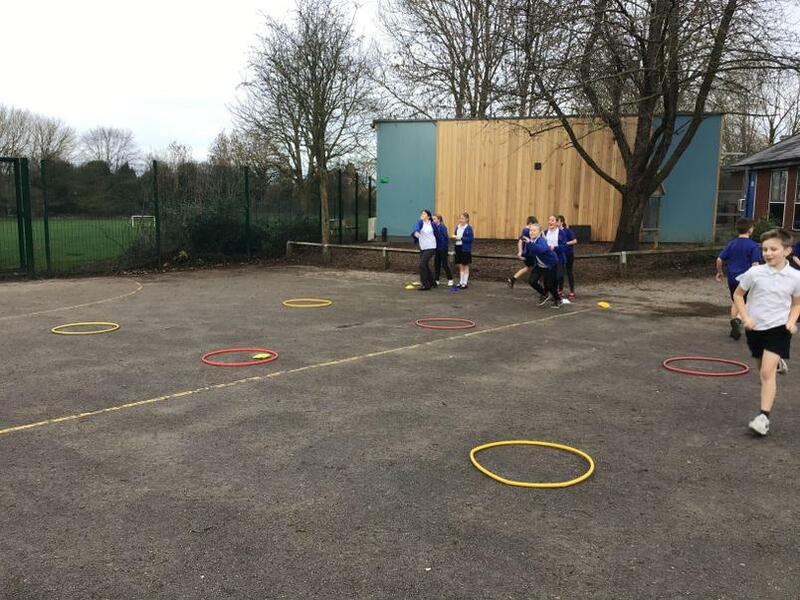 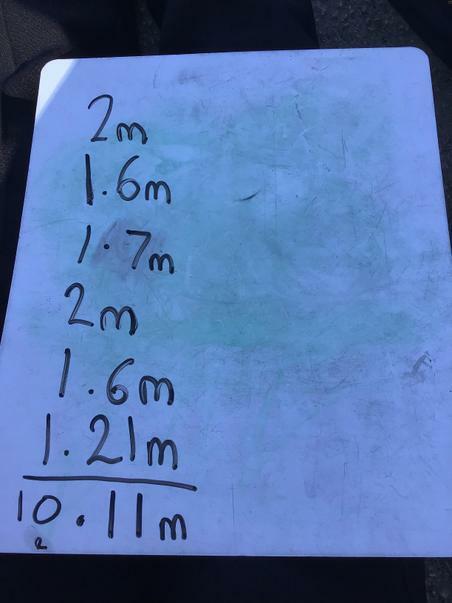 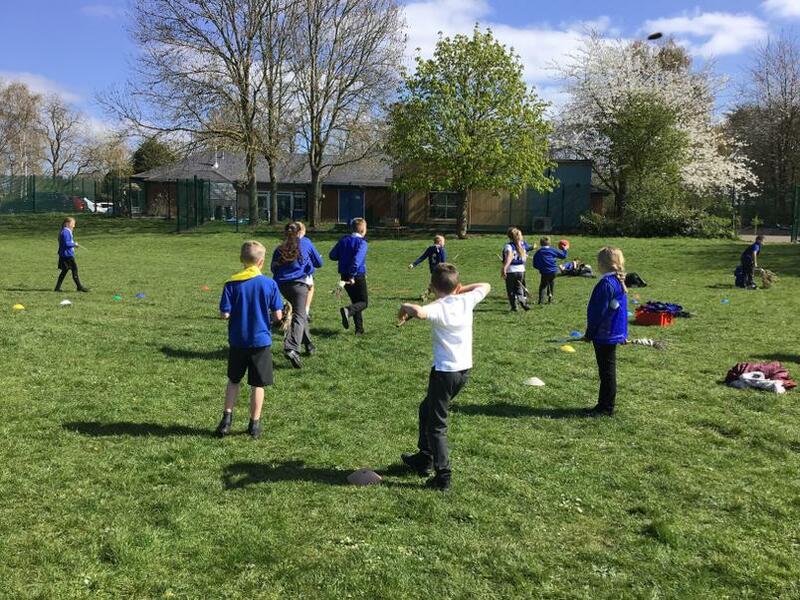 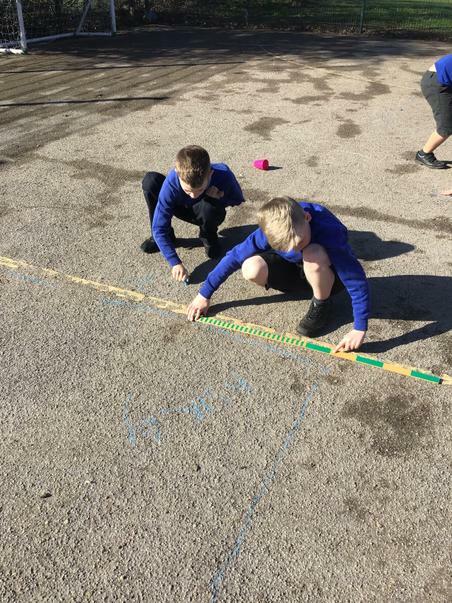 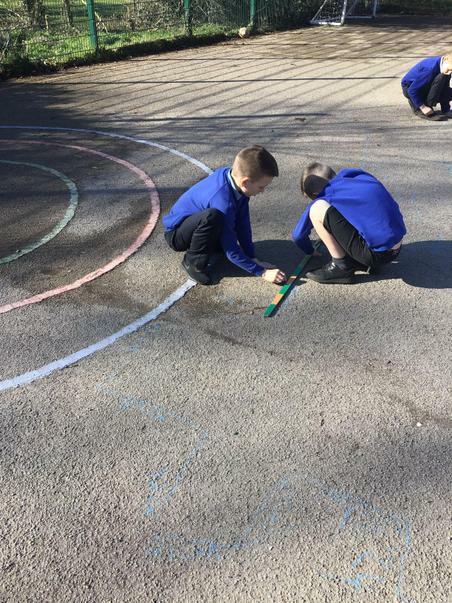 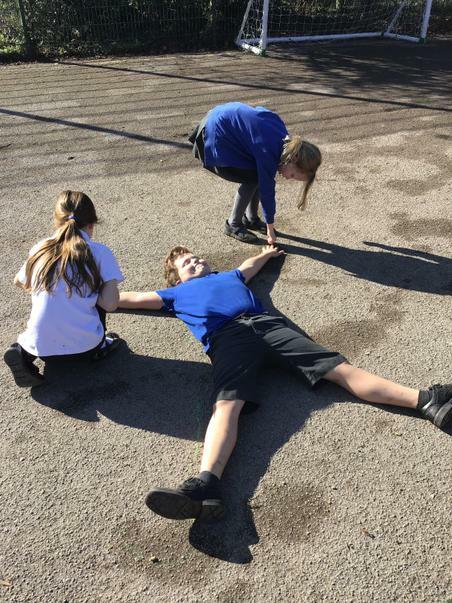 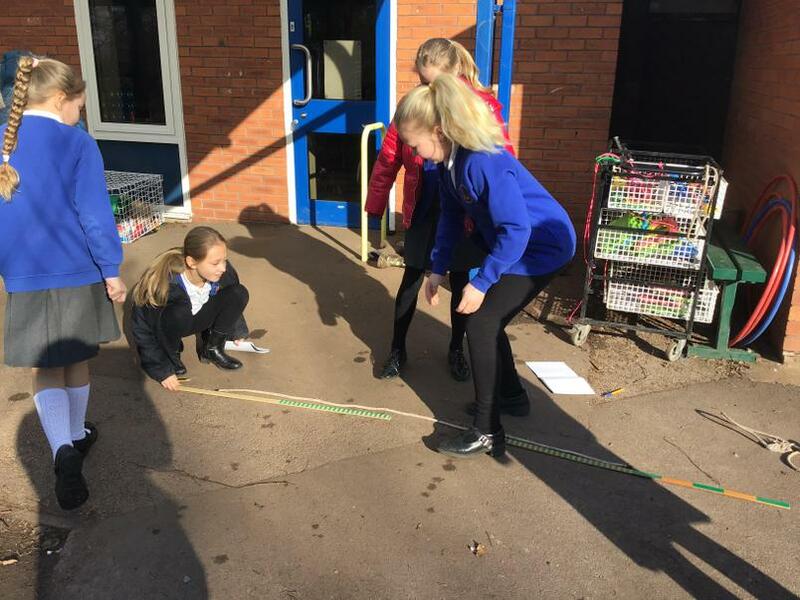 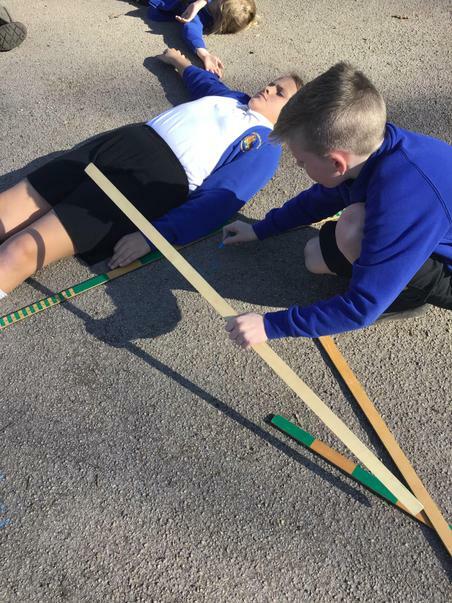 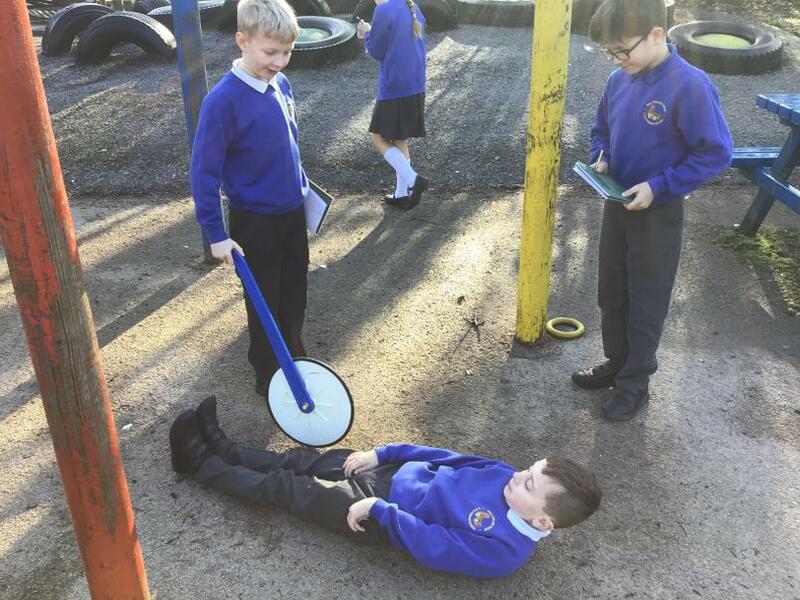 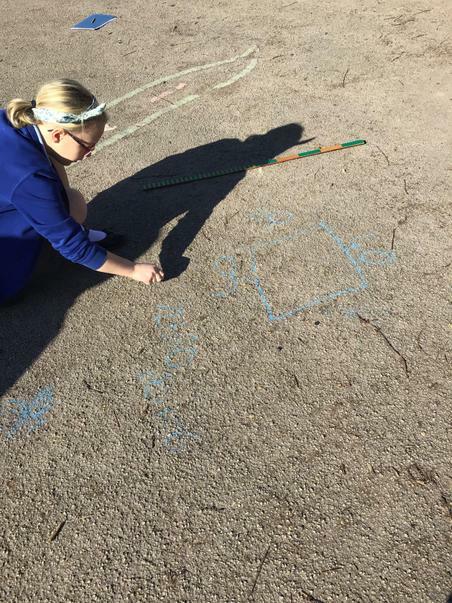 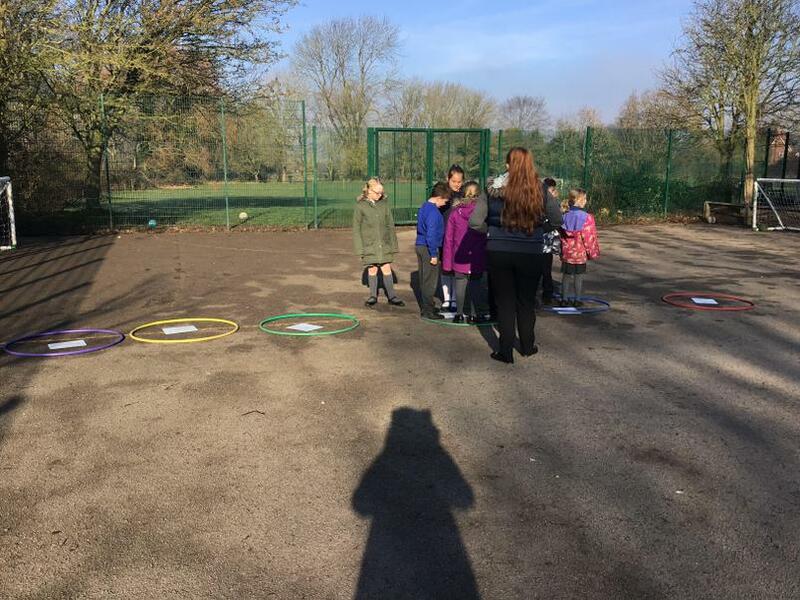 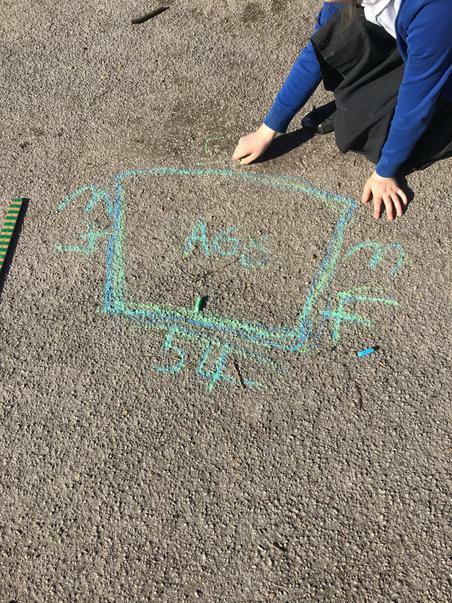 Fantastic time learning about length, perimeter and converting units outside in the sunshine! 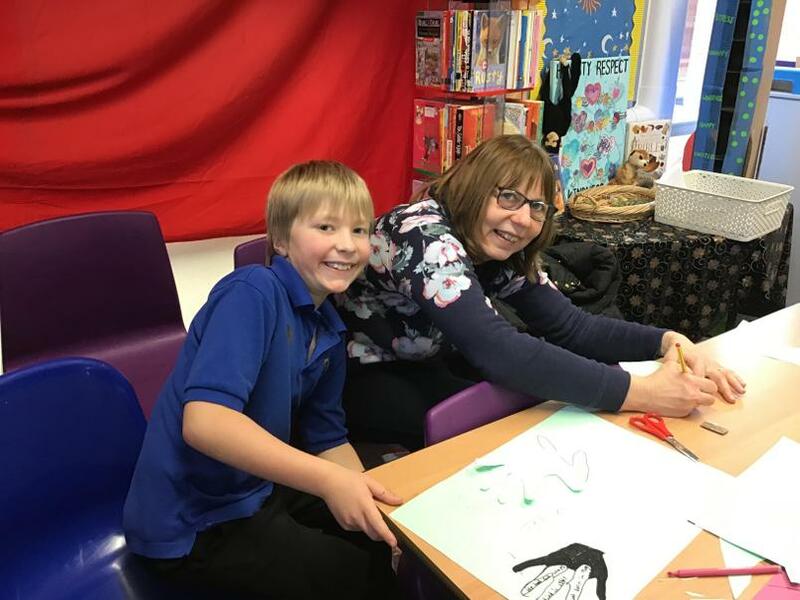 What a fantastic afternoon we had with our families! 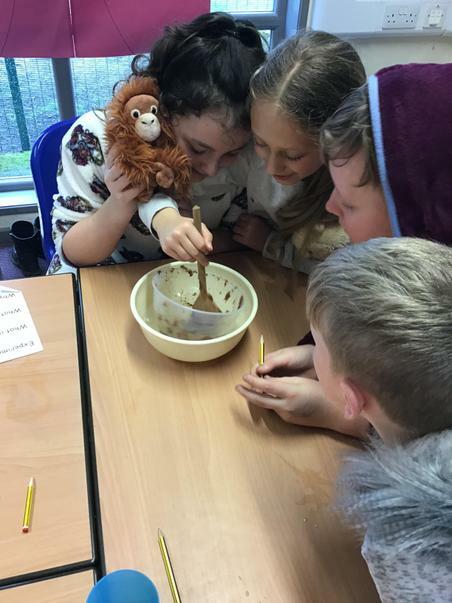 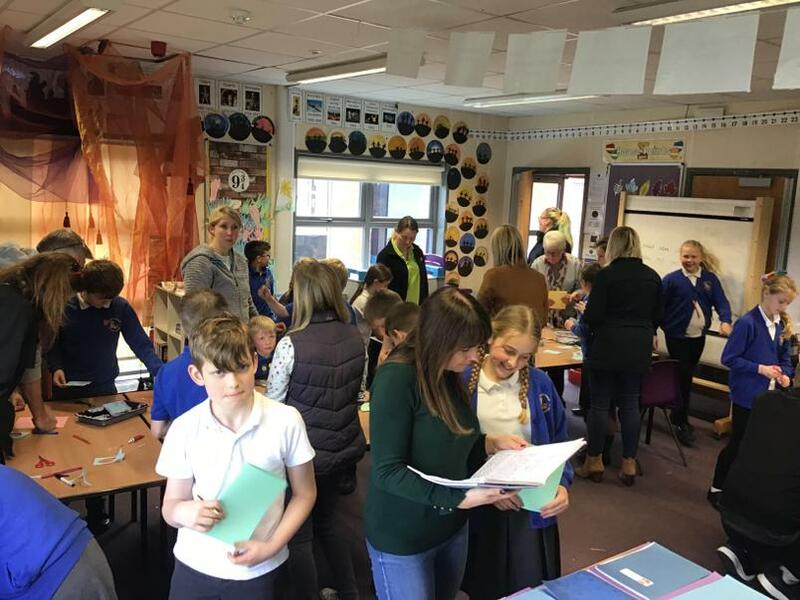 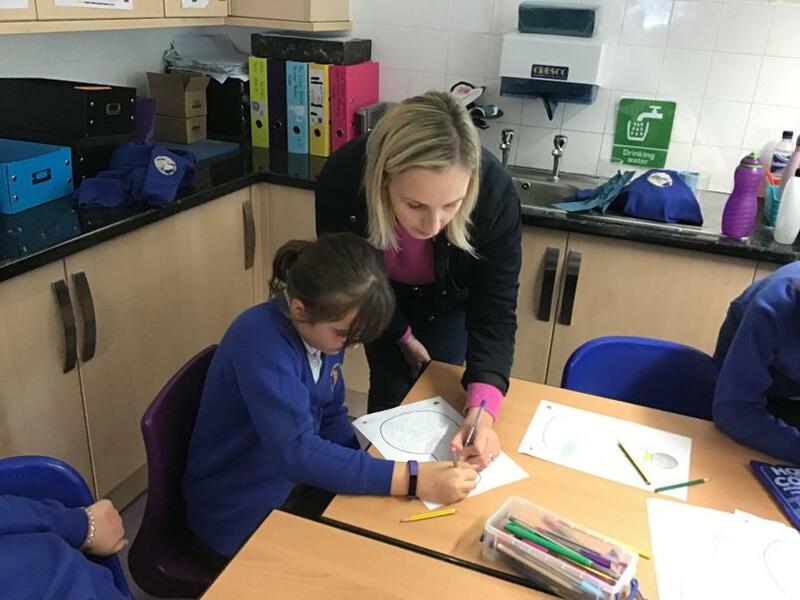 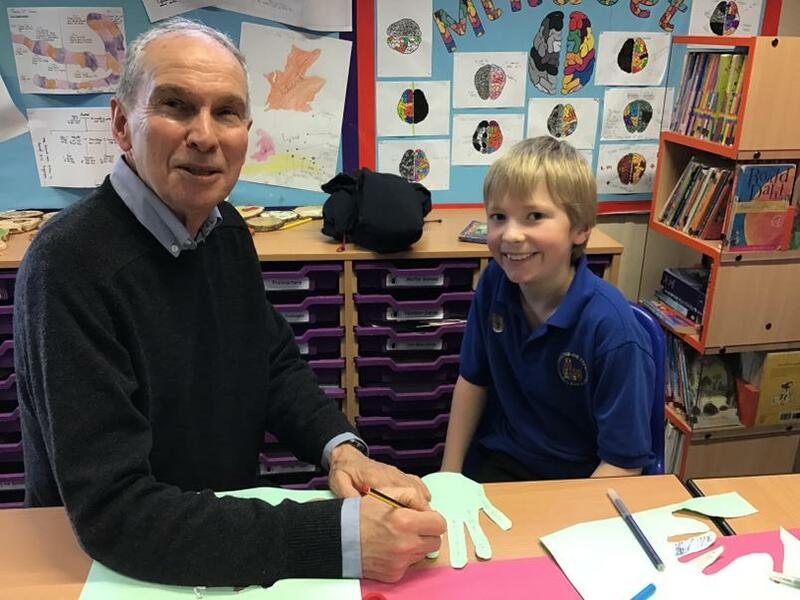 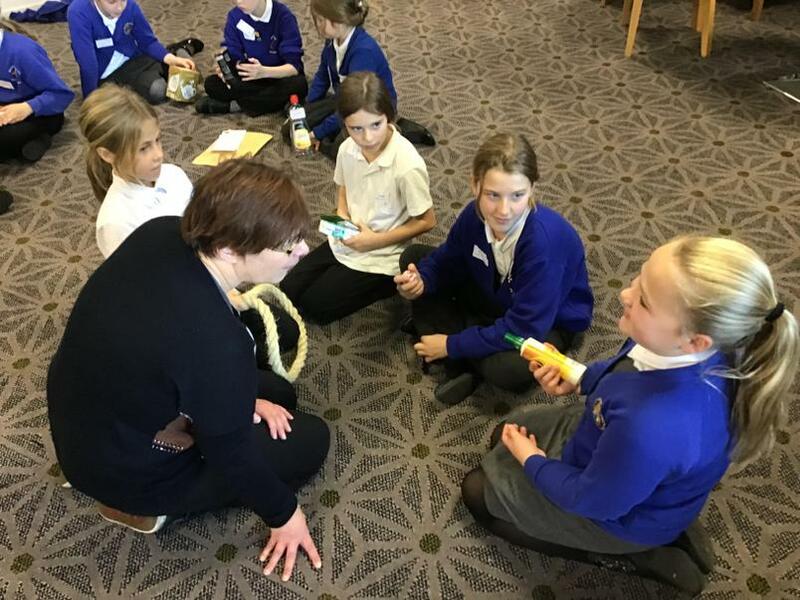 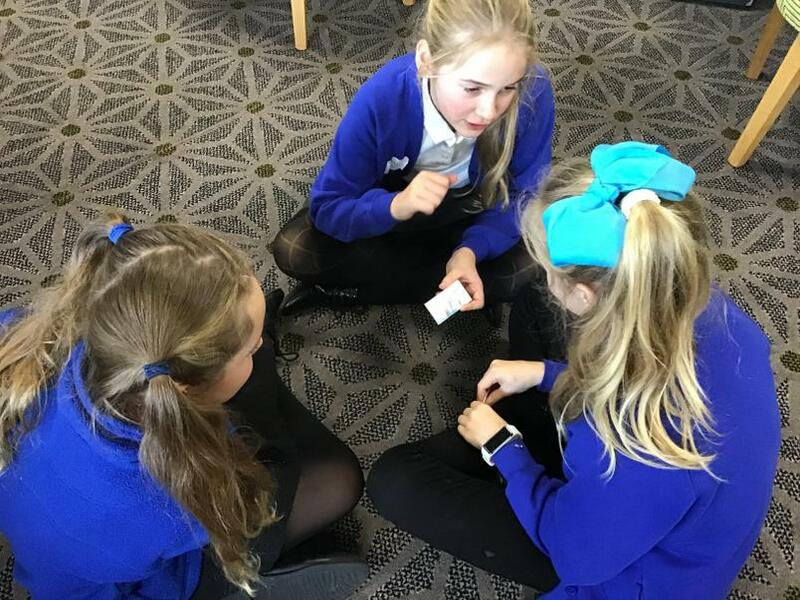 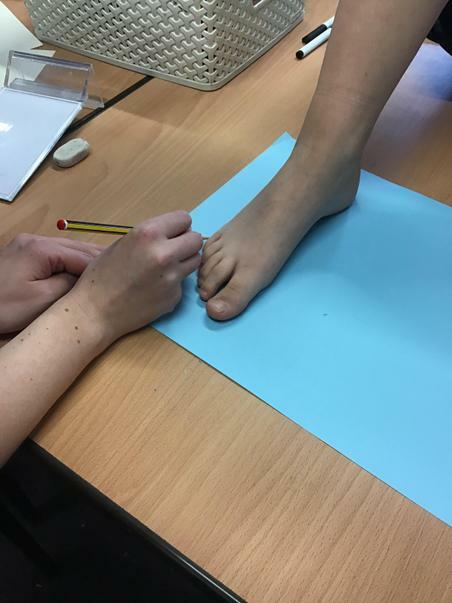 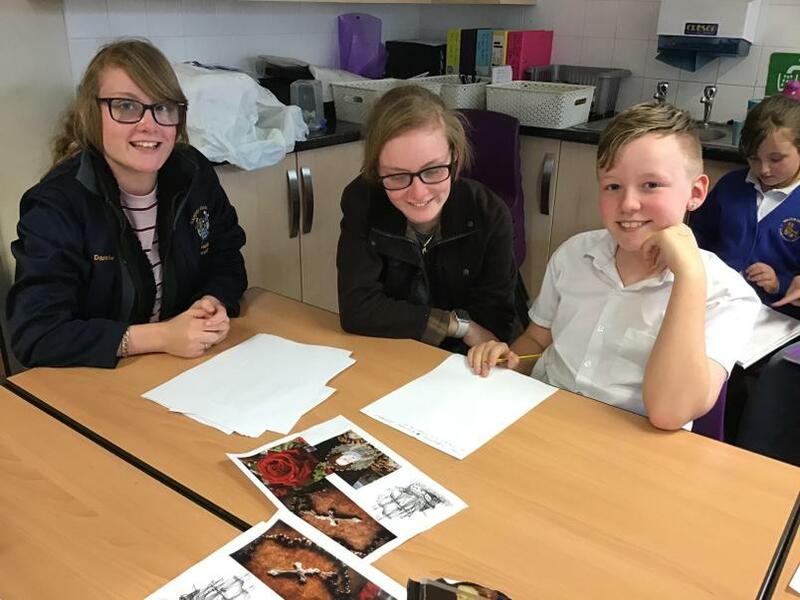 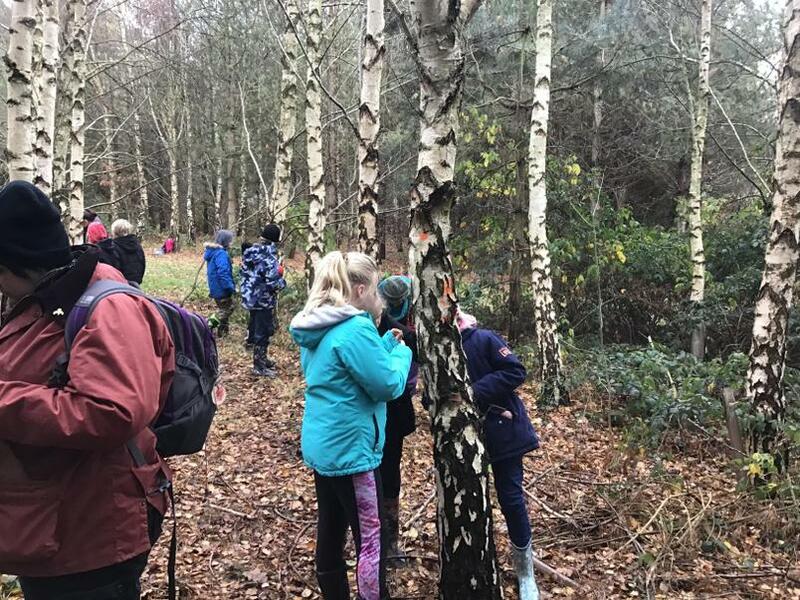 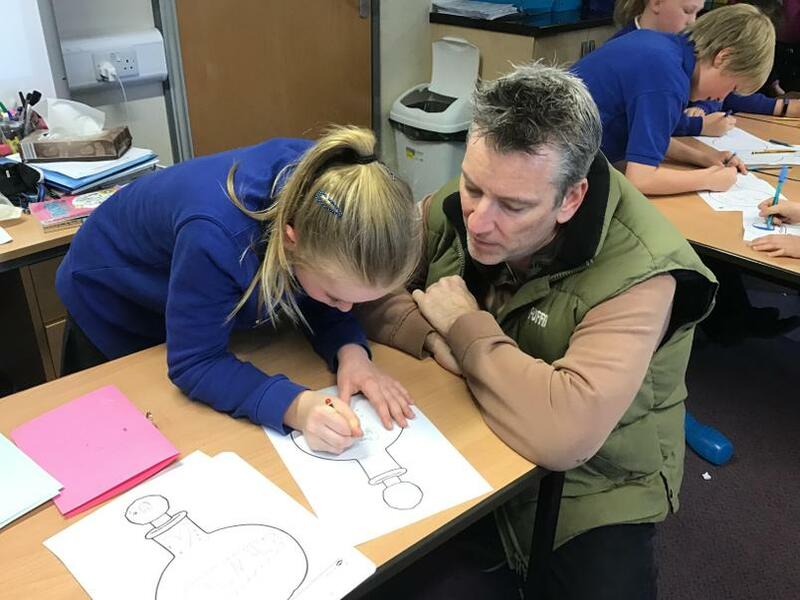 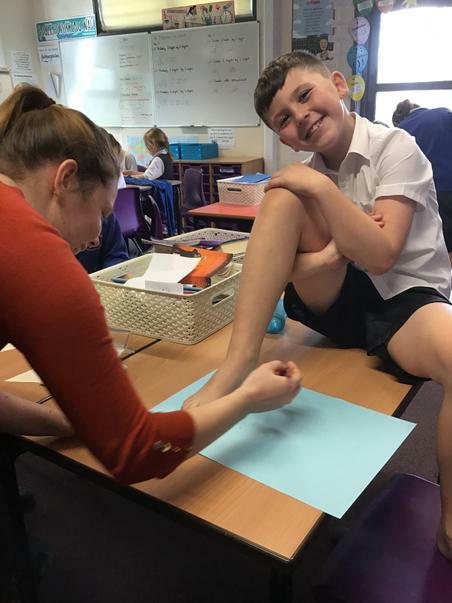 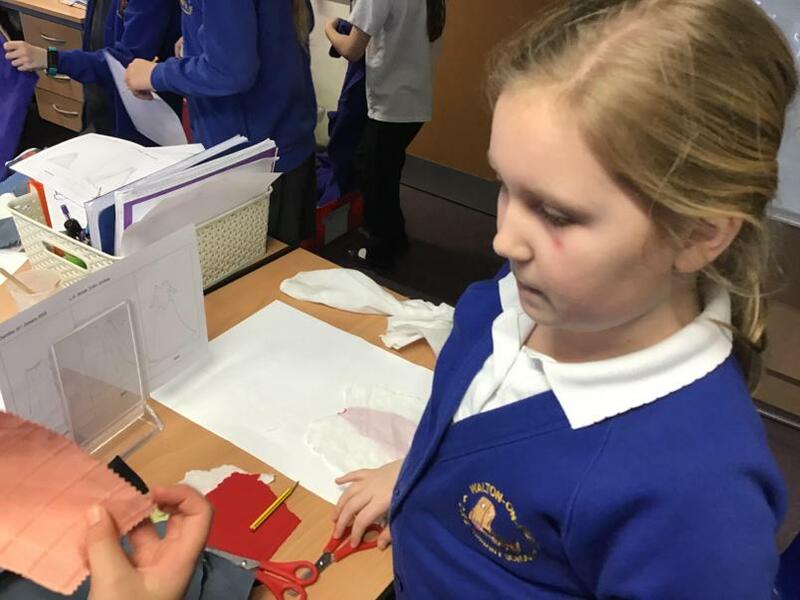 Thank you so much for joining in with our activities and taking the time to find out what we have been studying this half term! 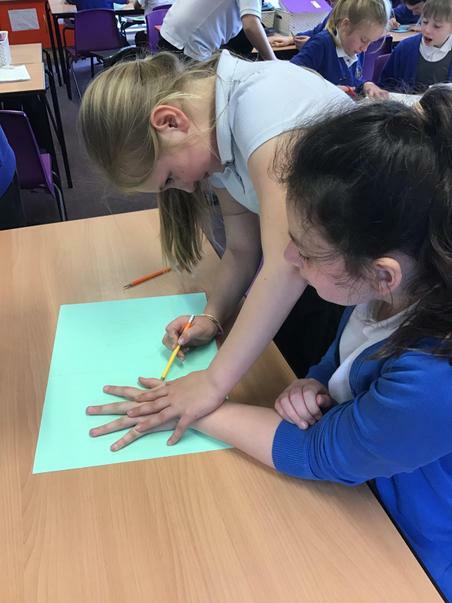 We had a very interesting lesson learning about Islam! 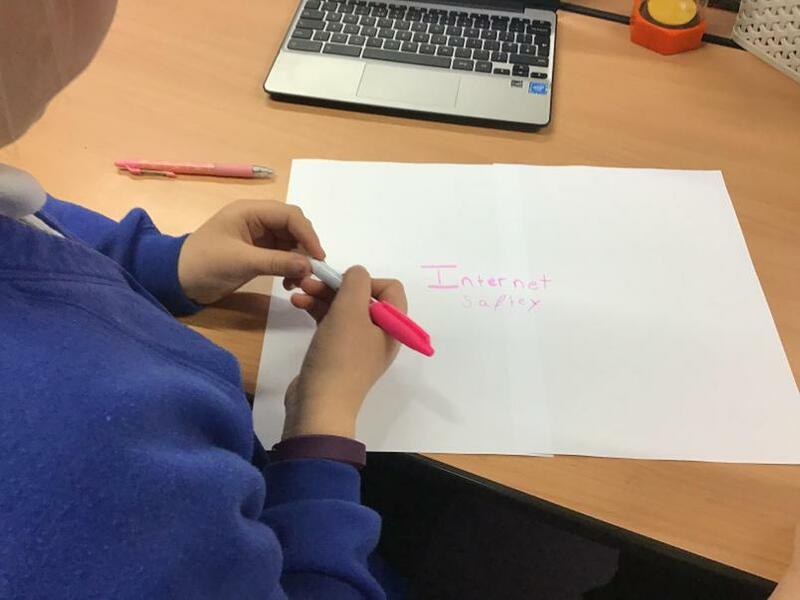 We had a great lesson about how to be safer when using the internet! 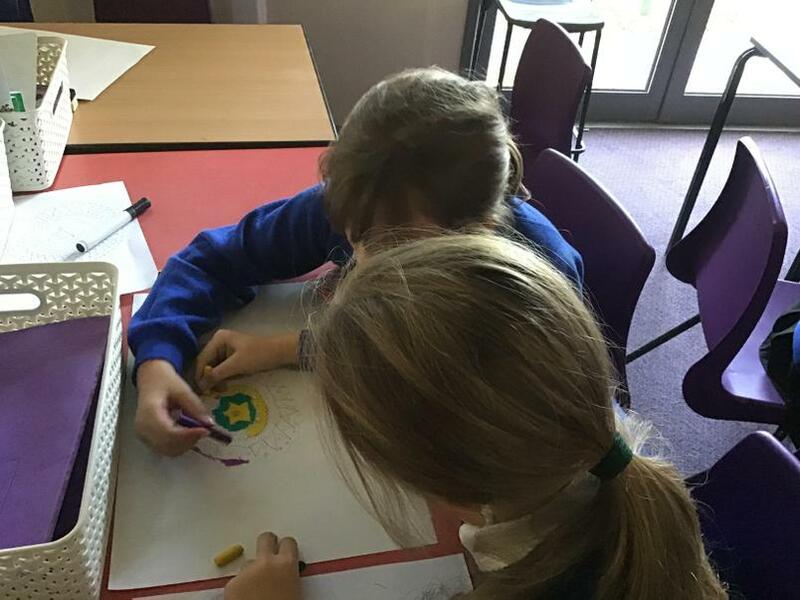 The children were creative in the way they decided to promote internet safety. 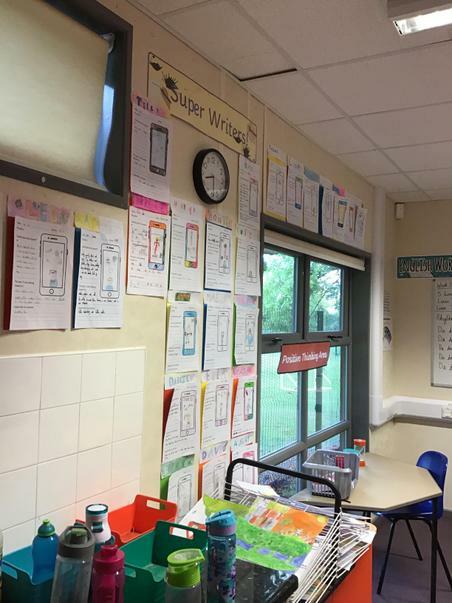 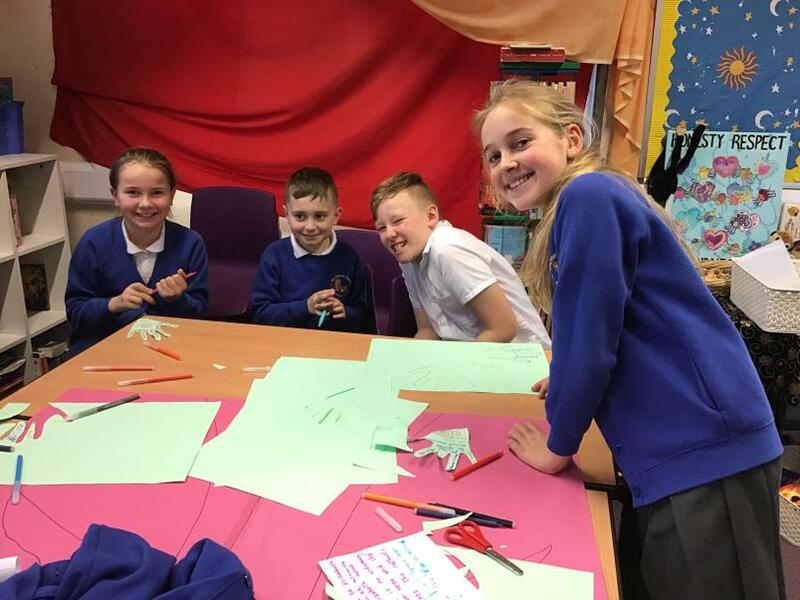 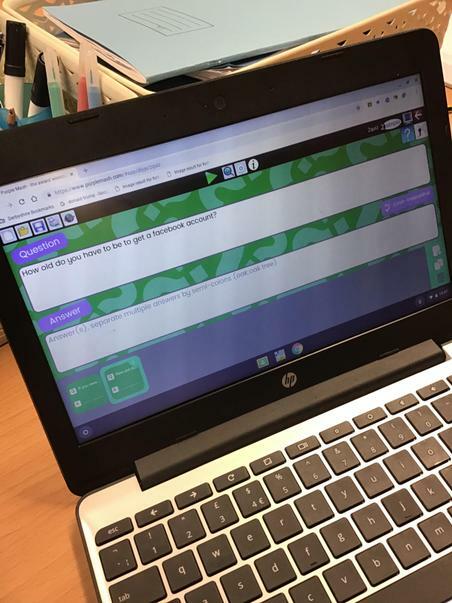 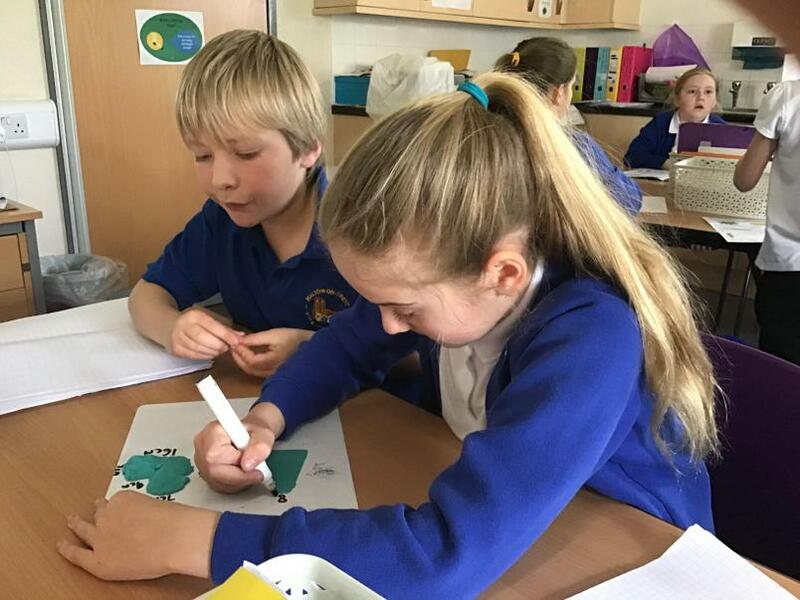 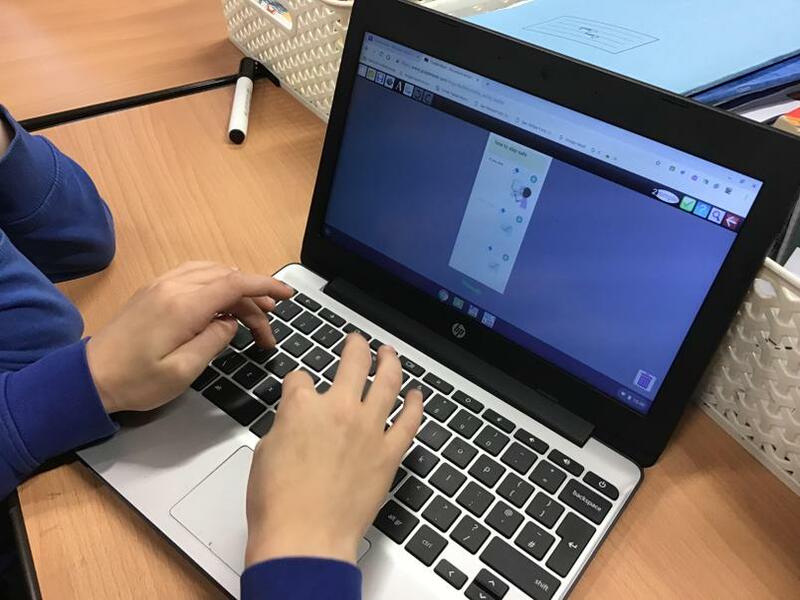 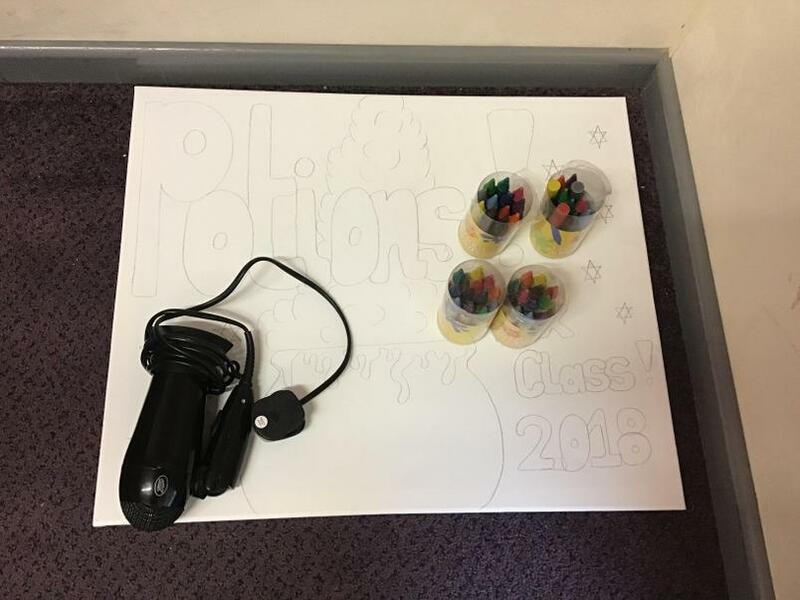 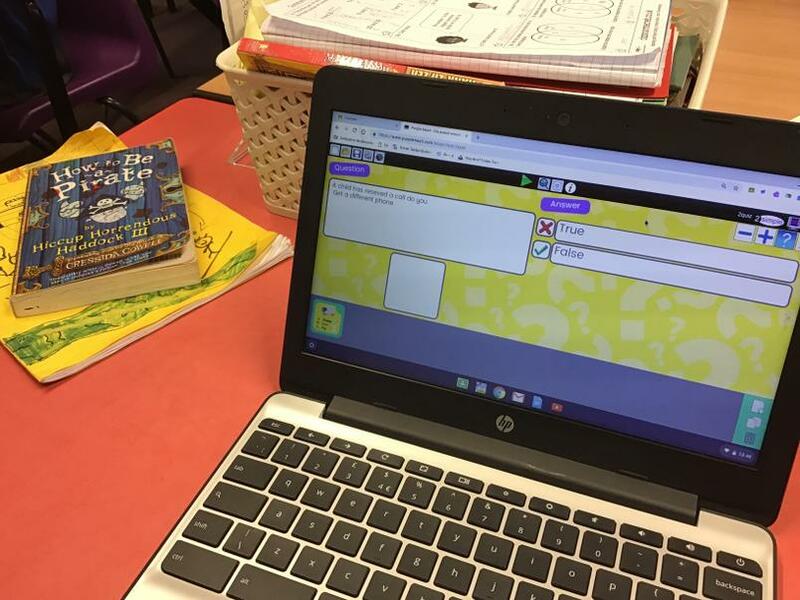 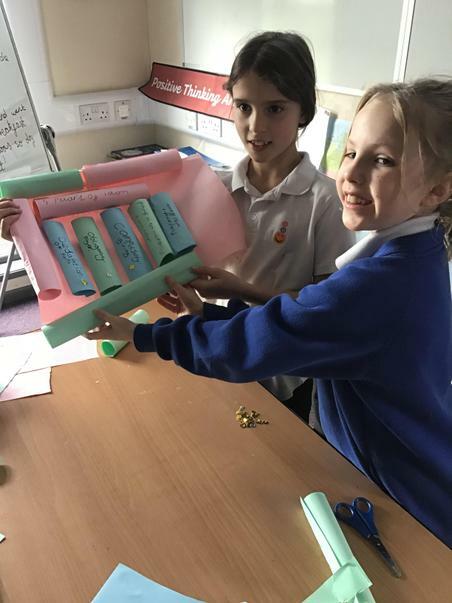 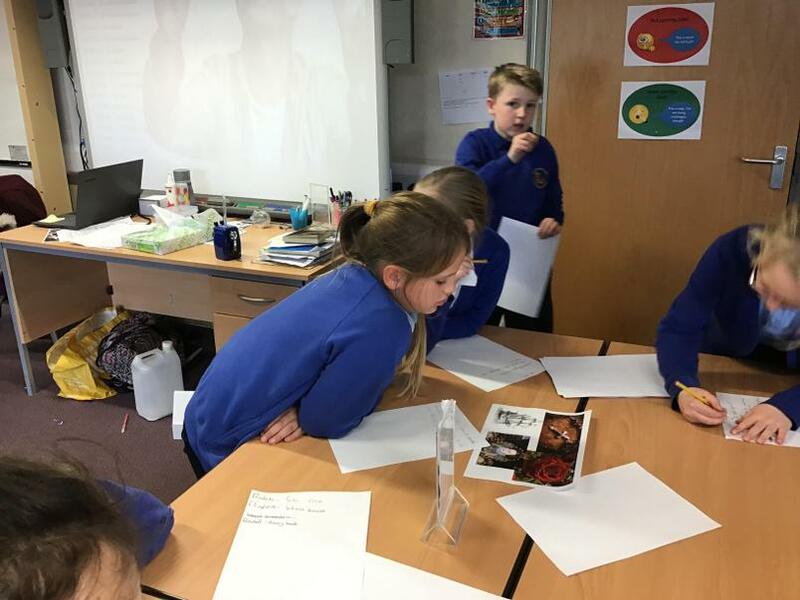 Some chose to write their own quiz, some made wonderful posters, some created slideshow presentations and some chose to create computer games! 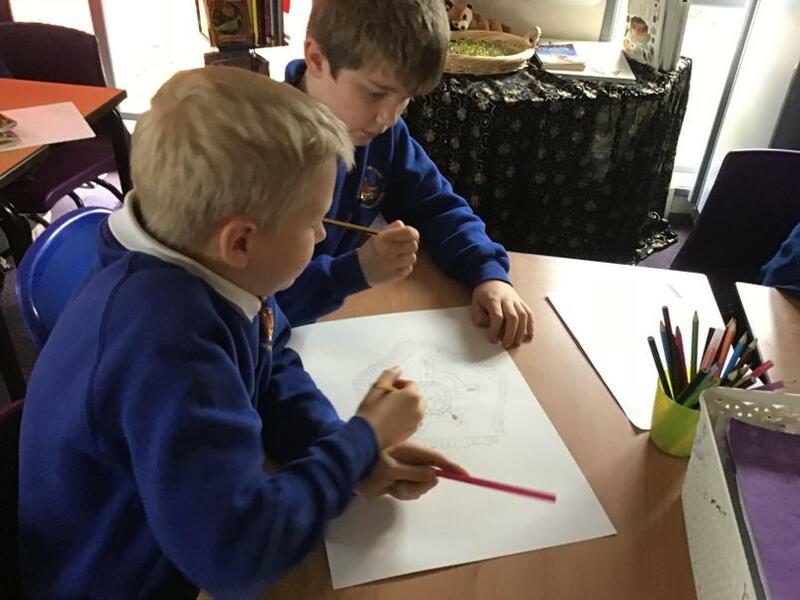 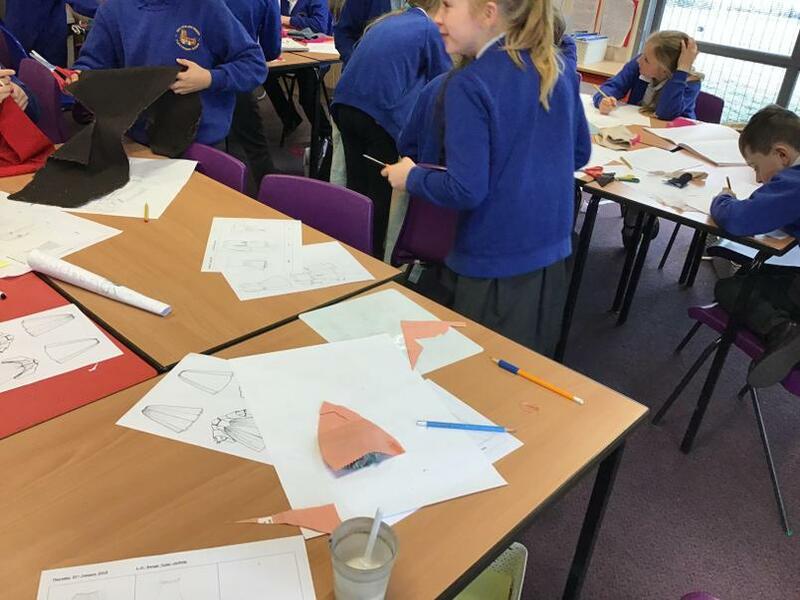 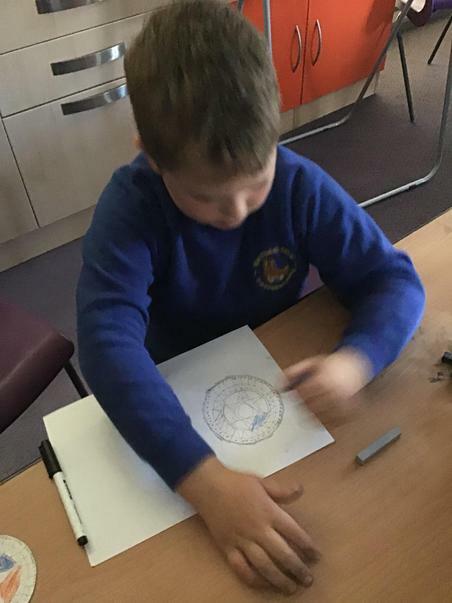 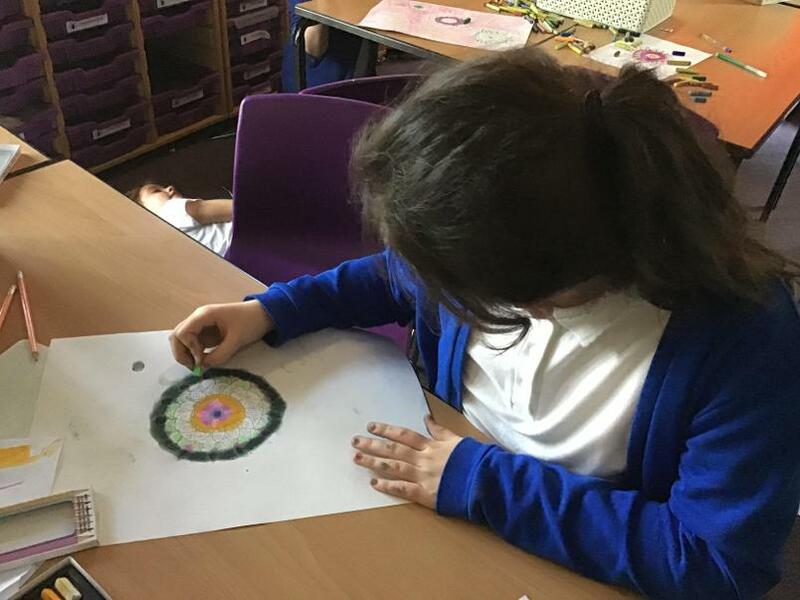 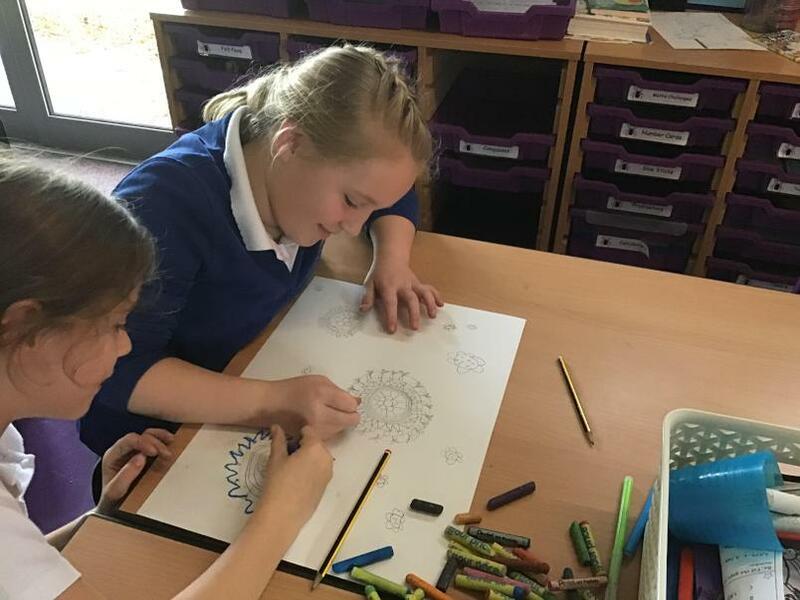 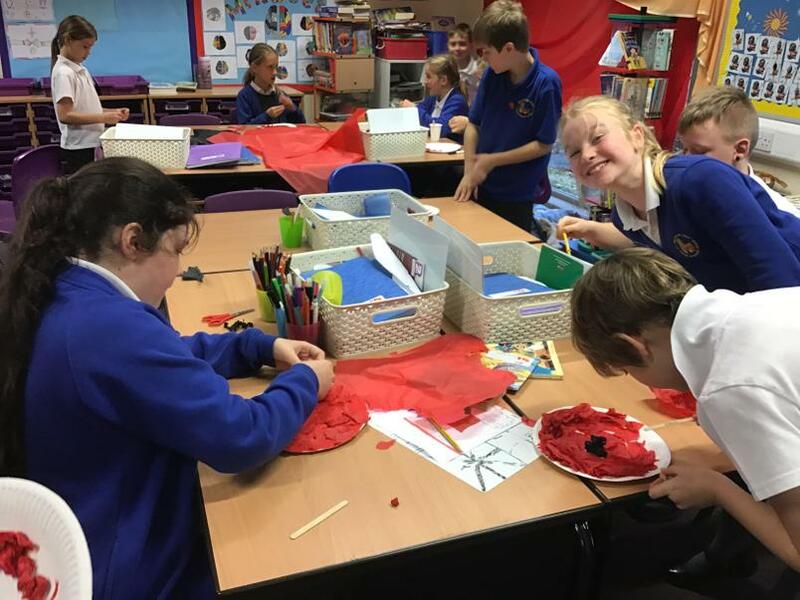 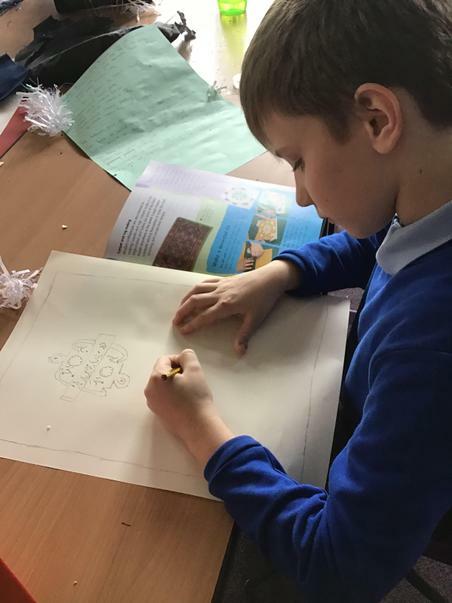 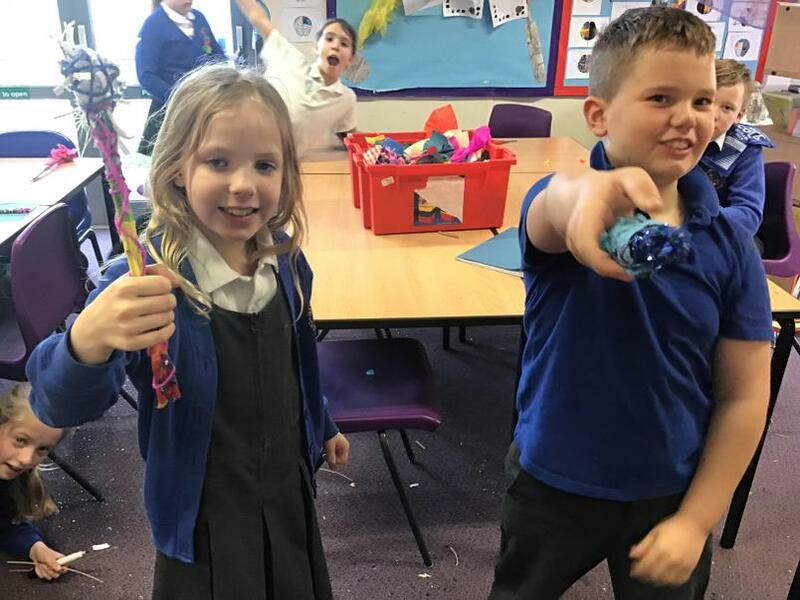 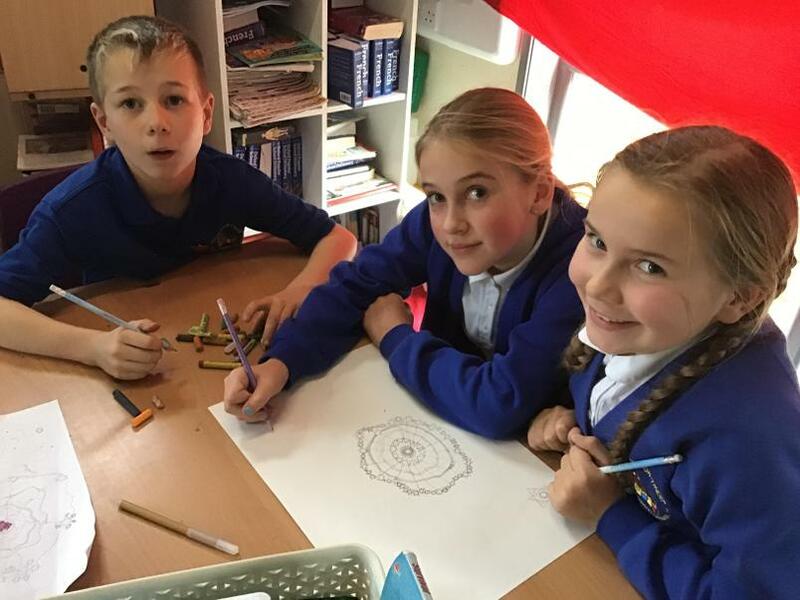 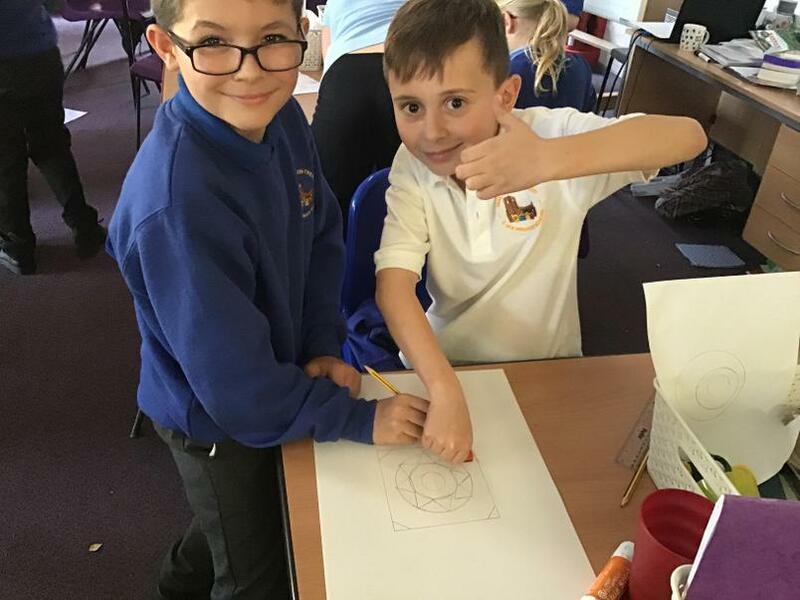 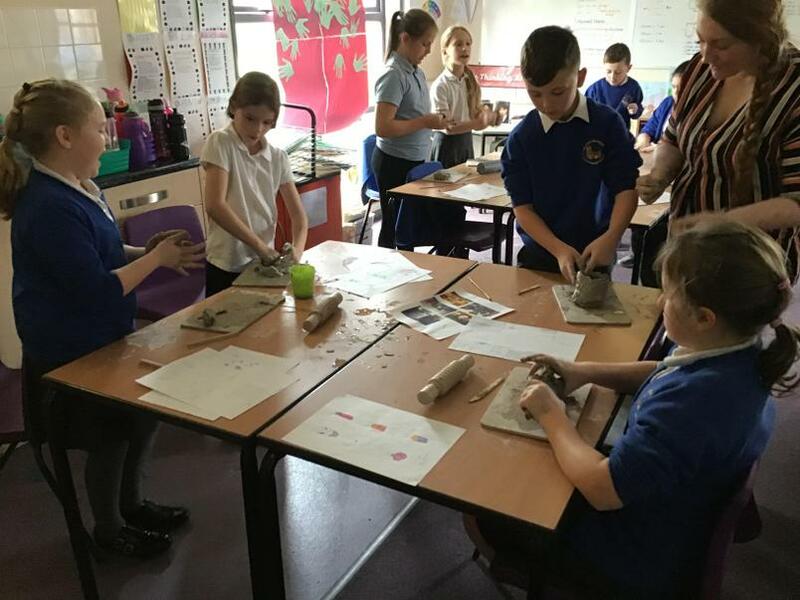 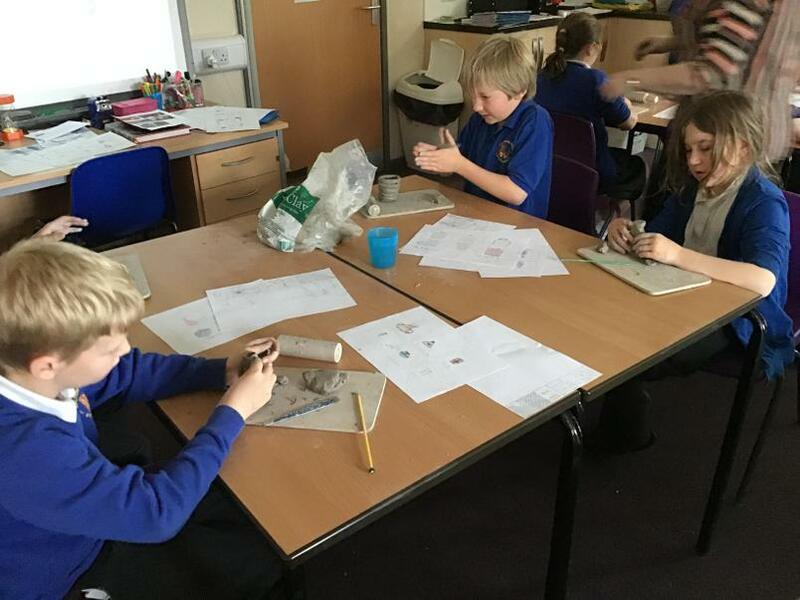 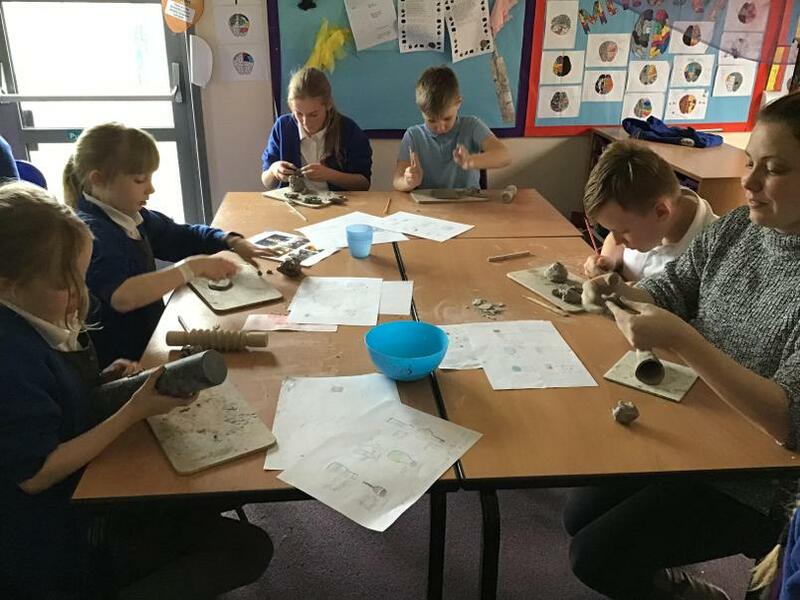 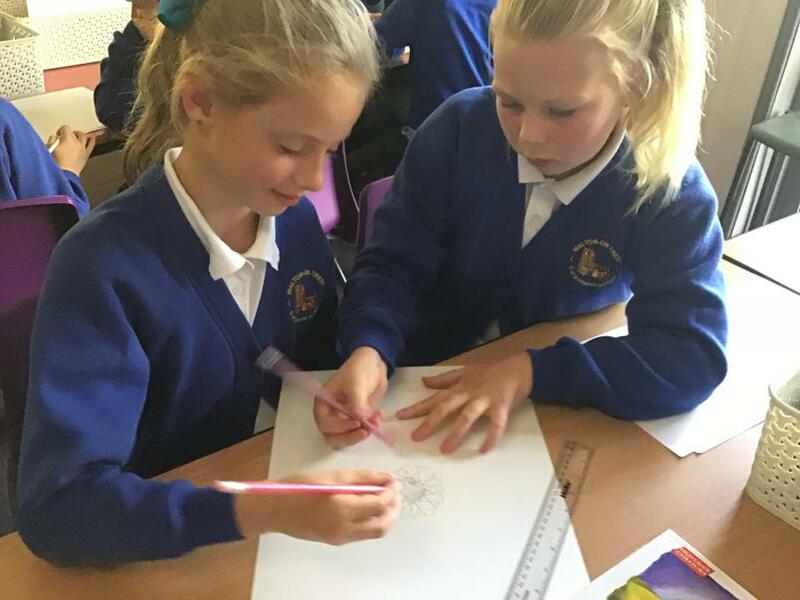 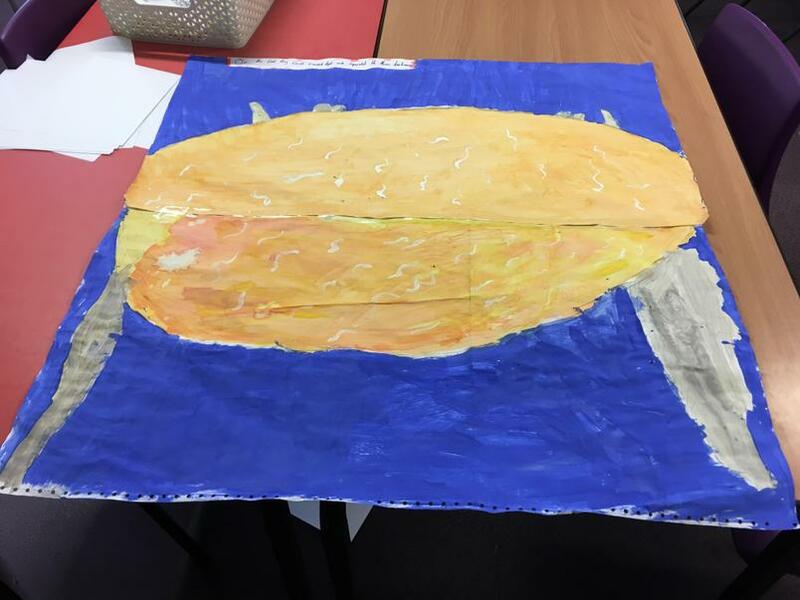 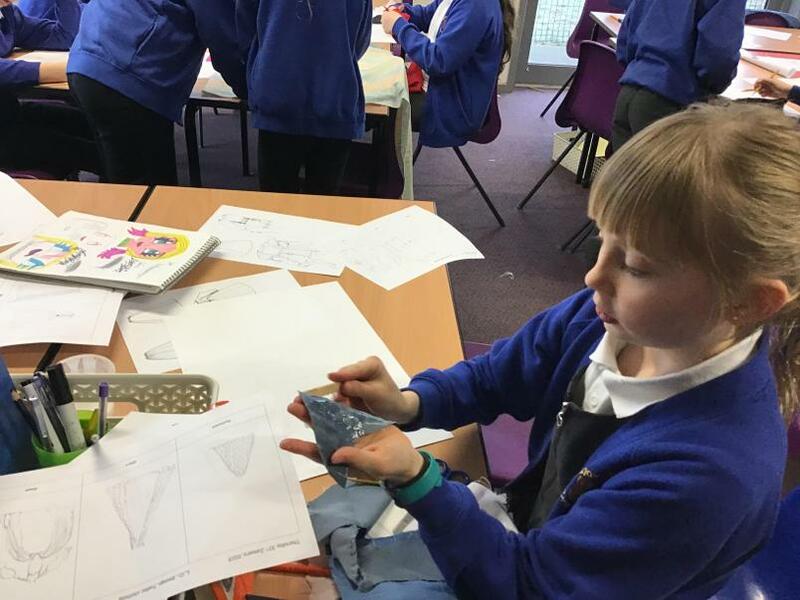 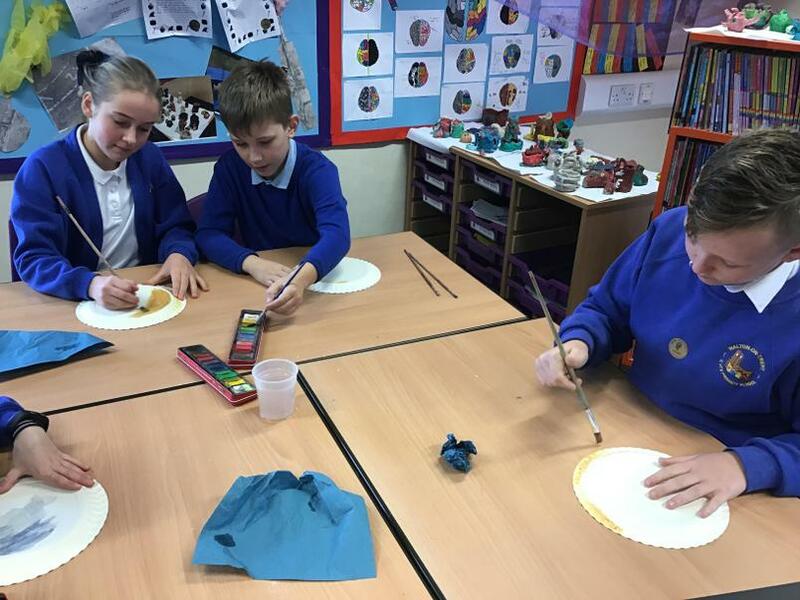 Fox Class had a fantastic time during their art, design and textiles lesson. 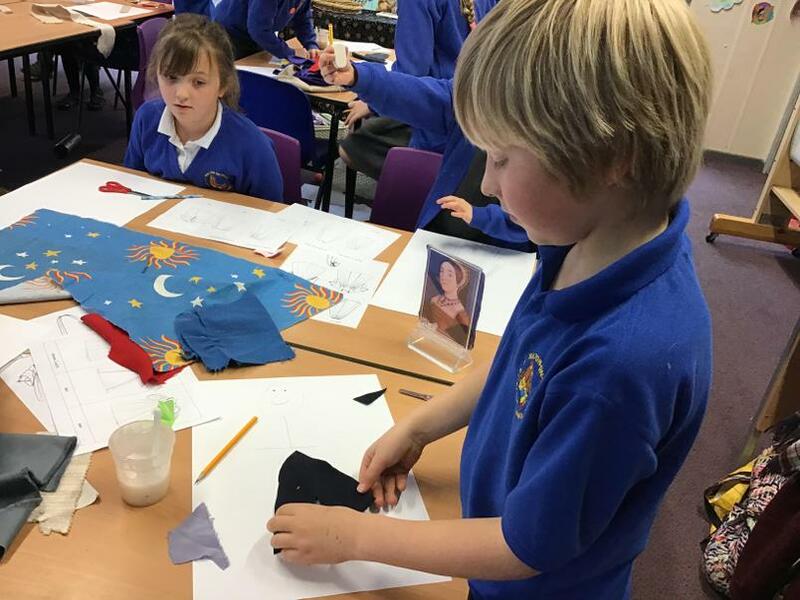 They created some lovely Tudor outfits! 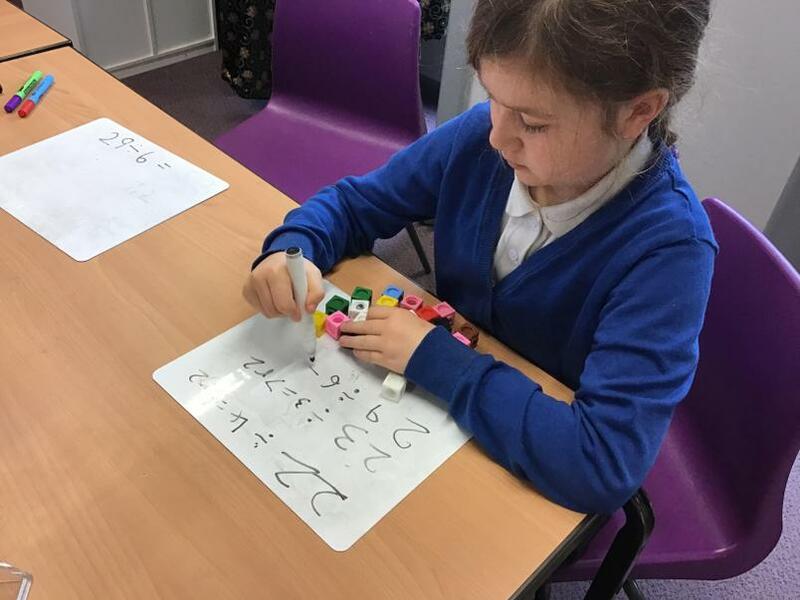 The children had a fantastic time playing multiplication board grab in maths! 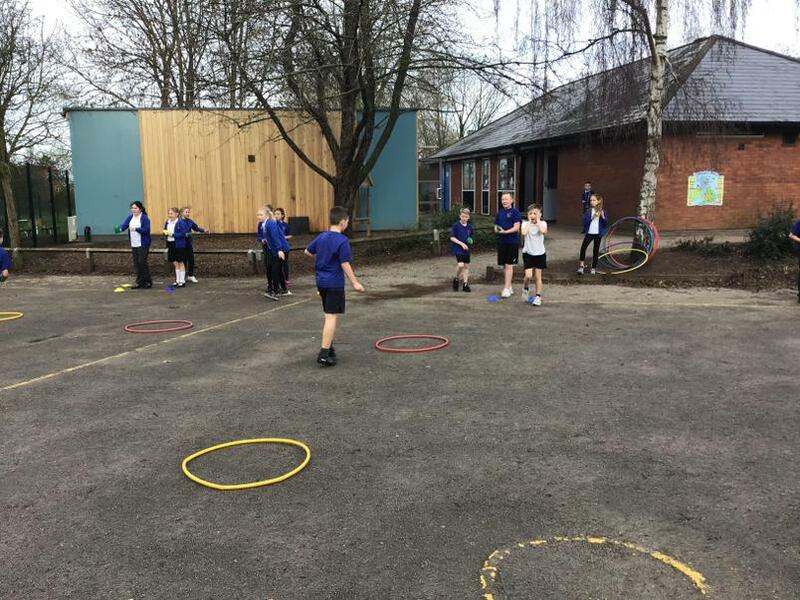 Some fantastic team work skills durin PE! 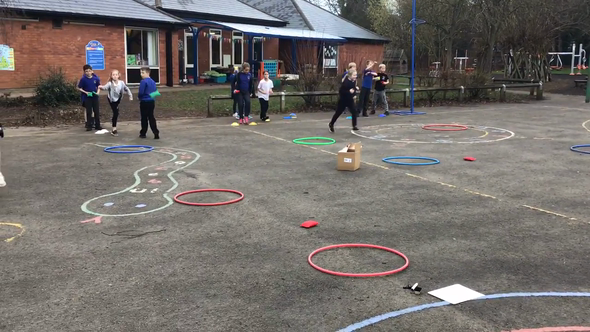 Everyone showed excellent resilience and thinking skills to build on their strategy. 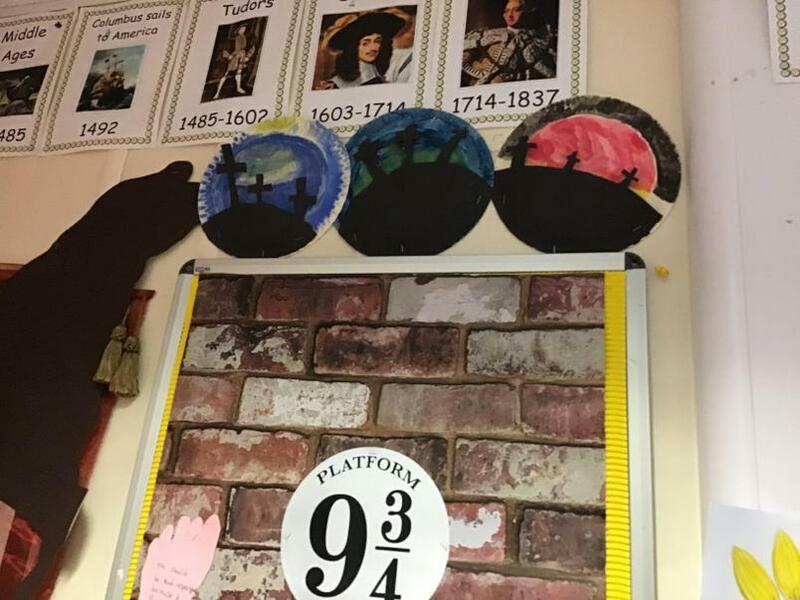 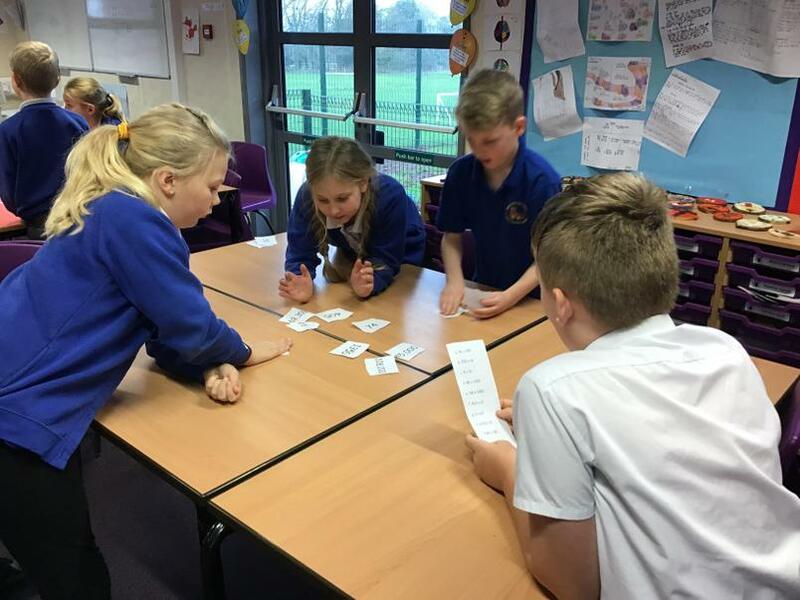 The children put in a fantastic effort during history to put together this detailed Tudor timeline! 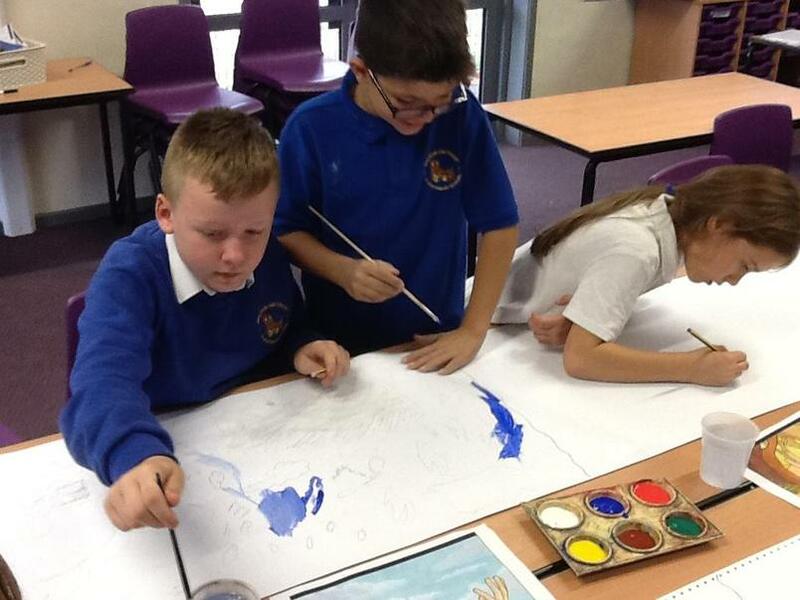 They worked brilliantly as a class team, well done! 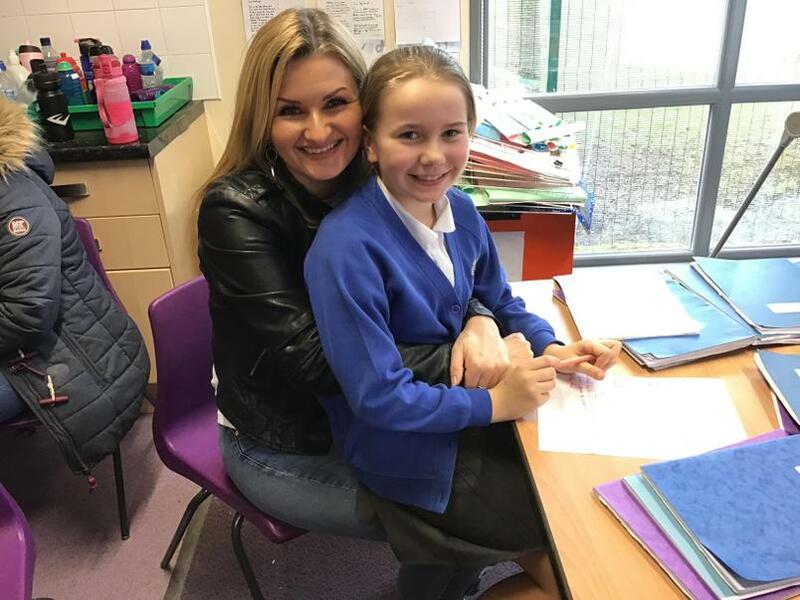 Mrs Stewart loves a good welcome back after the Christmas holidays. 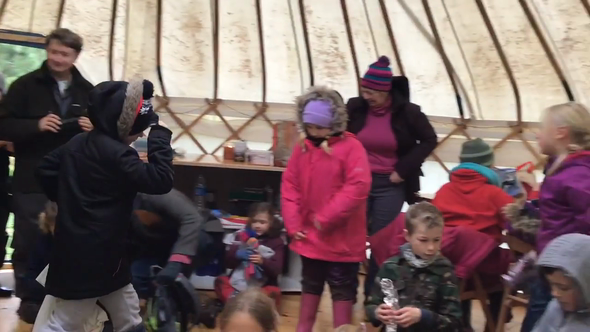 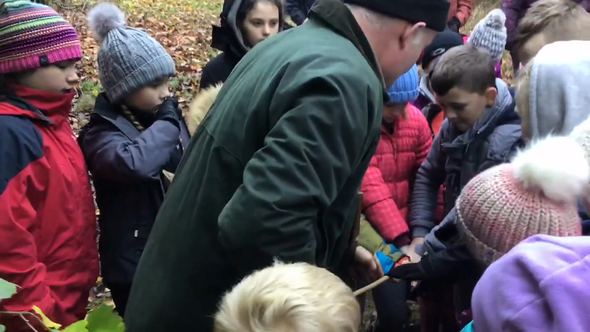 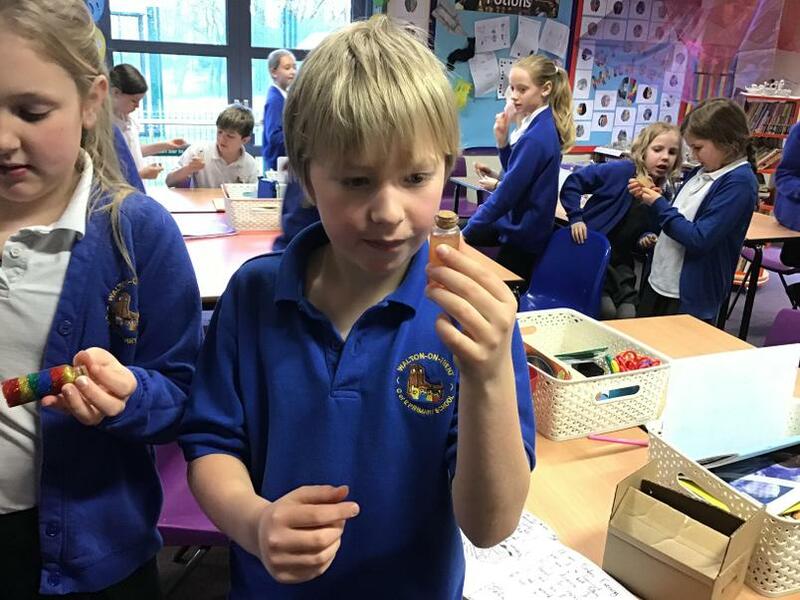 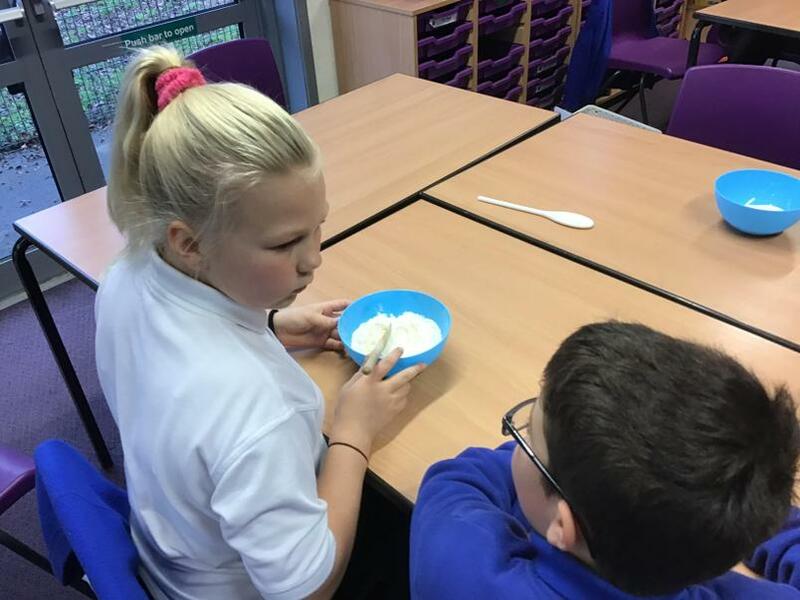 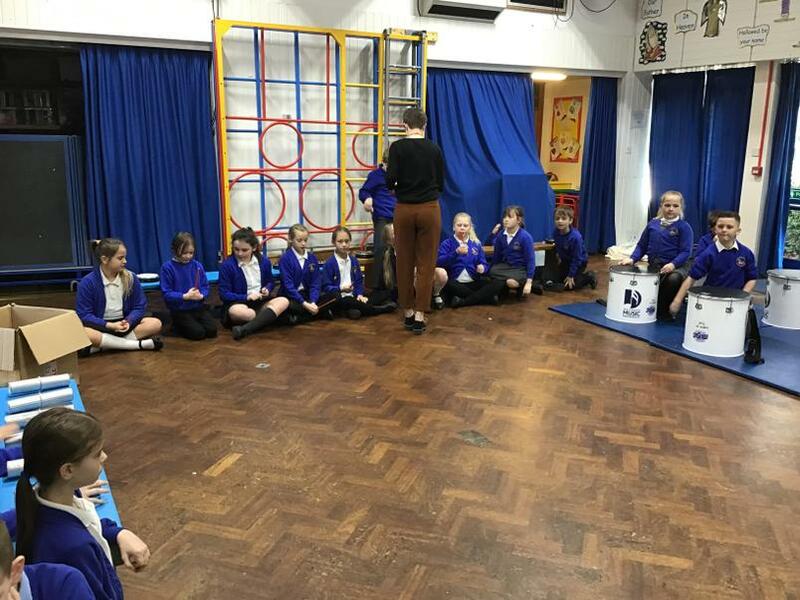 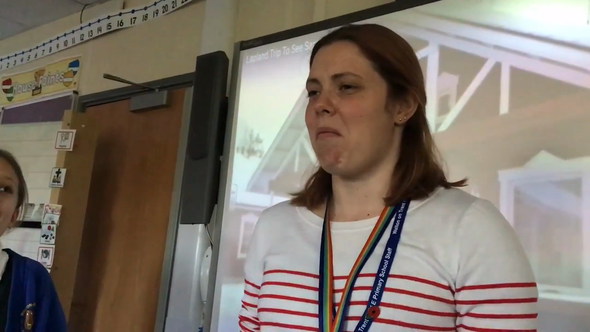 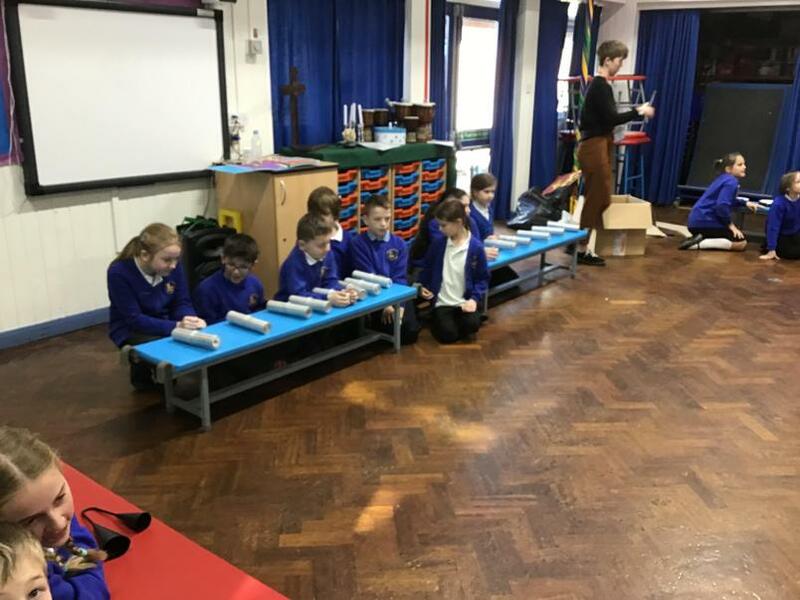 Two of the children in Fox class went to Lapland; so here’s a lovely video of Mrs Stewart eating ‘reindeer droppings’ chocolate! 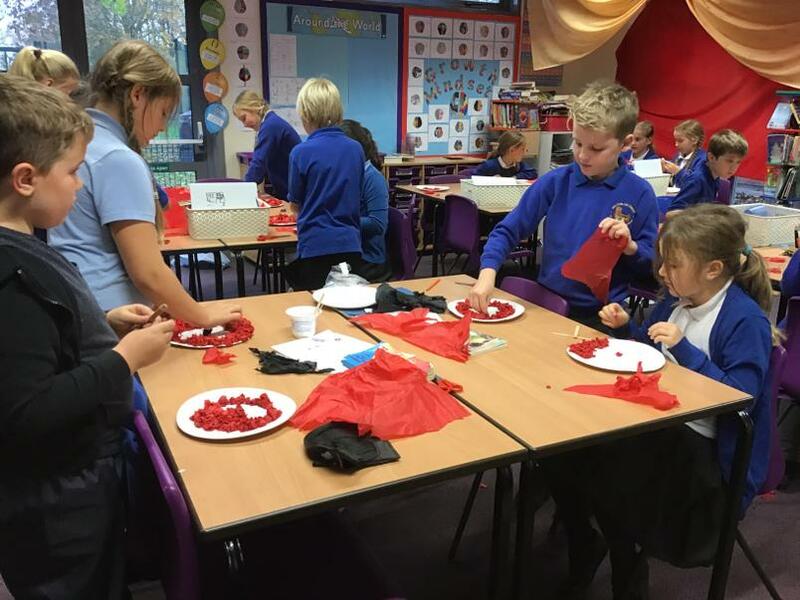 There are some fantastic costumes for the Christmas play! 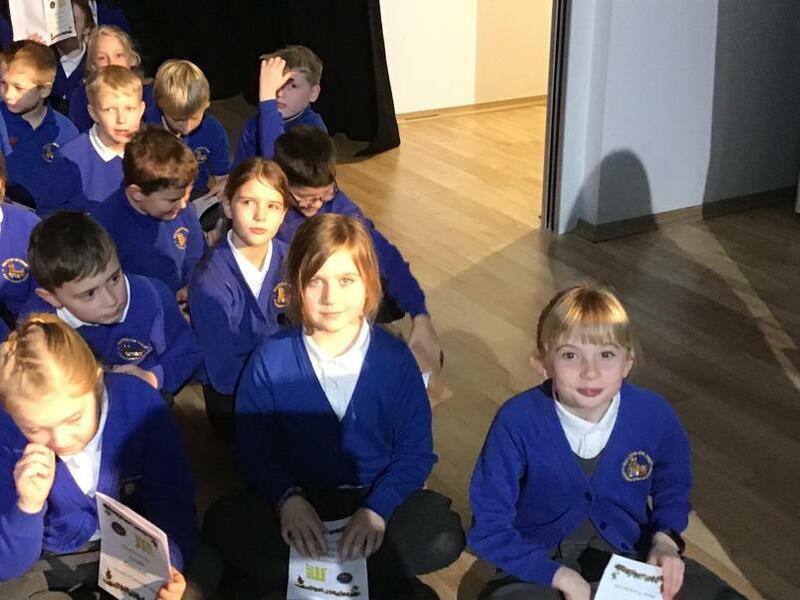 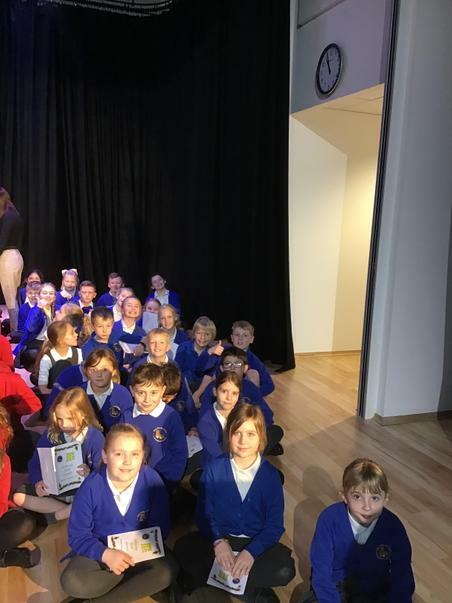 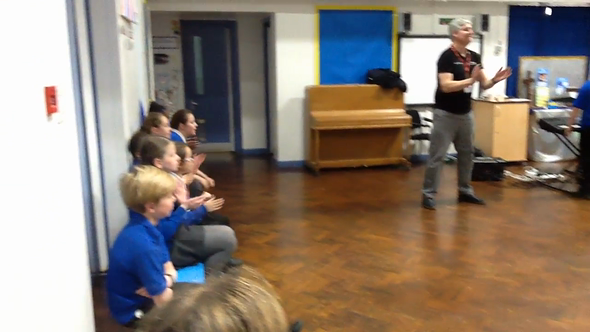 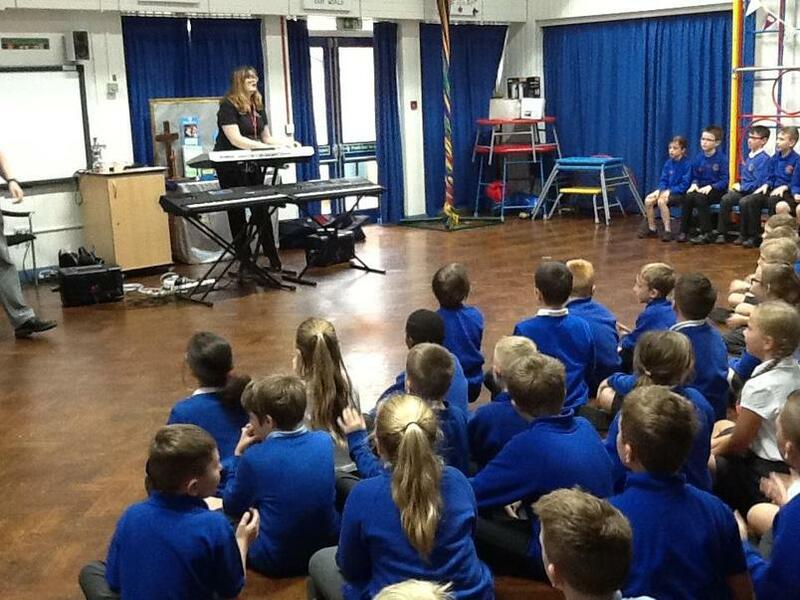 Foxes had a fantastic time at the John Taylor Free School singing with the other primary schools in the JTMAT! 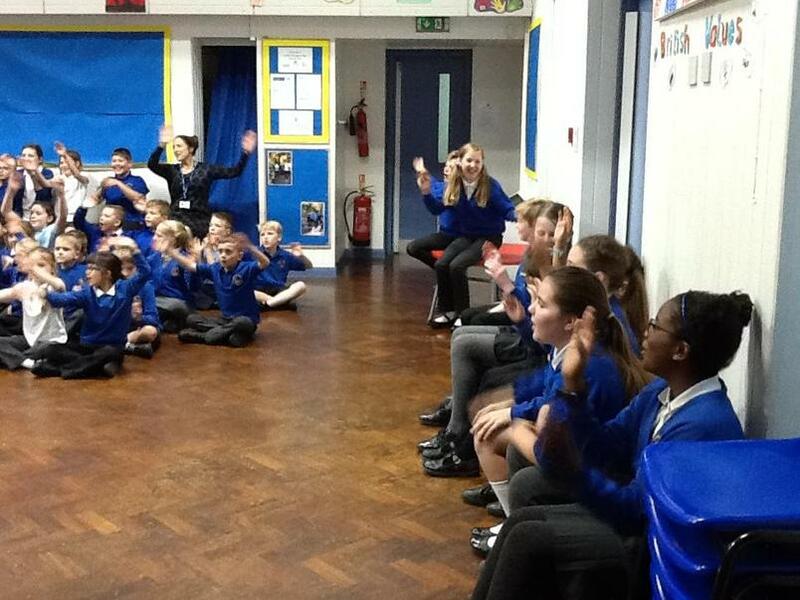 Foxes are very enthusiastic about the JTMAT Christmas Concert on Monday! 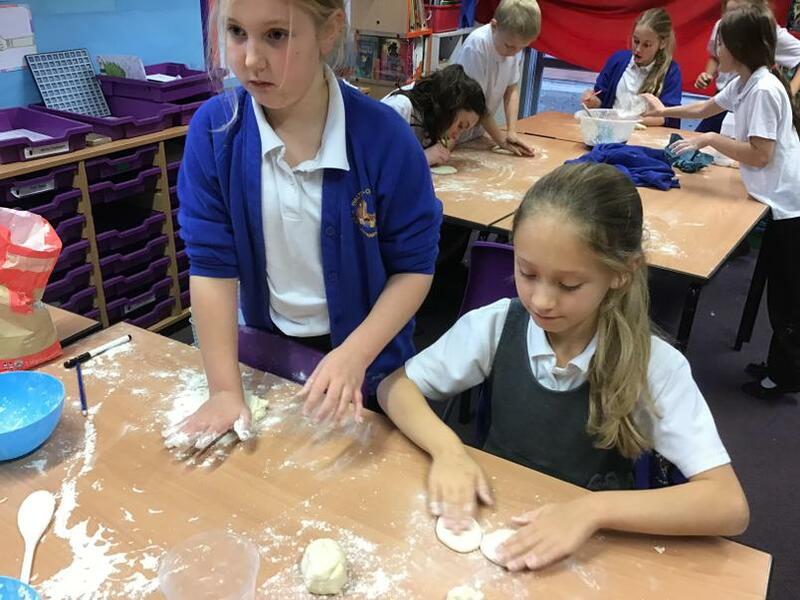 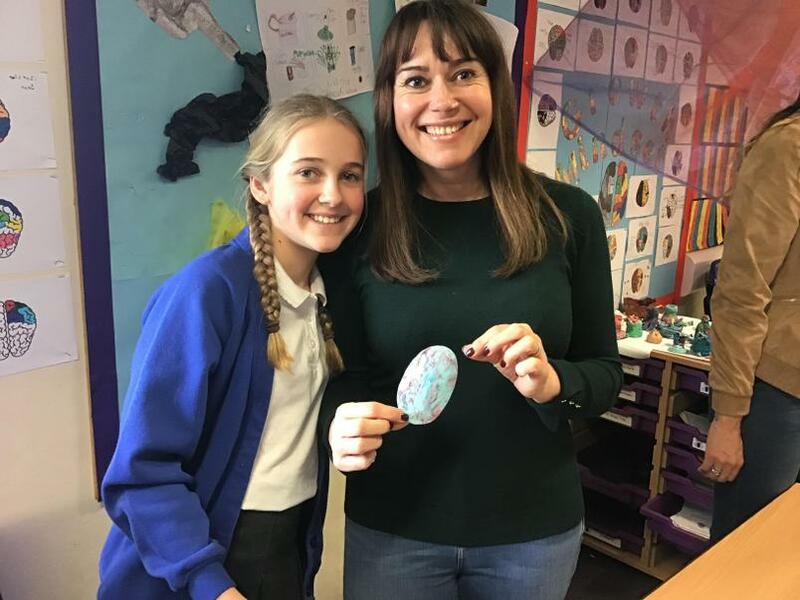 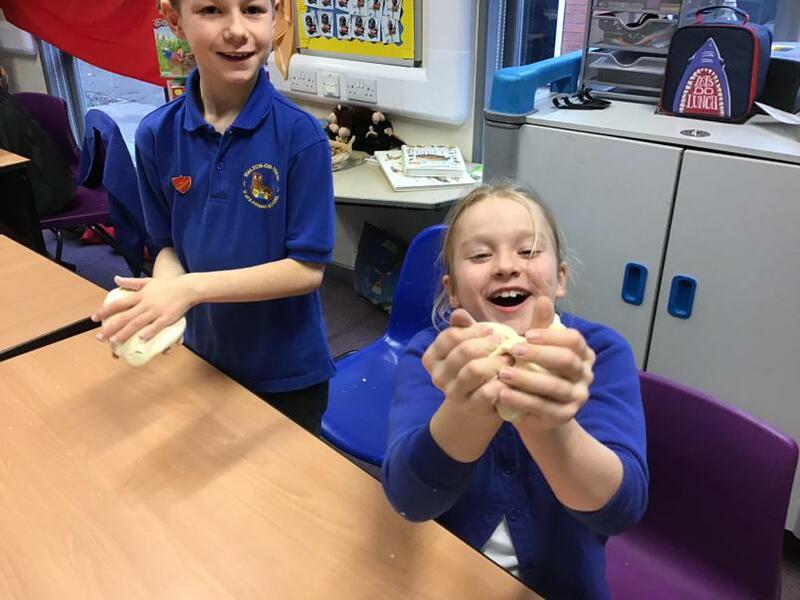 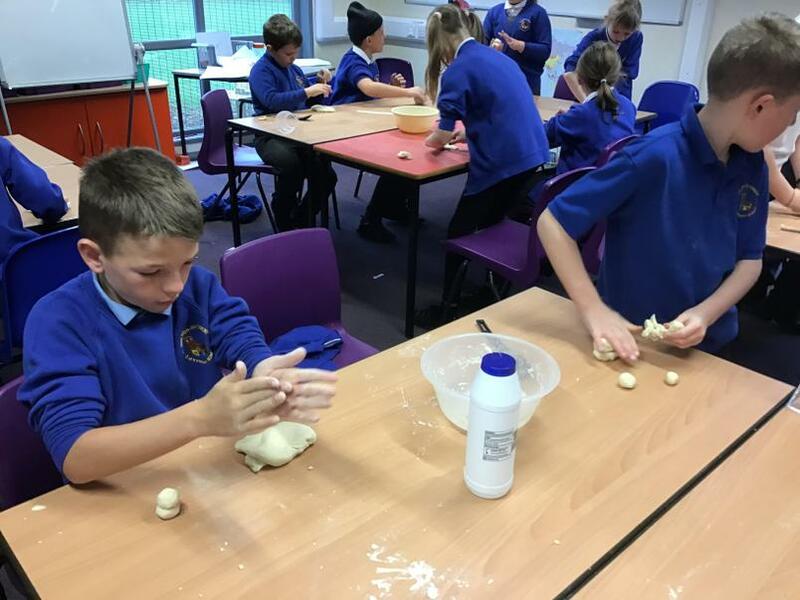 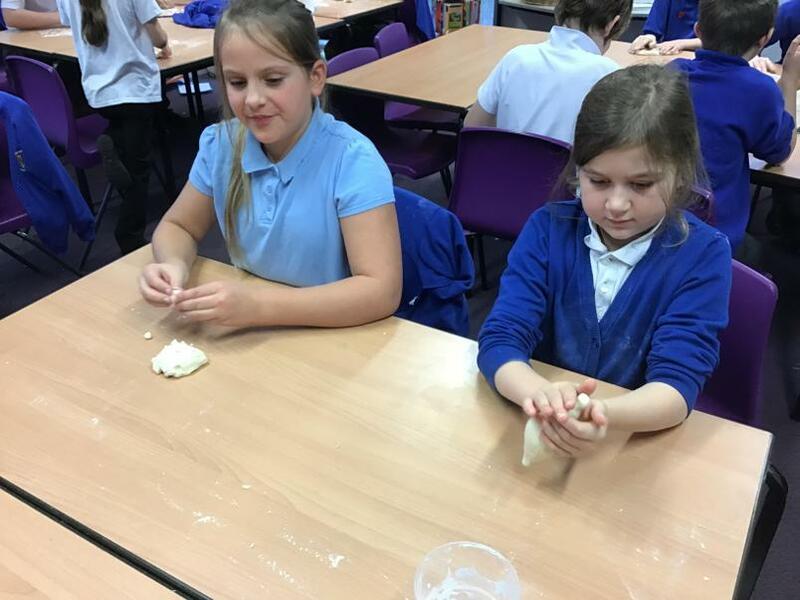 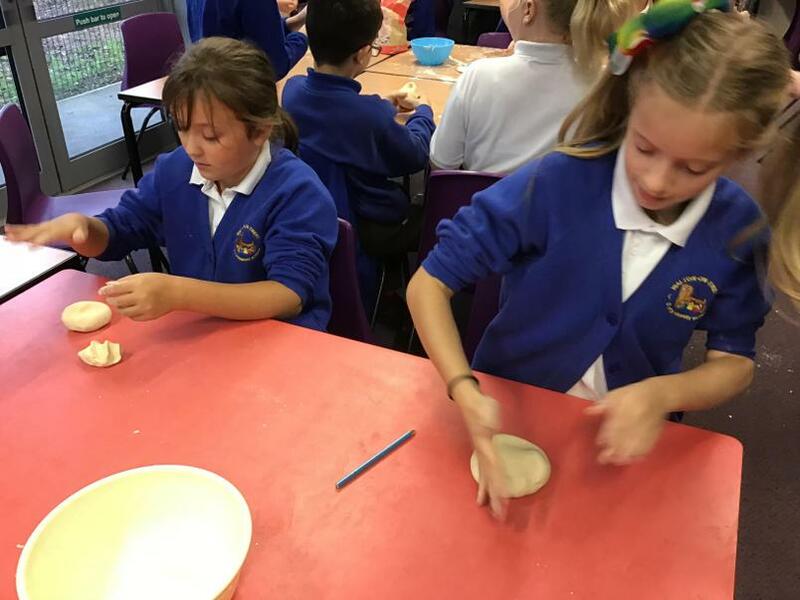 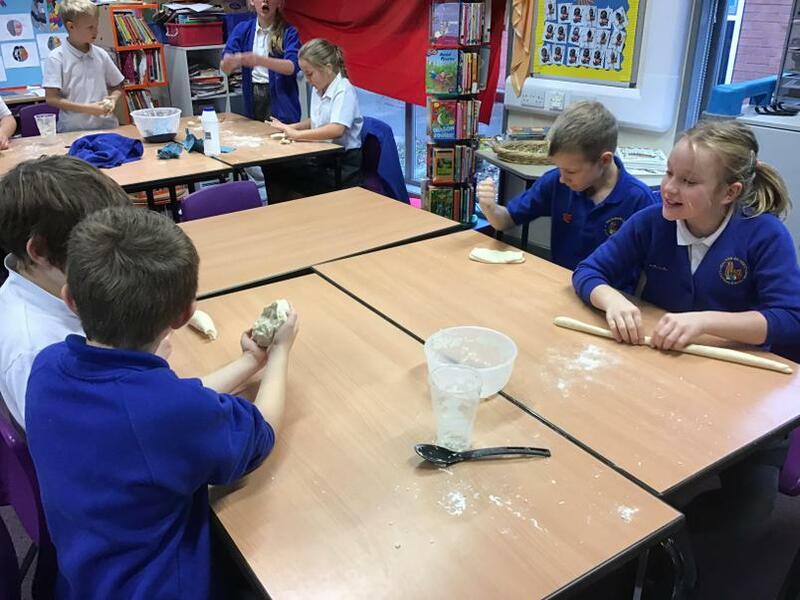 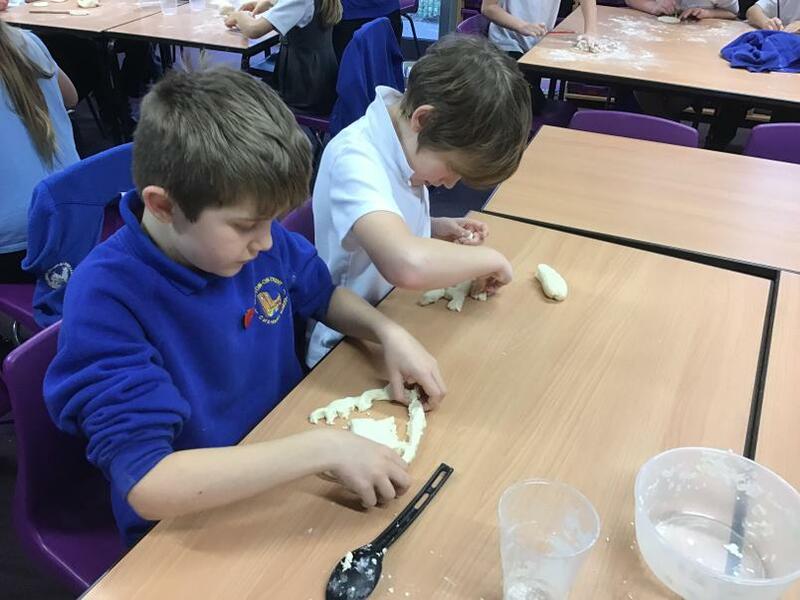 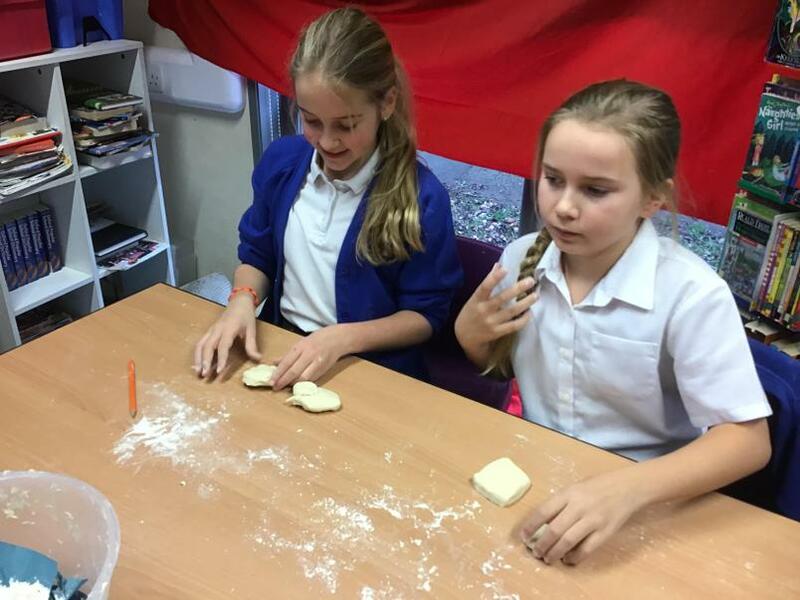 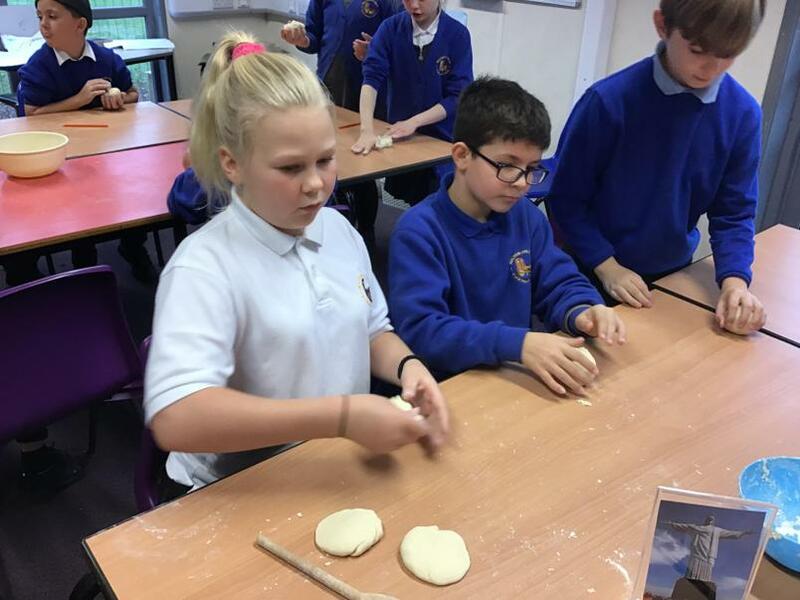 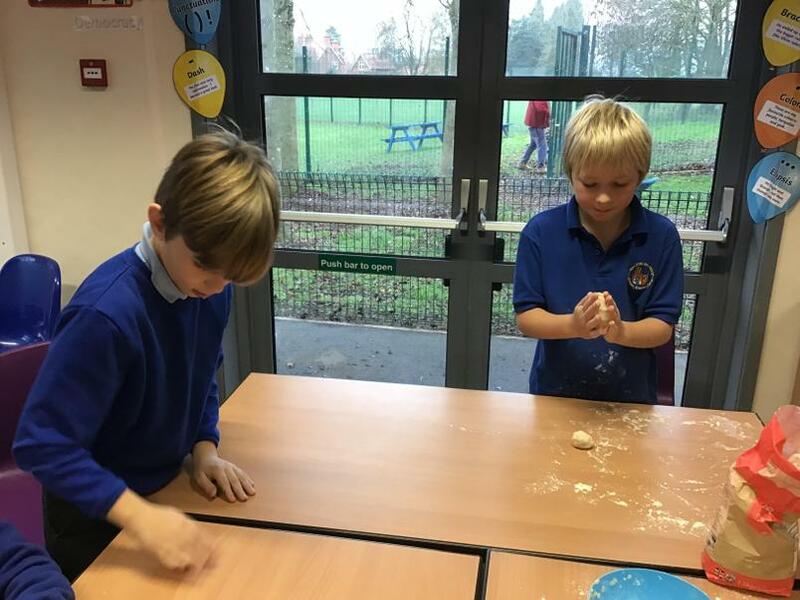 We had a fantastic time making our own salt dough and then sculpting it into Christmas decorations. 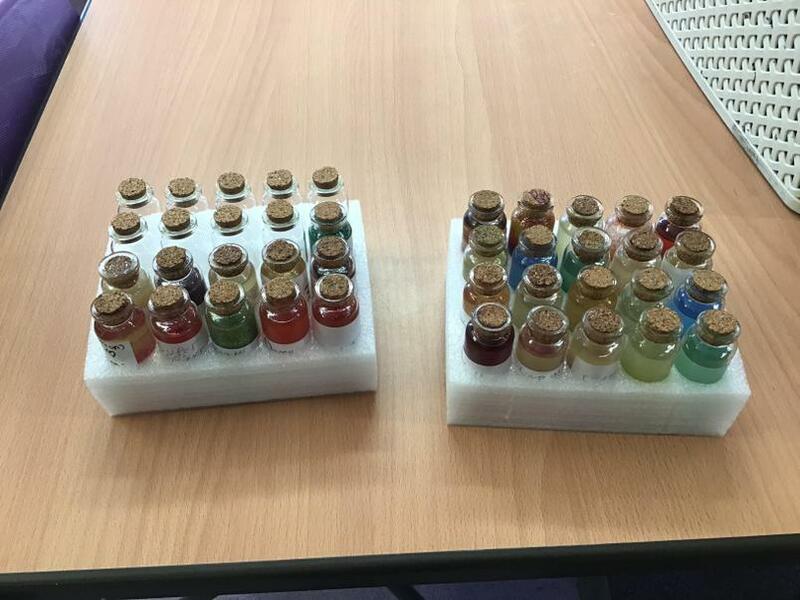 Make sure you come along and buy them at the School Christmas Fair this Friday afternoon! 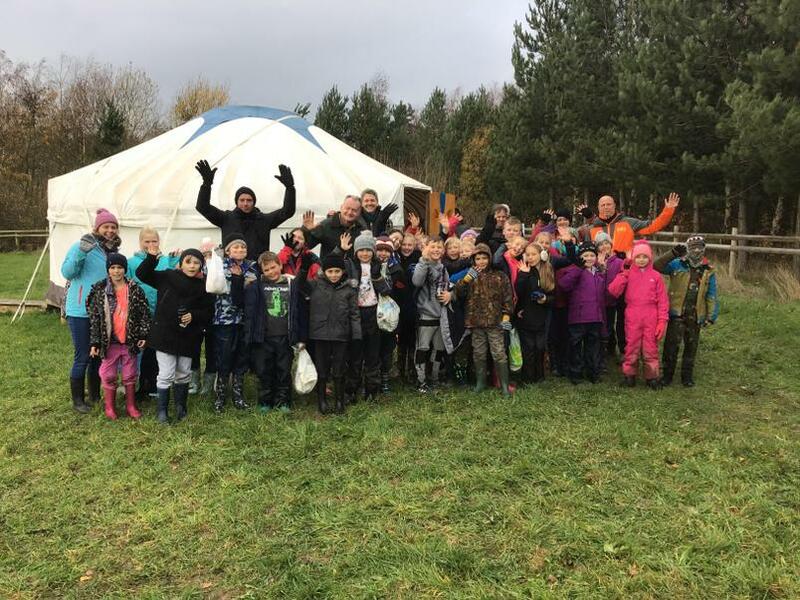 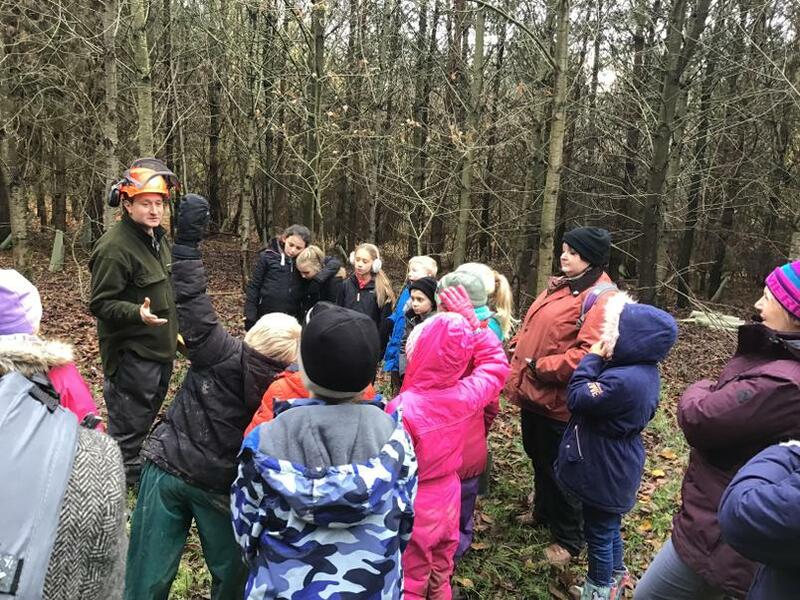 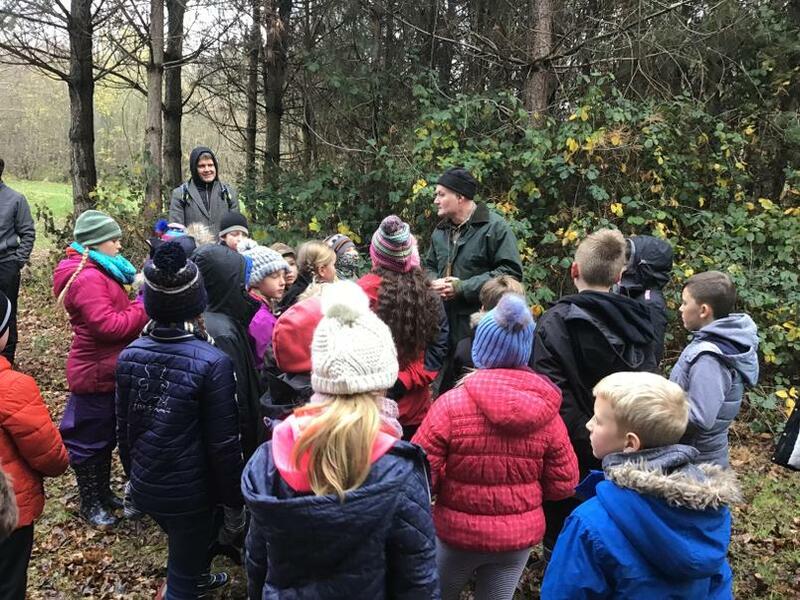 What a fantastic time we had at Grangewood Farm and Forestry! 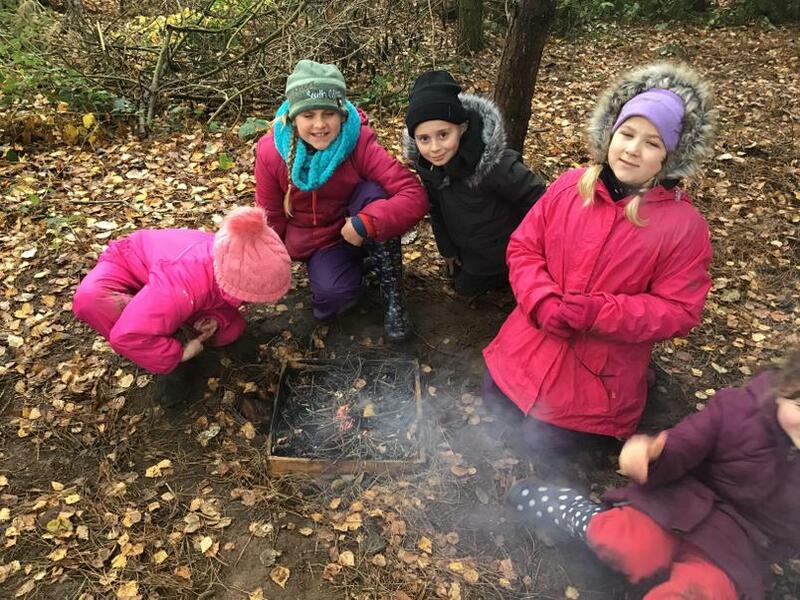 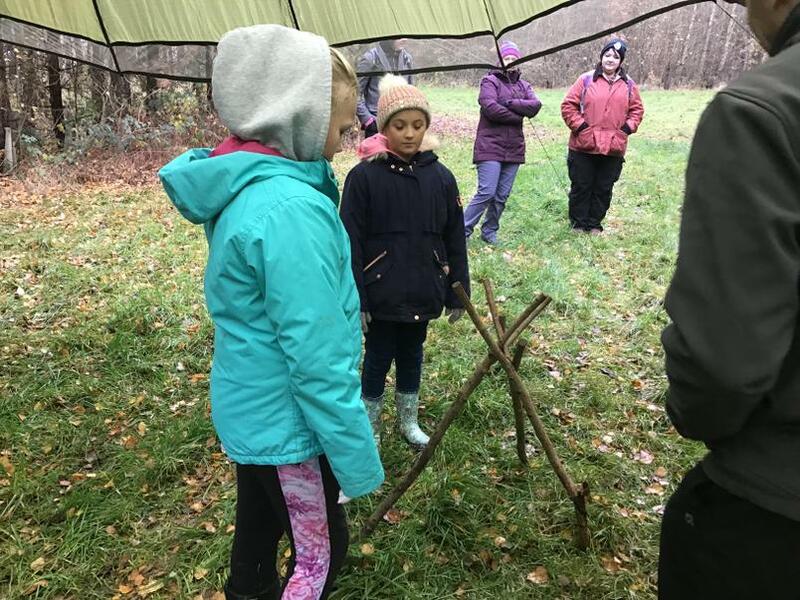 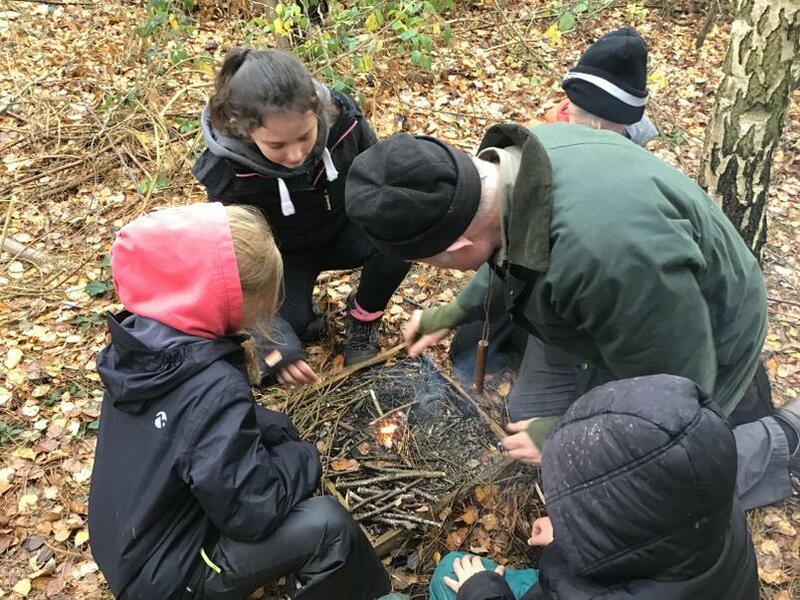 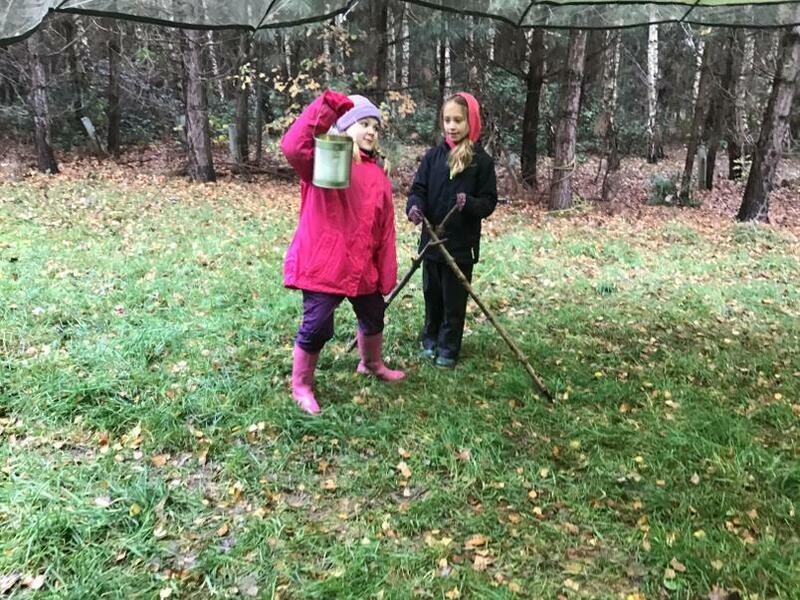 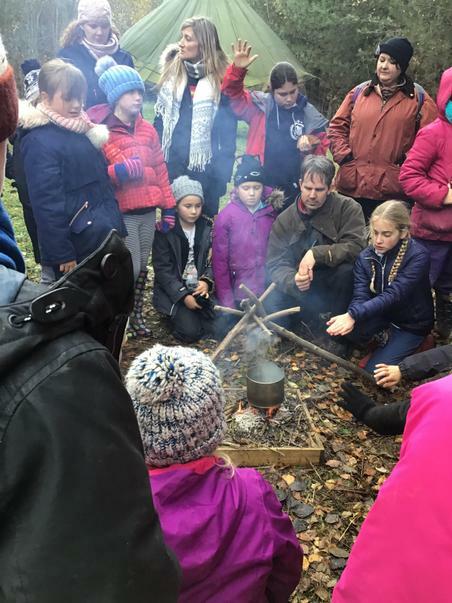 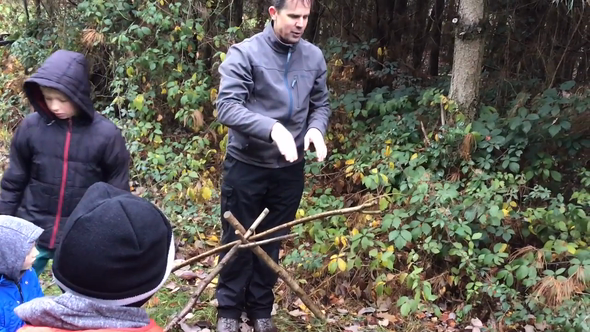 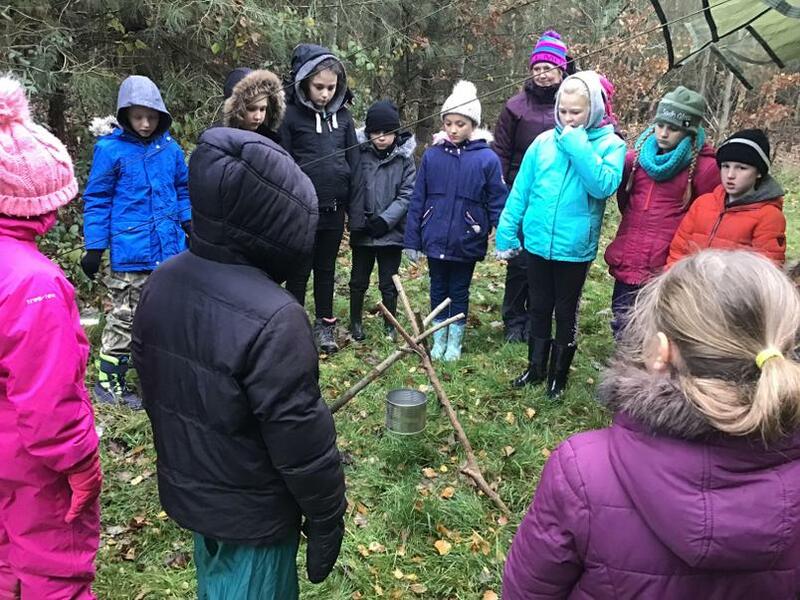 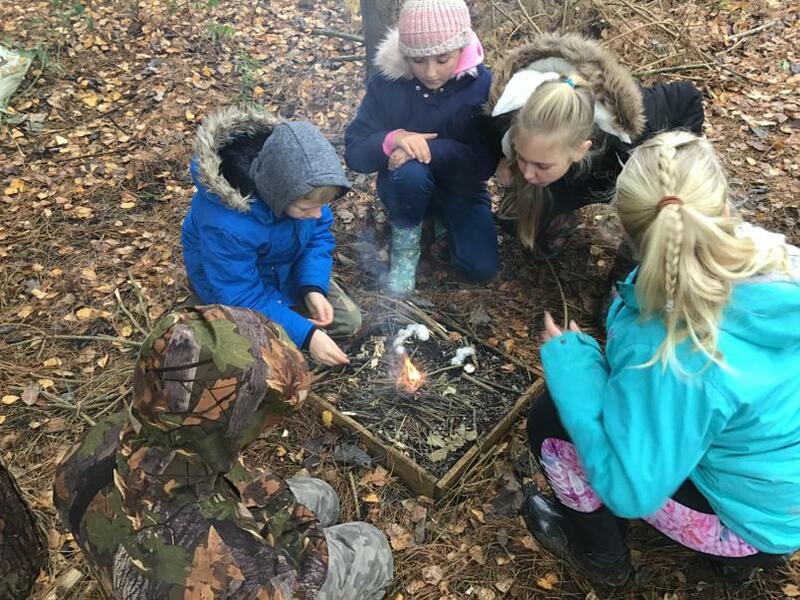 We learnt how to purify water, how to light fires and how to build a tripod to cook food and boil water. 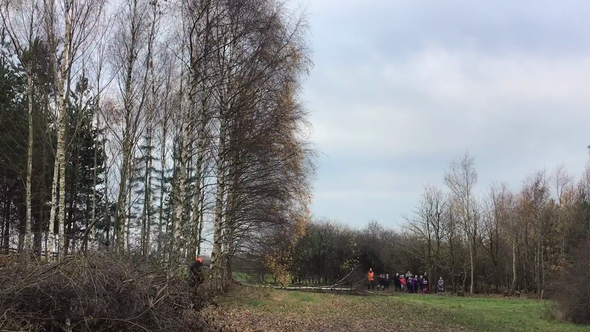 We we also got to watch the felling of a tree! 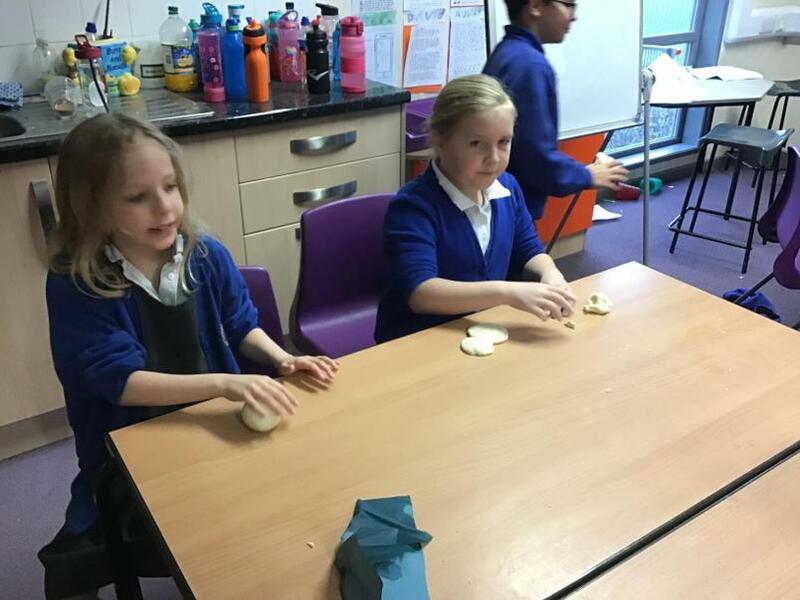 The children in Fox Class are very excited to be starting the Christmas play songs! 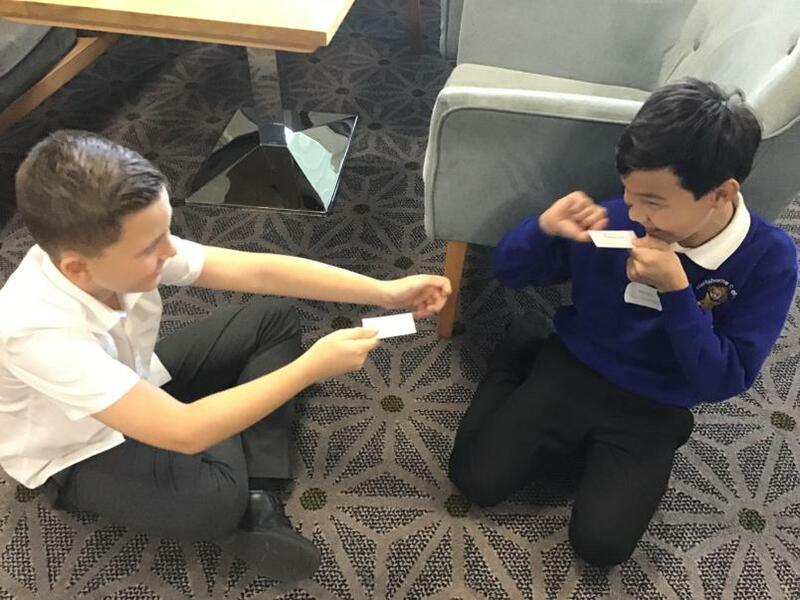 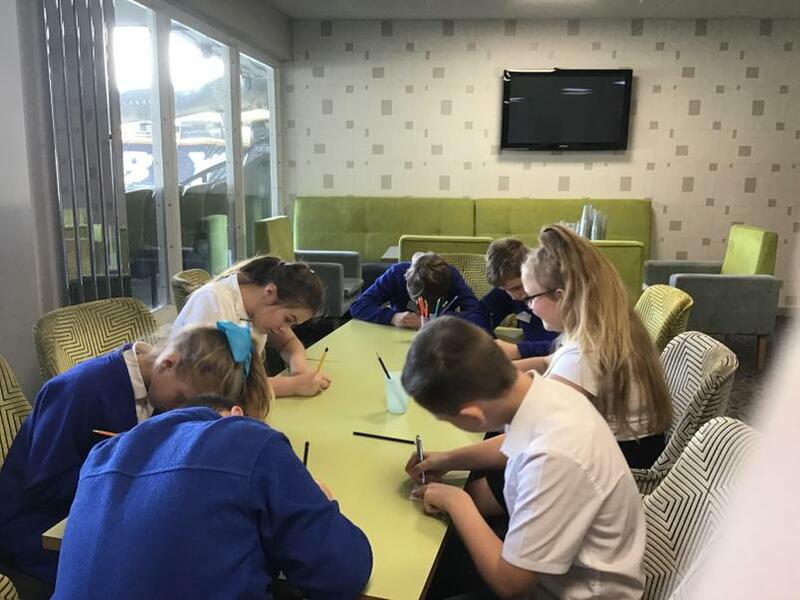 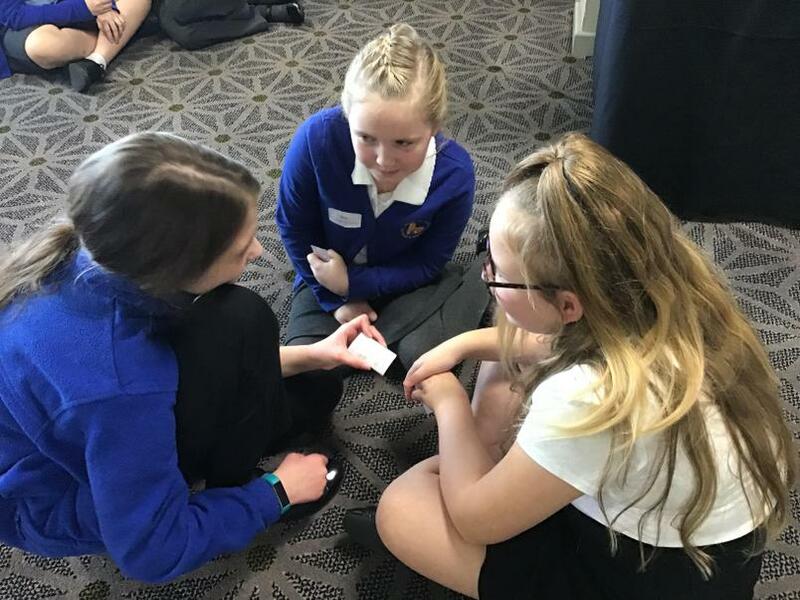 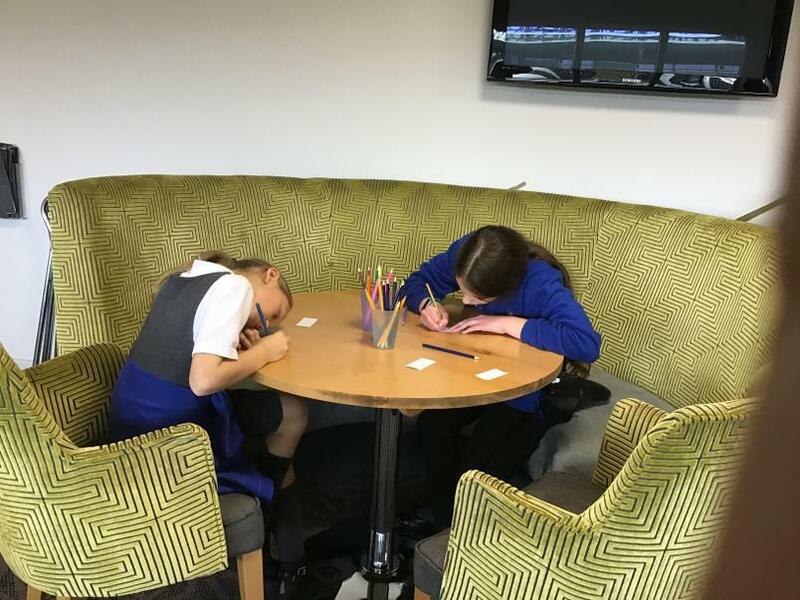 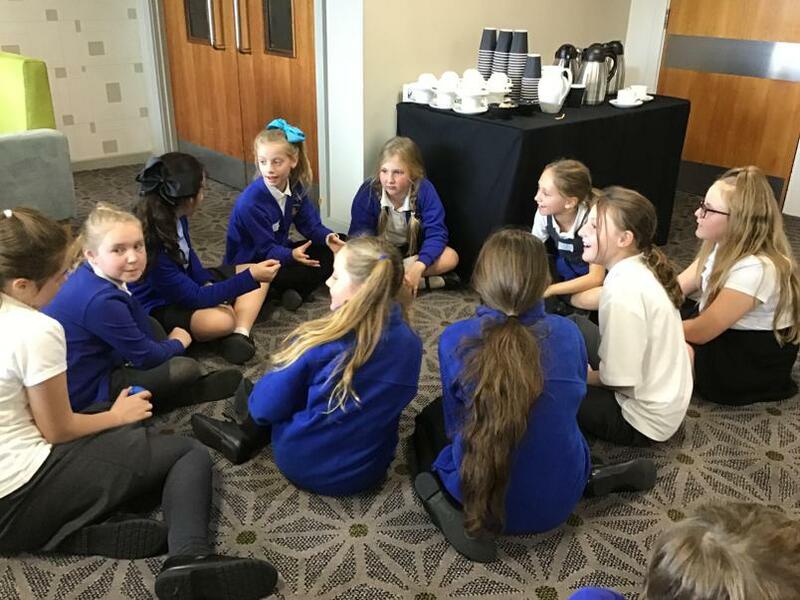 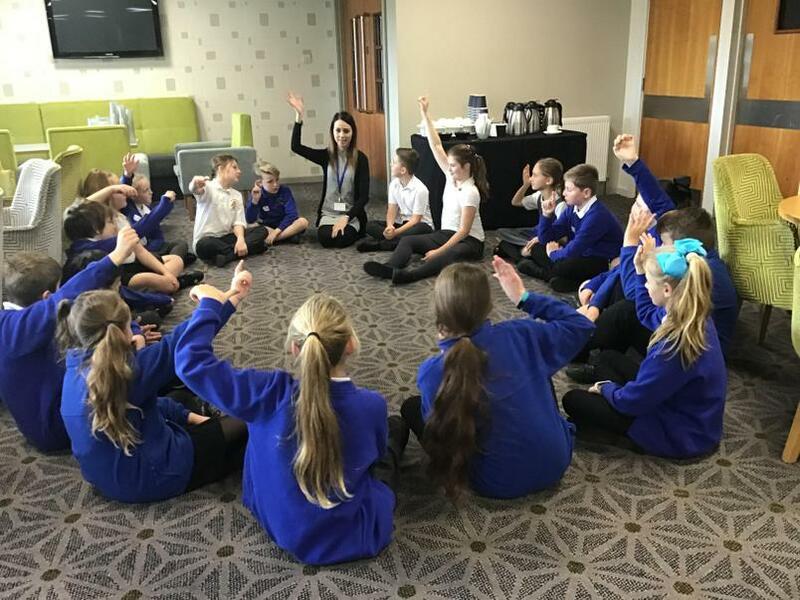 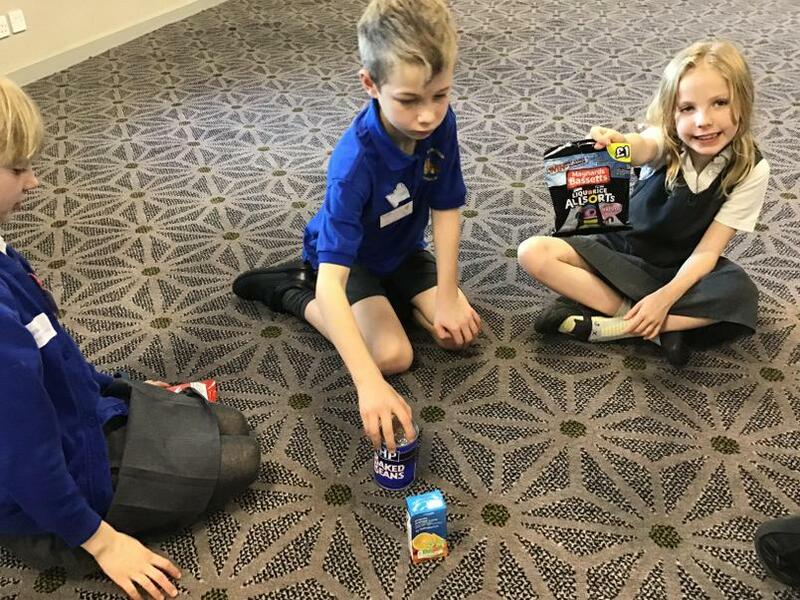 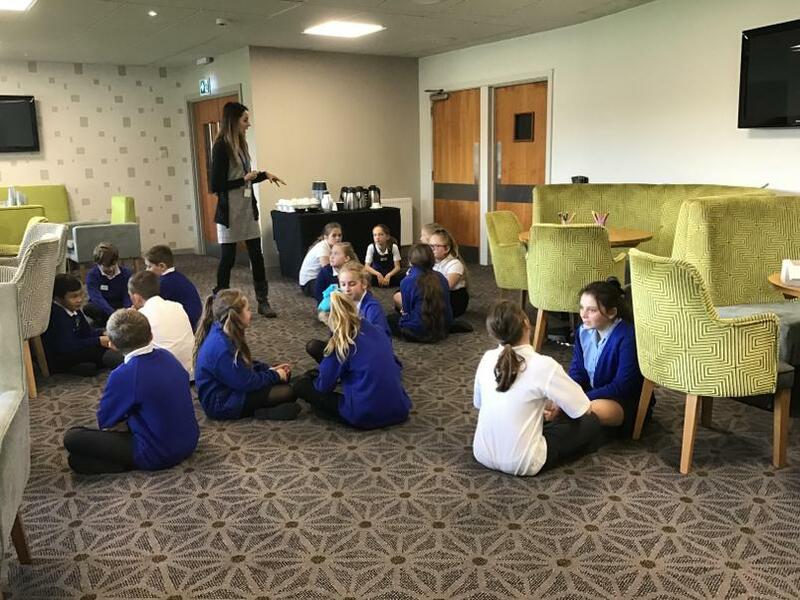 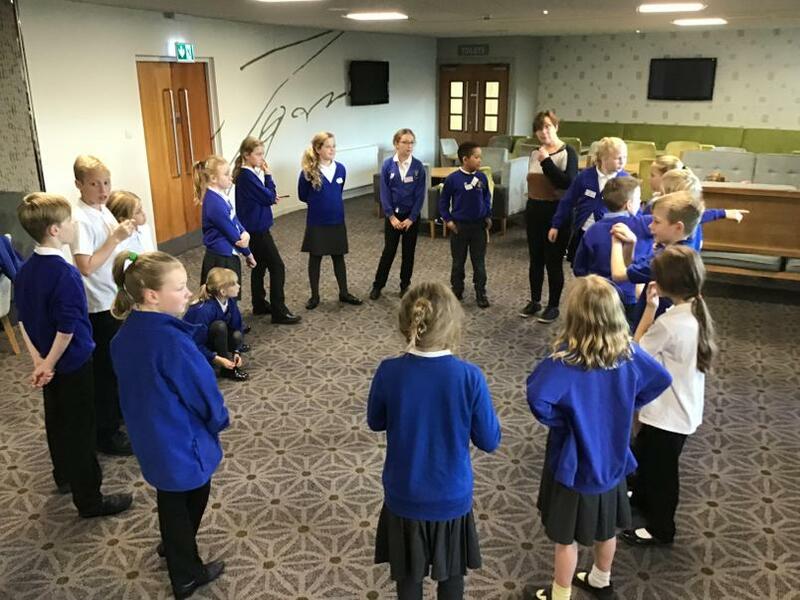 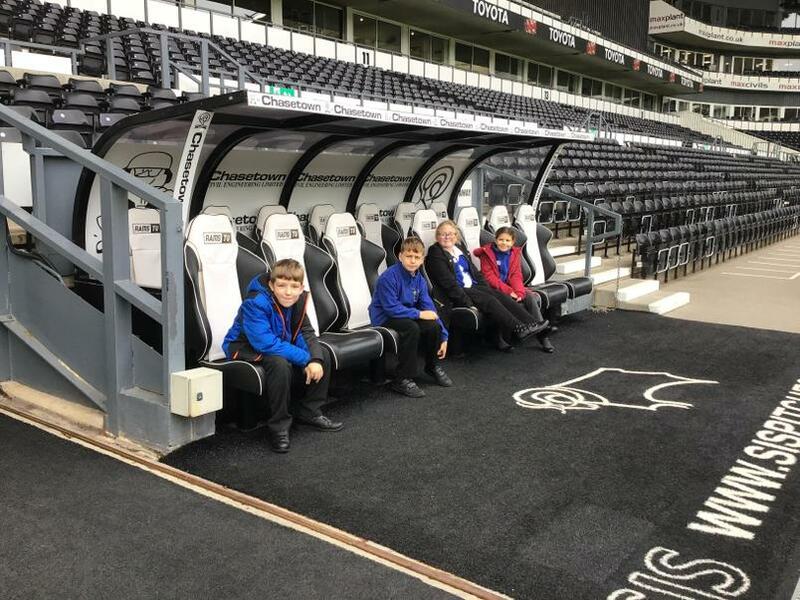 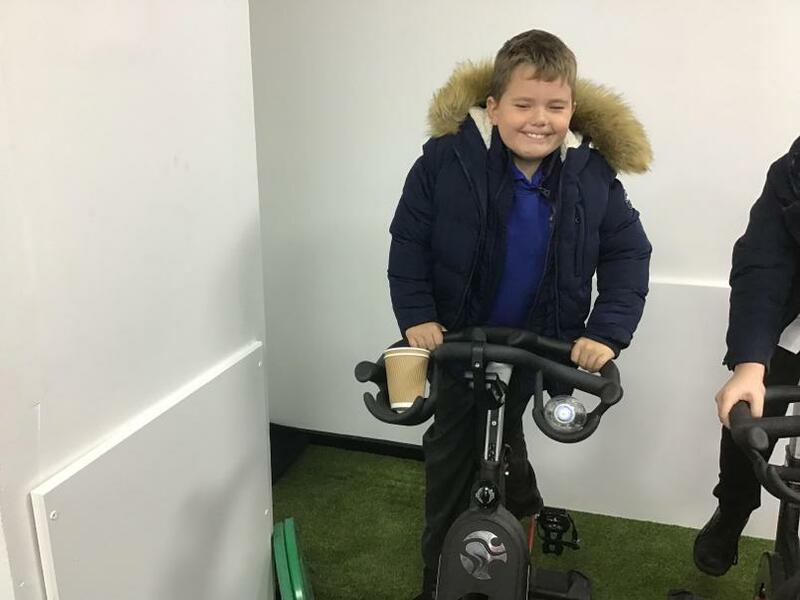 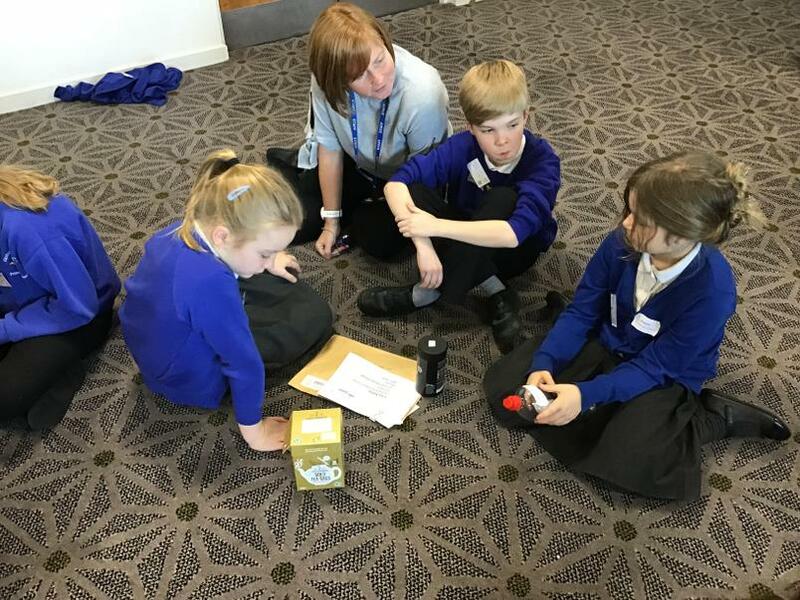 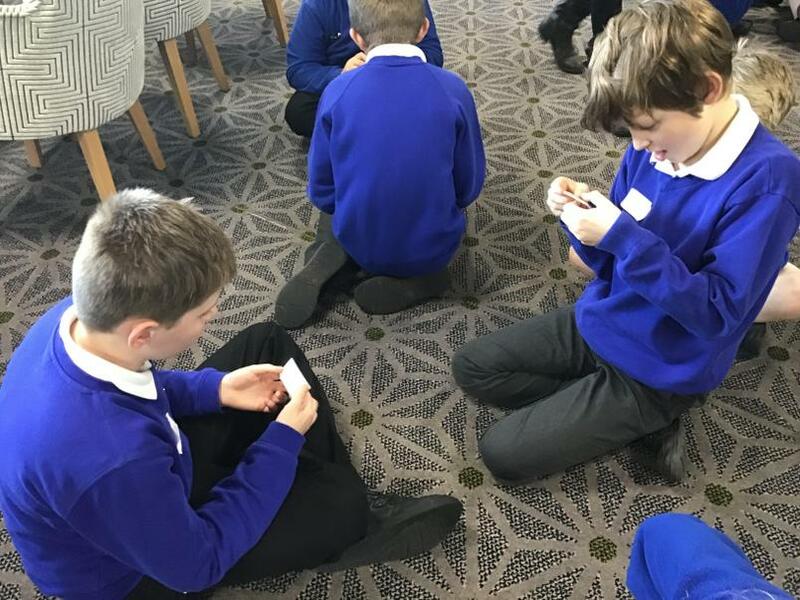 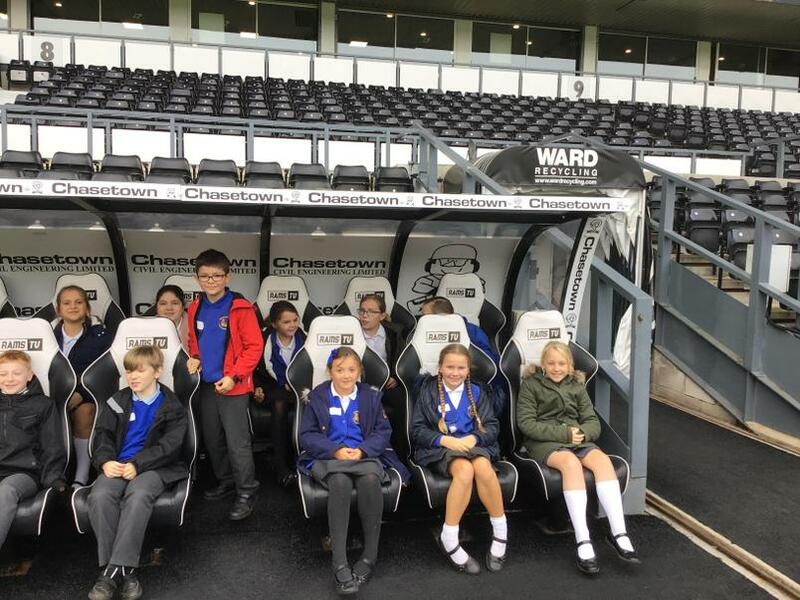 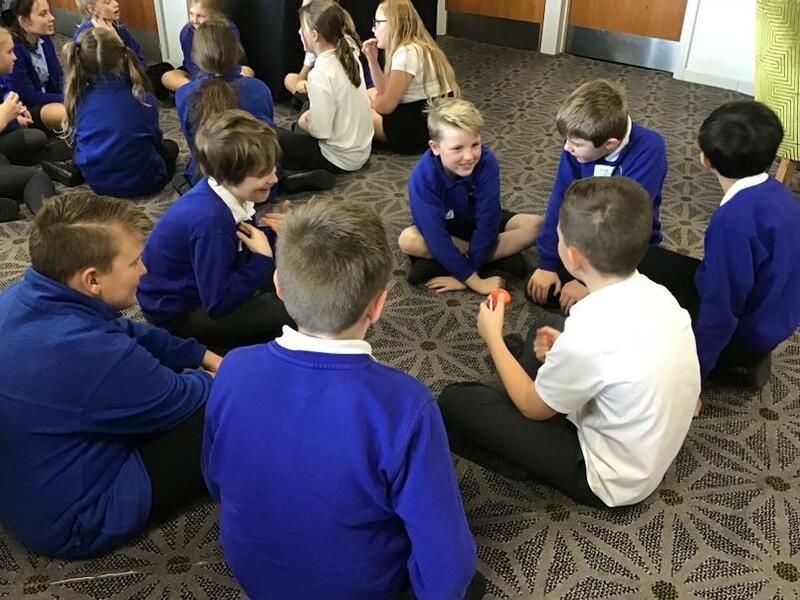 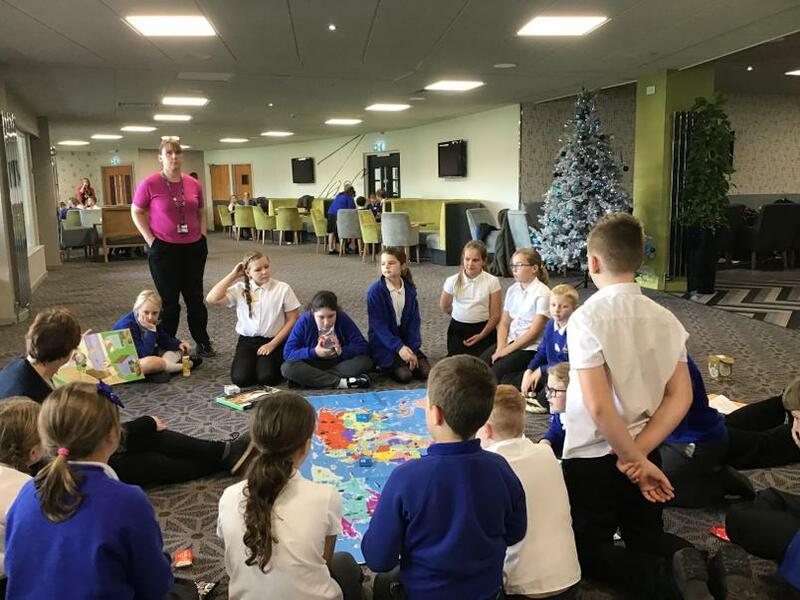 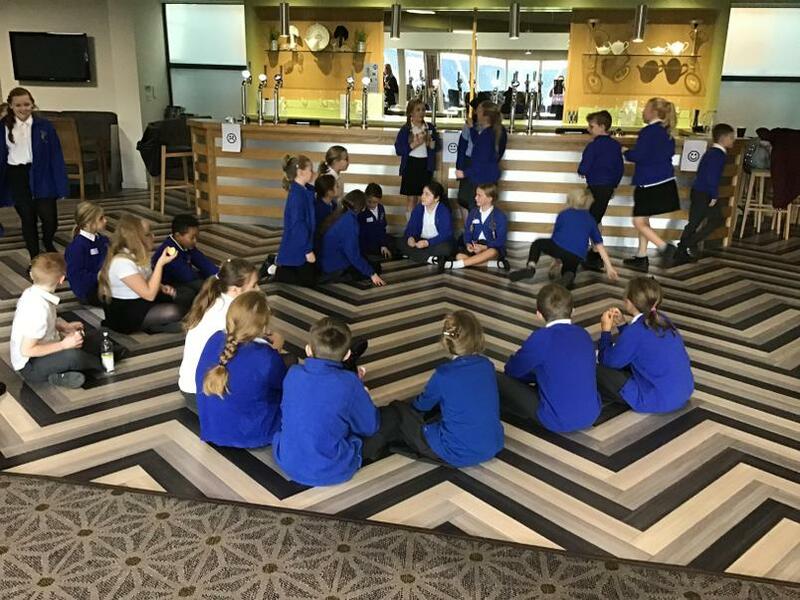 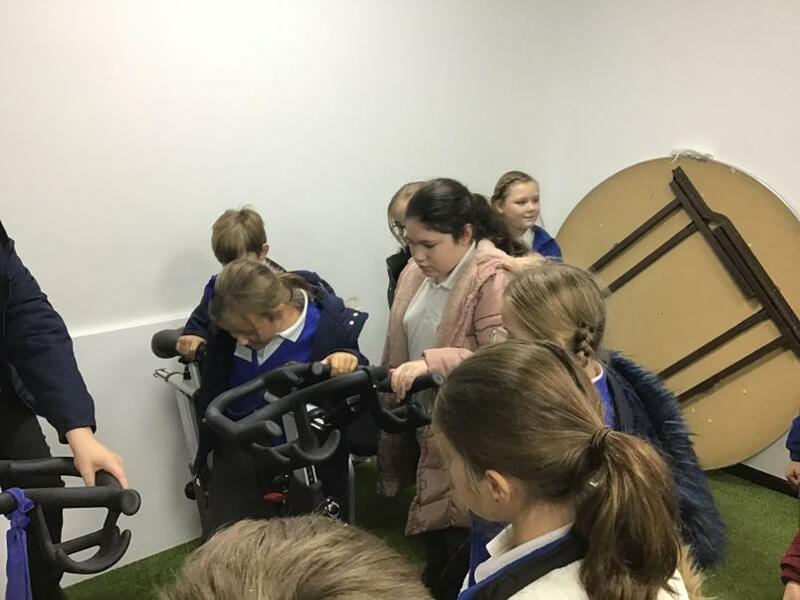 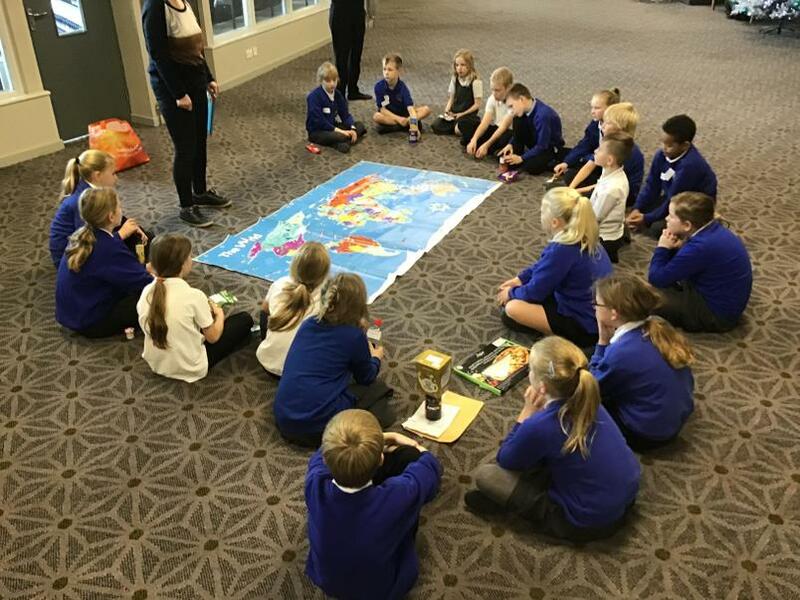 Fox Class had a fantastic time at Pride Park yesterday, meeting their link school class! 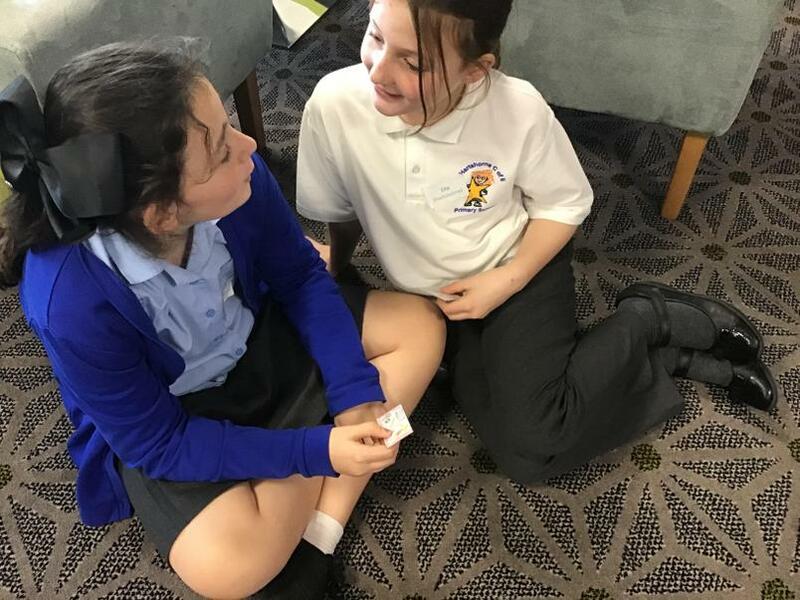 They learnt a lot about each other and made new friends! 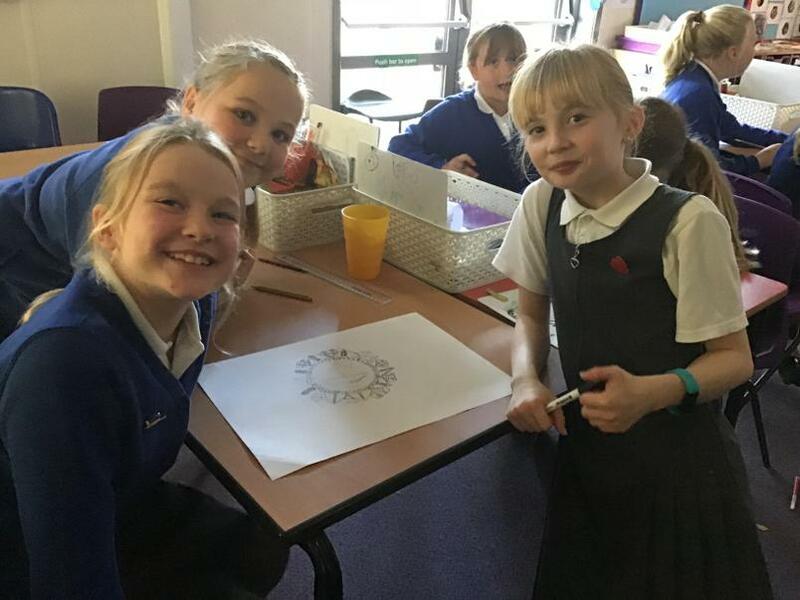 This week is Anti-Bullying Week 2018 and in Fox Class we are celebrating friendship and individuality! 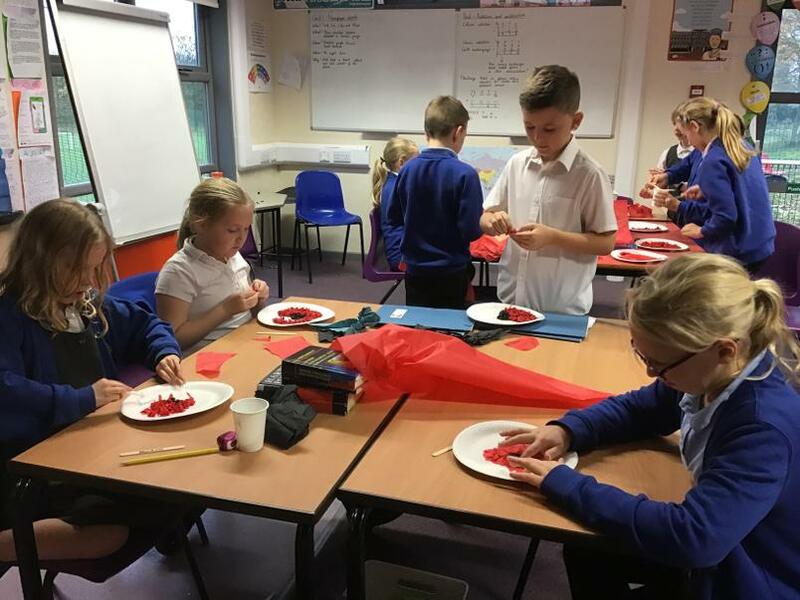 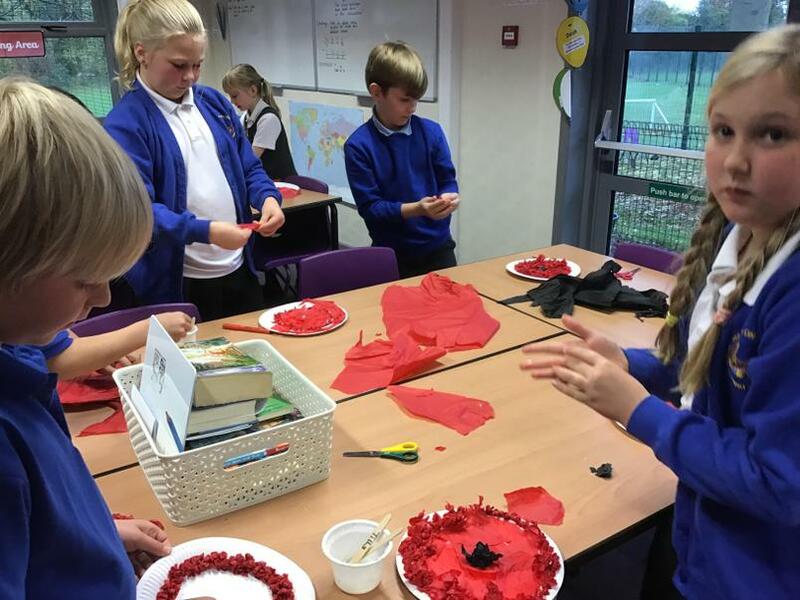 We spent the afternoon celebrating Rememberance Day making poppies and understanding what they represent! 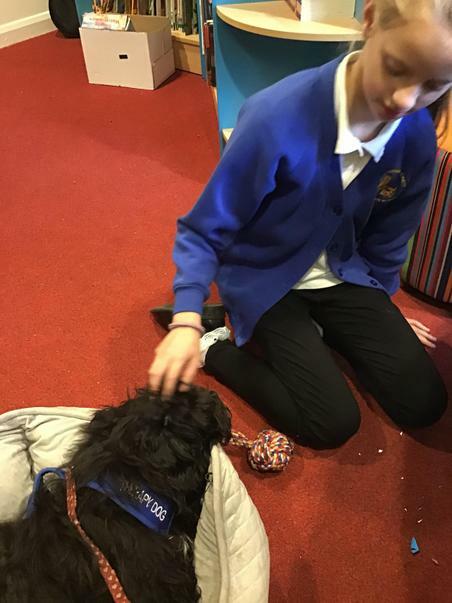 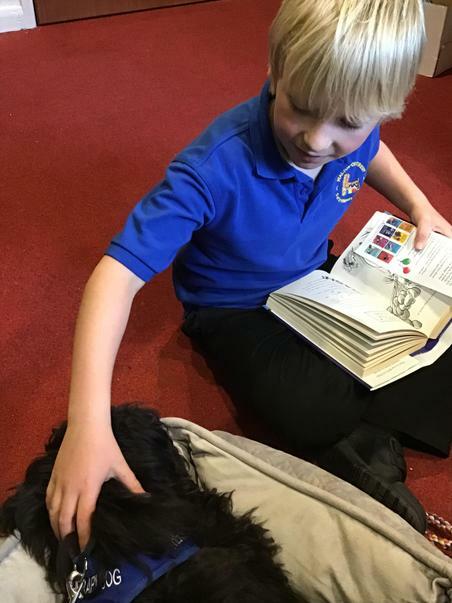 A few of our children were lucky enough to read with our new therapy dog! 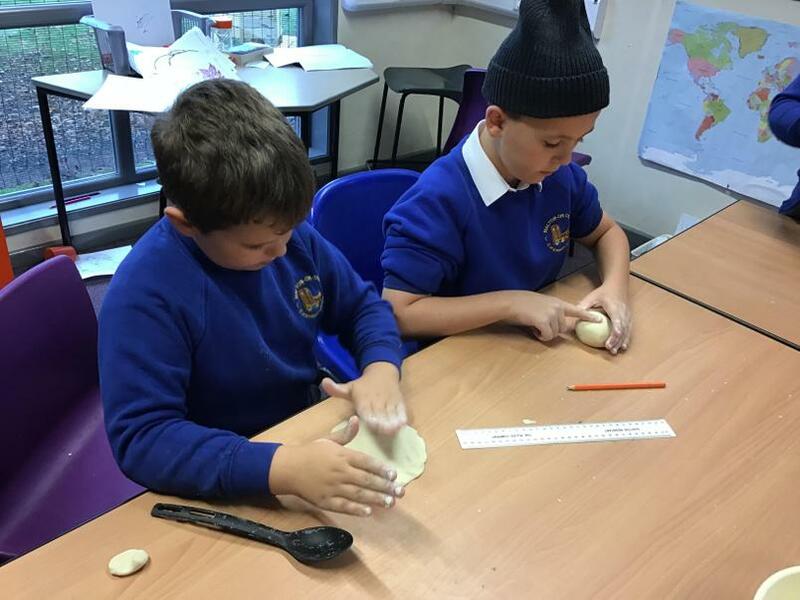 We started our Around the World topic in Geography, today. 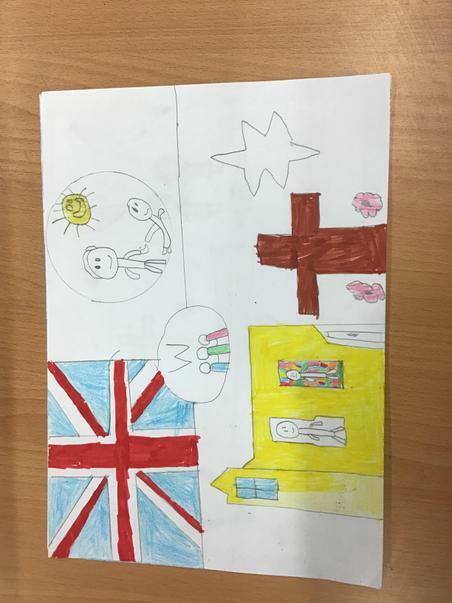 We found out lots of fantastic facts about Australia and designed our own flag, symbolic of Walton School! 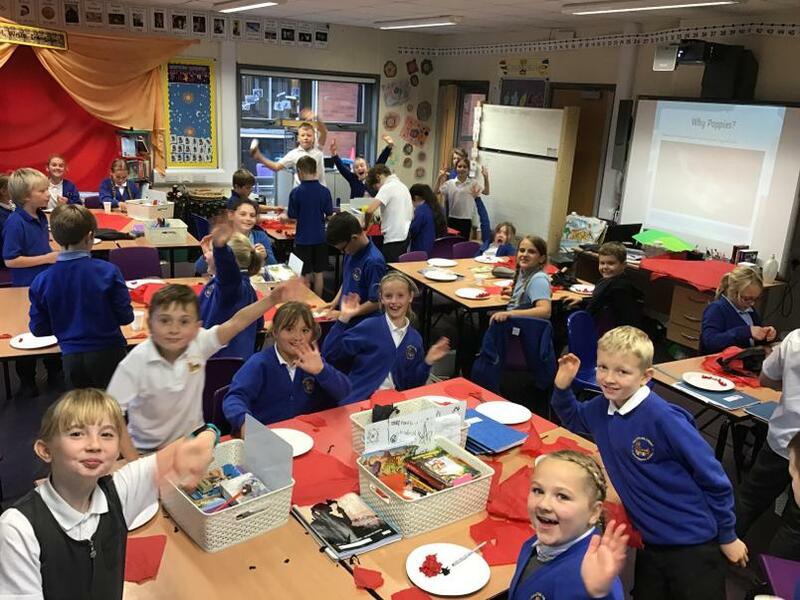 Here's hoping you've had a fantastic half-term and you're ready to come back ready to fill those heads up again with lots more knowledge! 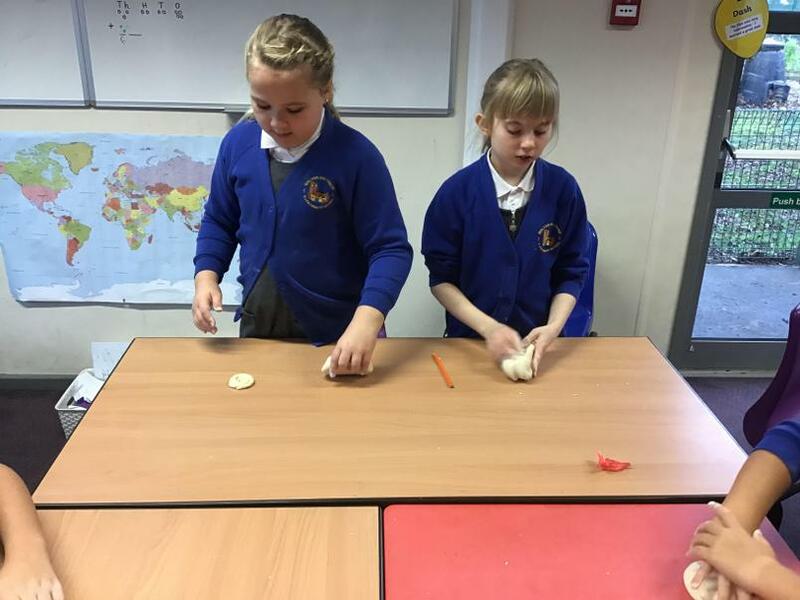 This half term our topic is: Around the World in 35 Days! 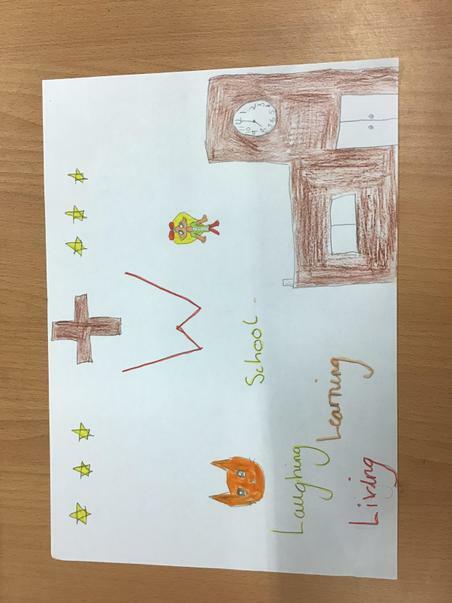 - English: Writing a newspaper article, writing a letter, writing a diary and writing instructions. 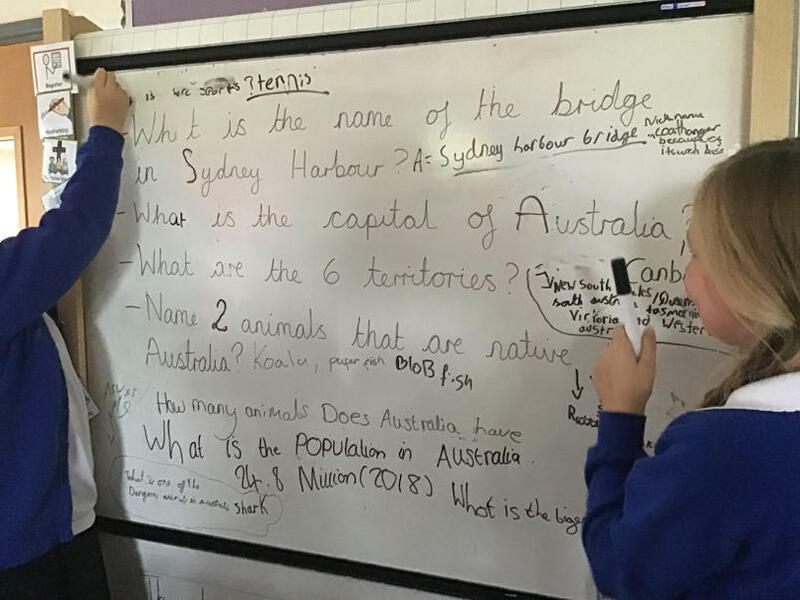 - Geography: Human Geography - World Landmarks! 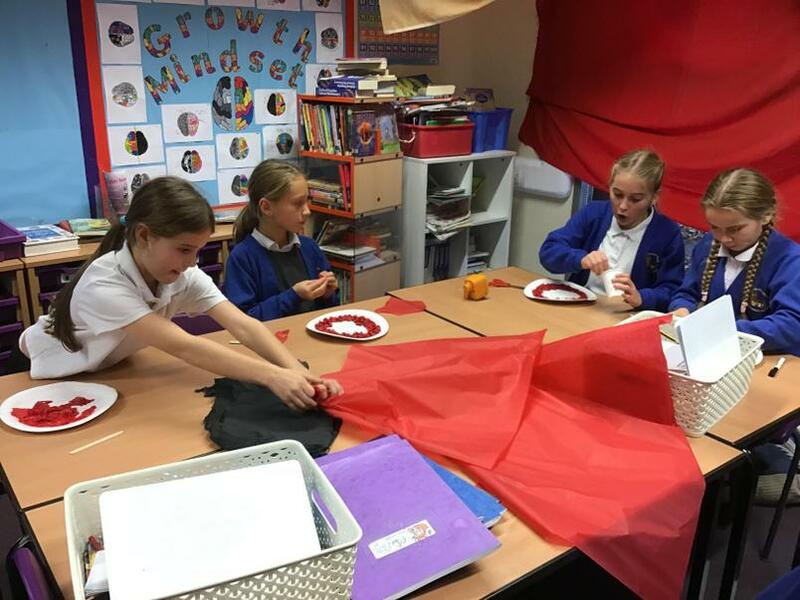 - Art: Sculpture - we will be using recycled materials to sculpt a world famous landmark*. 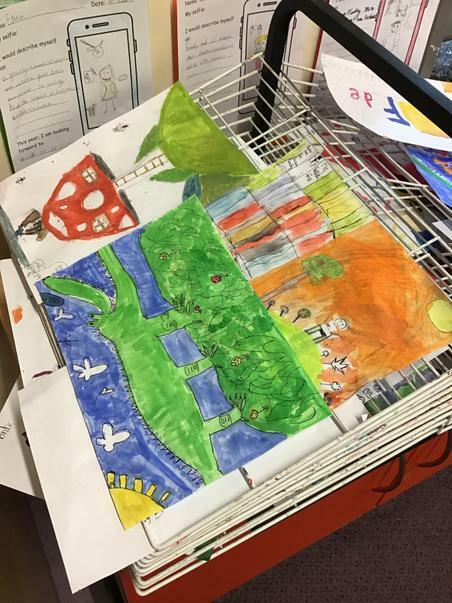 *For Art: please could children and parents save any recyclable materials (e.g. 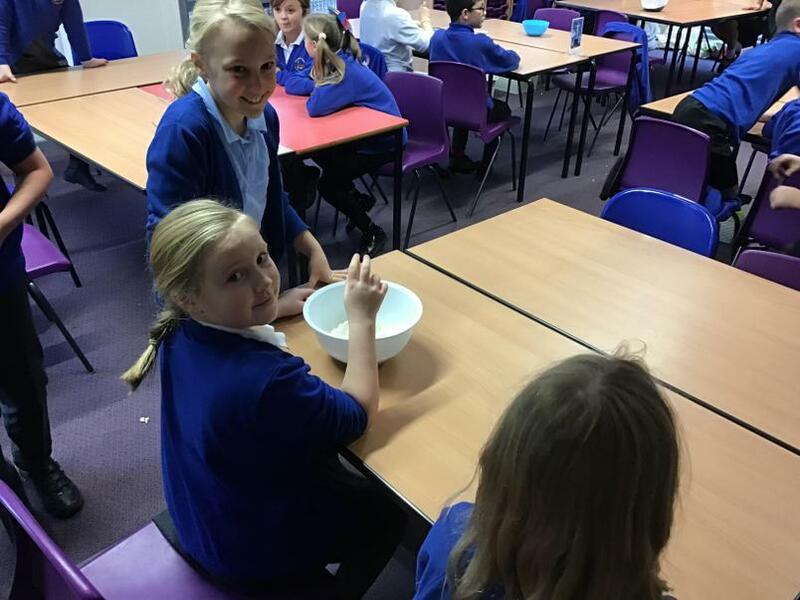 cereal boxes, water bottles, newspapers etc...) and bring them into school during the first few weeks back. 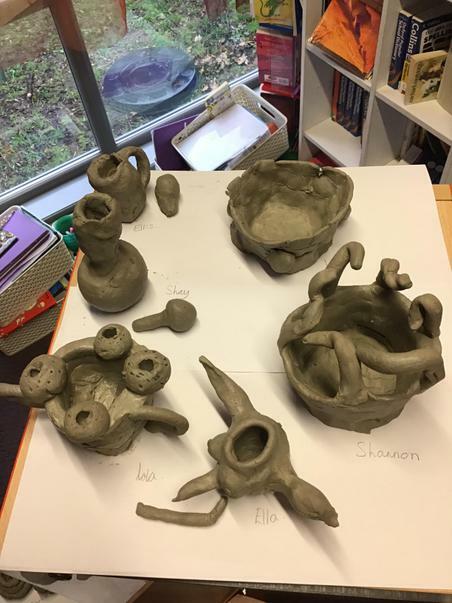 This would greatly help the children with their sculptures. 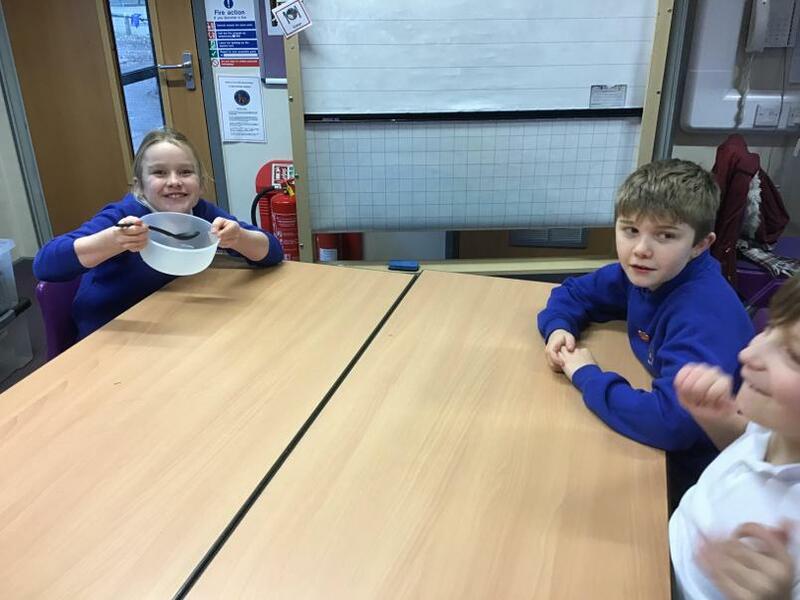 We do request that no cardboard toilet roll tubes come into school for health and safety reasons, please! 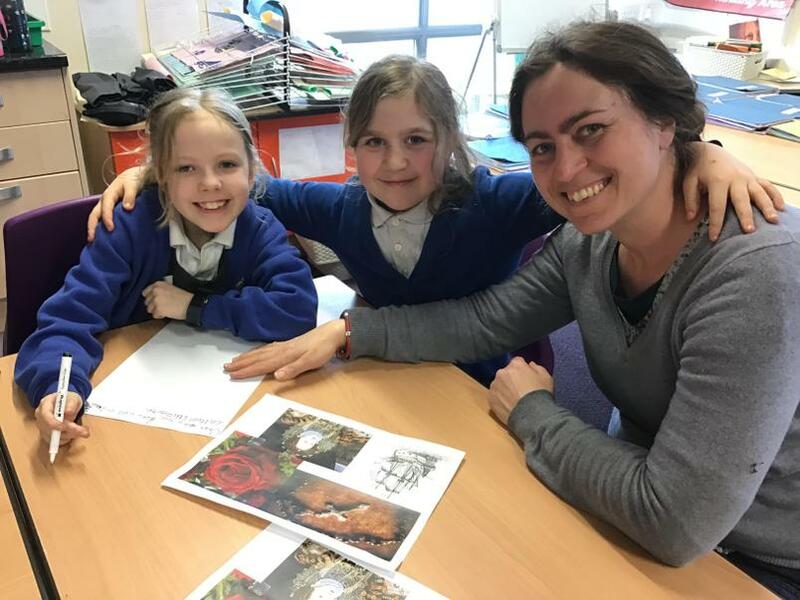 Our topic this half term is Hard-working Humans and Amazing Animals! 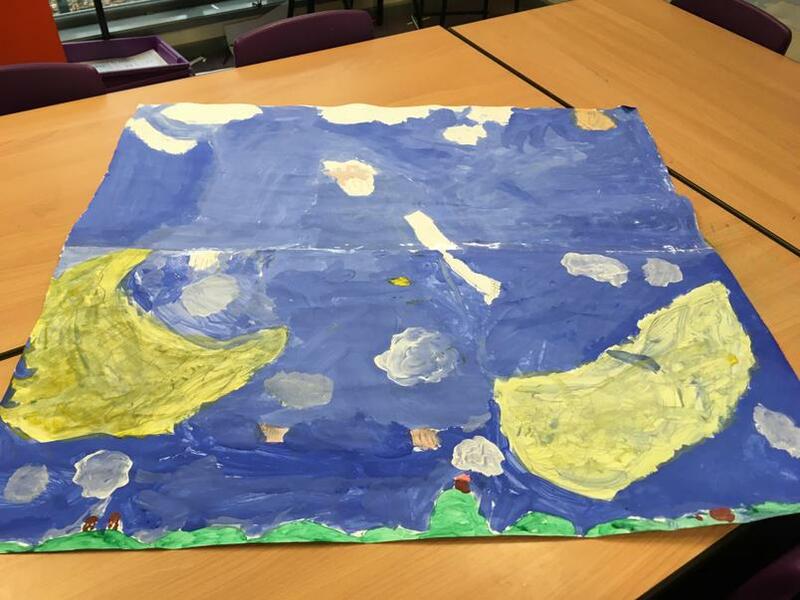 What a fantastic RE/Art project we have completed this week. 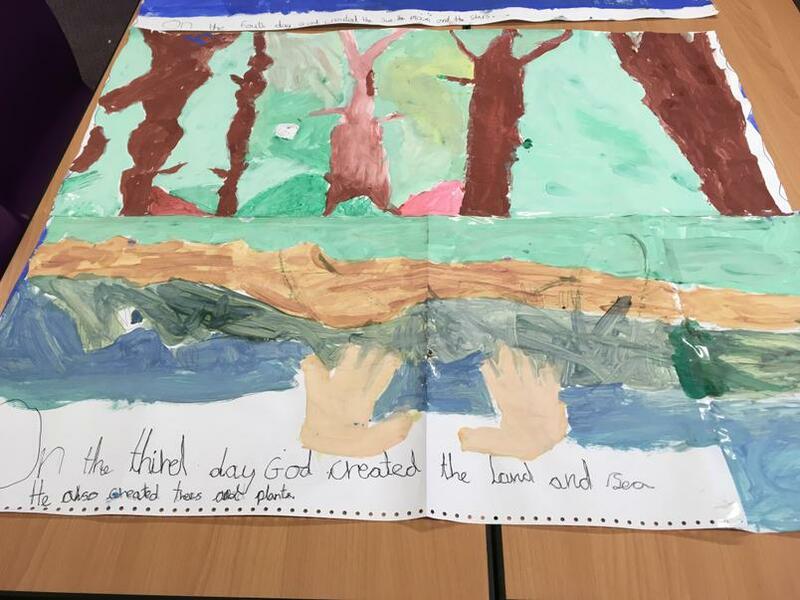 We have learned about the Christian Creation Story and painted each day onto a huge piece of paper! 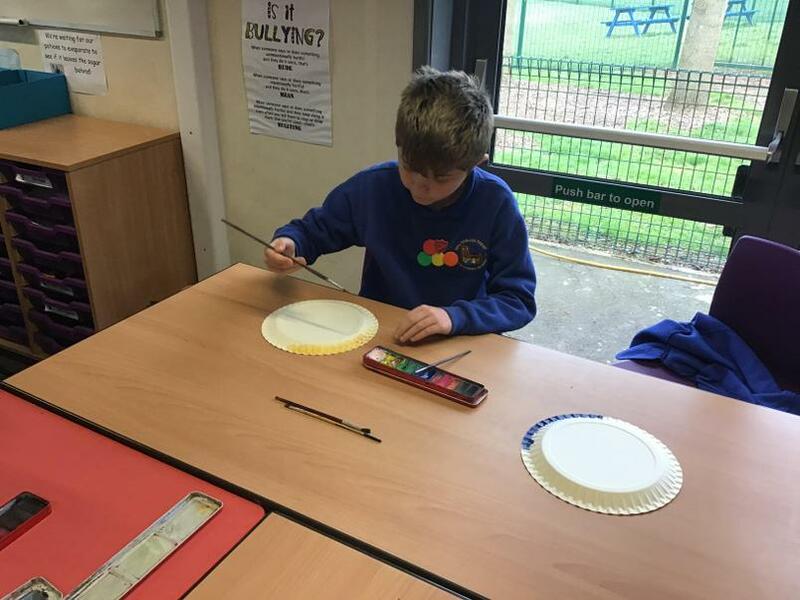 Huge congratulations to our Table Tennis boys - you did a fantastic job and worked brilliantly as a team! 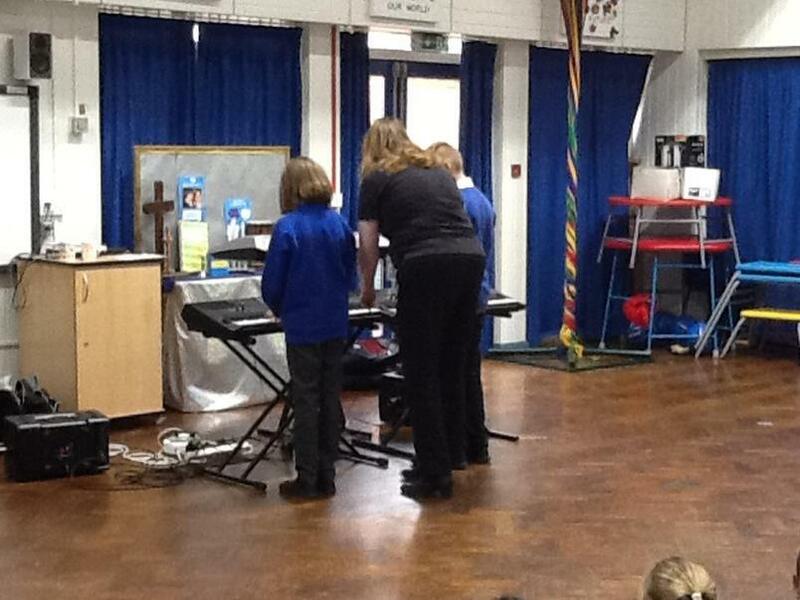 We joined in with a phenomenal Yamaha performance on Wednesday afternoon. 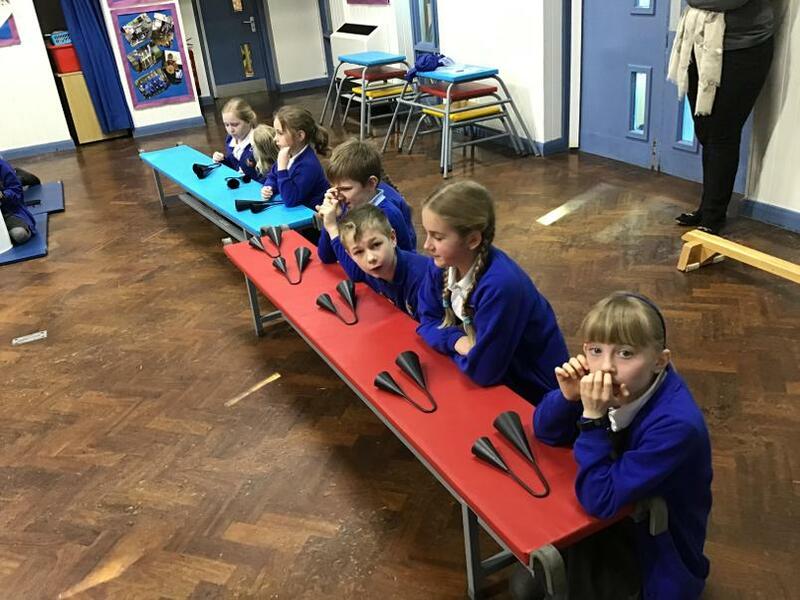 Letters have gone home offering keyboard classes for your children. 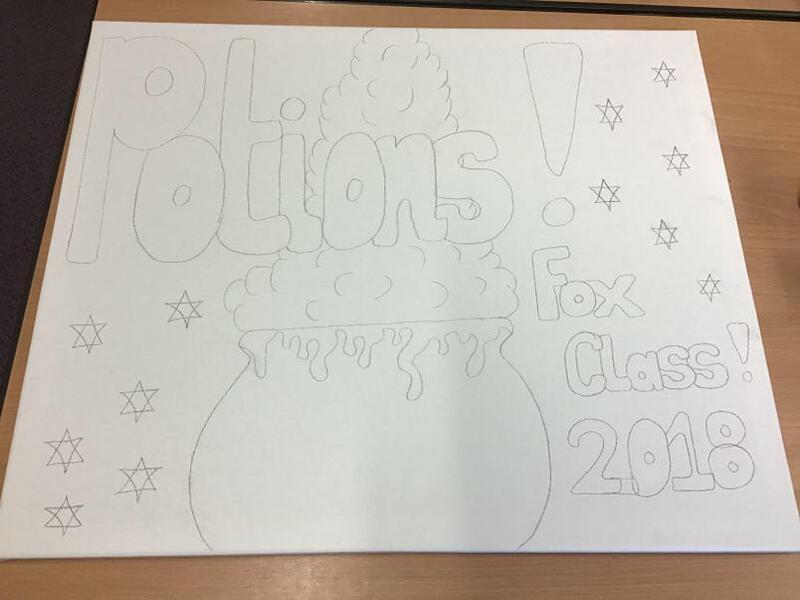 Remember to sign the form and hand it to the office or the class teacher if you want to take part! 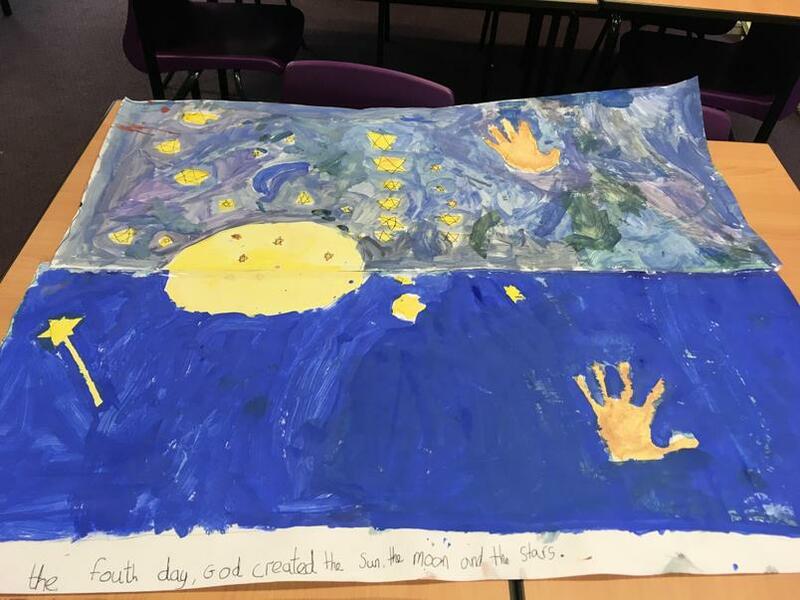 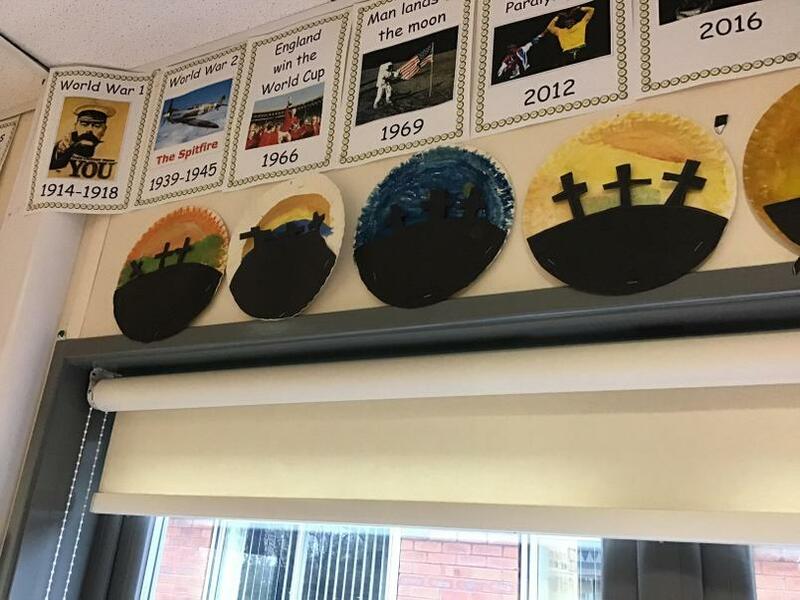 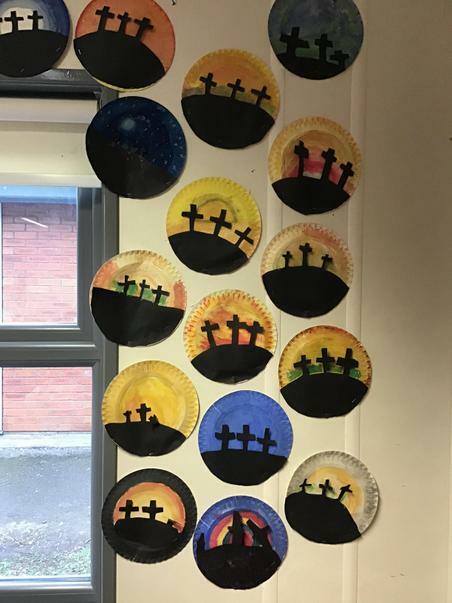 We've had a fantastic time creating a huge art project based on the Christian Creation Story in RE. 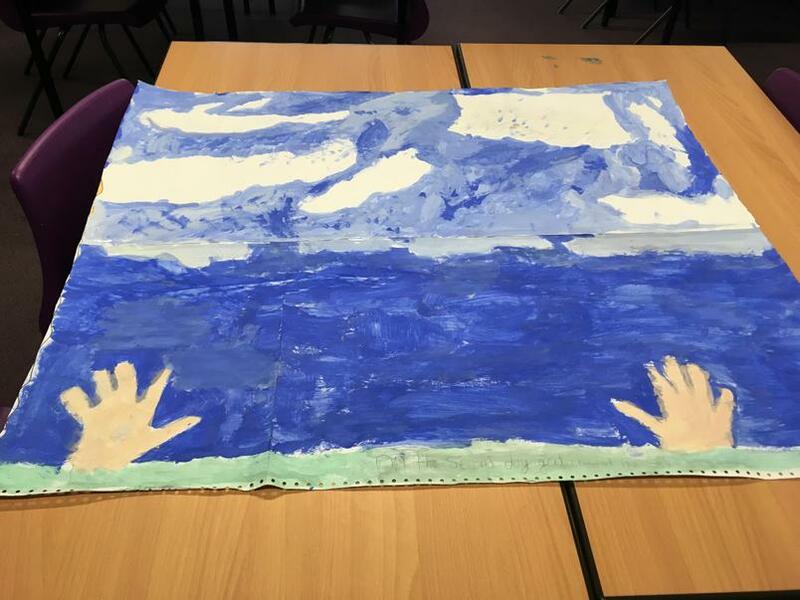 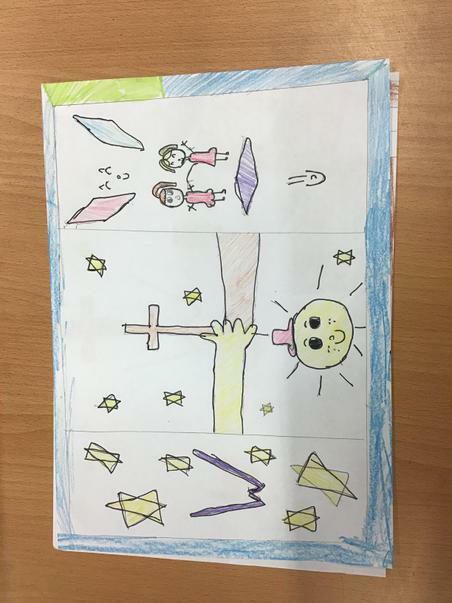 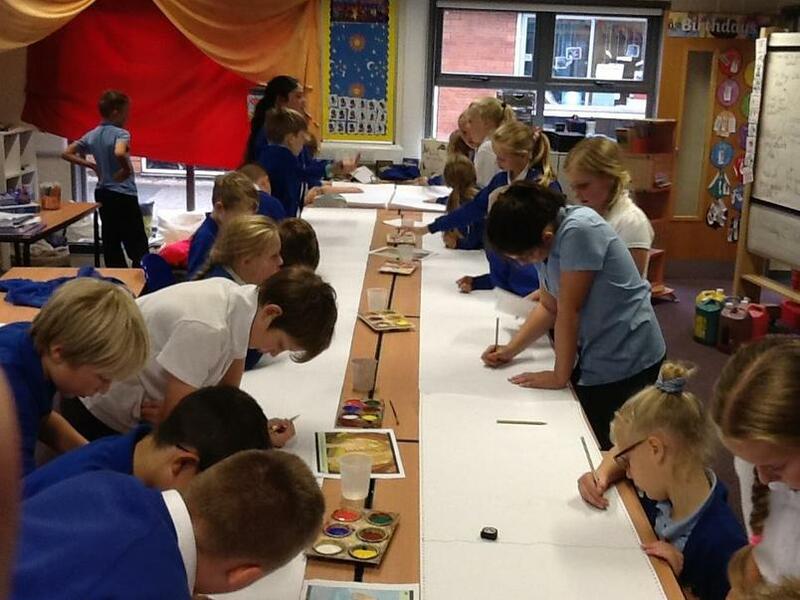 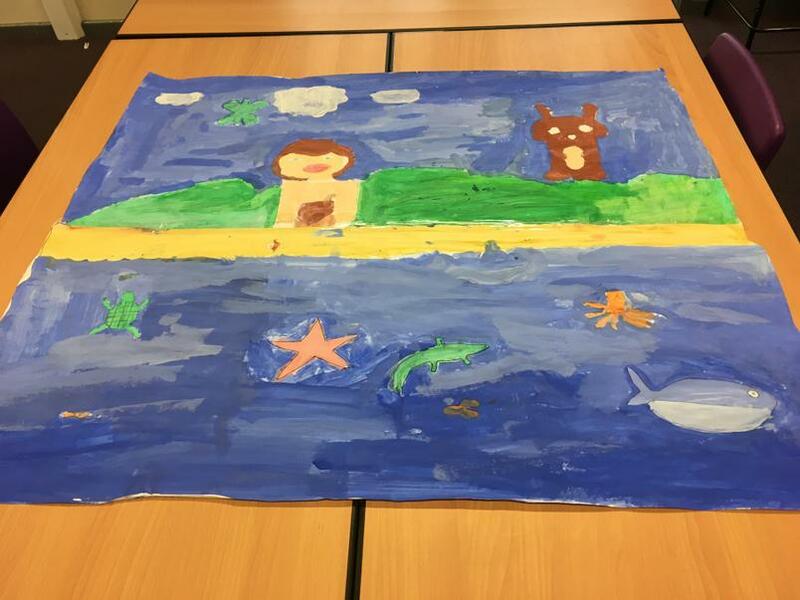 The children worked in small groups to draw and paint one day from the story onto a large banner. 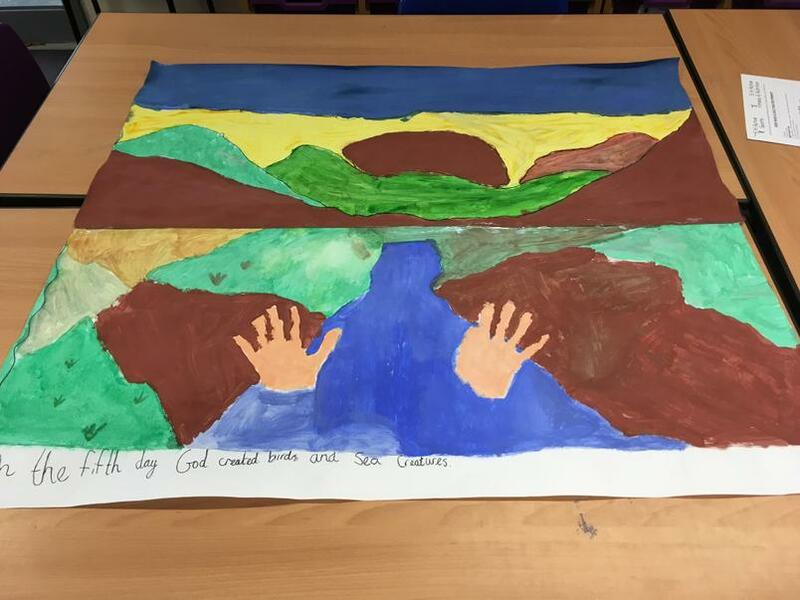 Now we just need to find somewhere to display it! 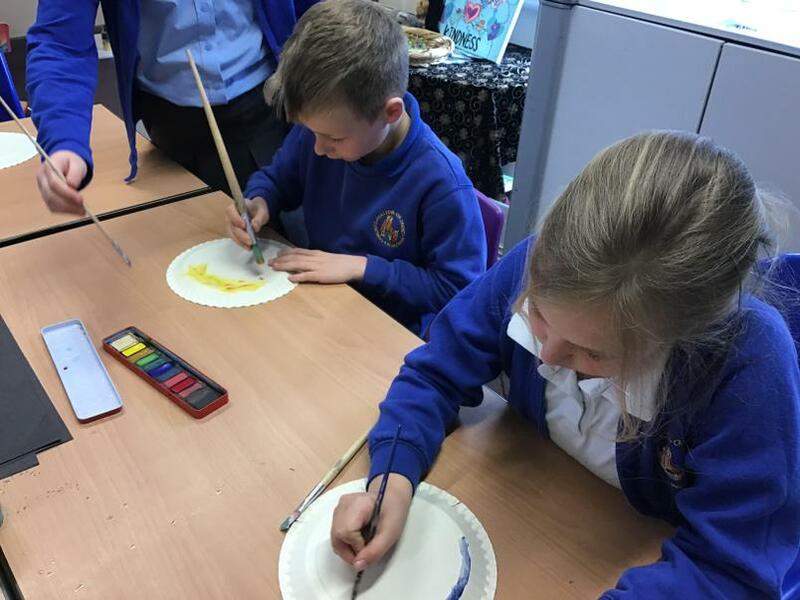 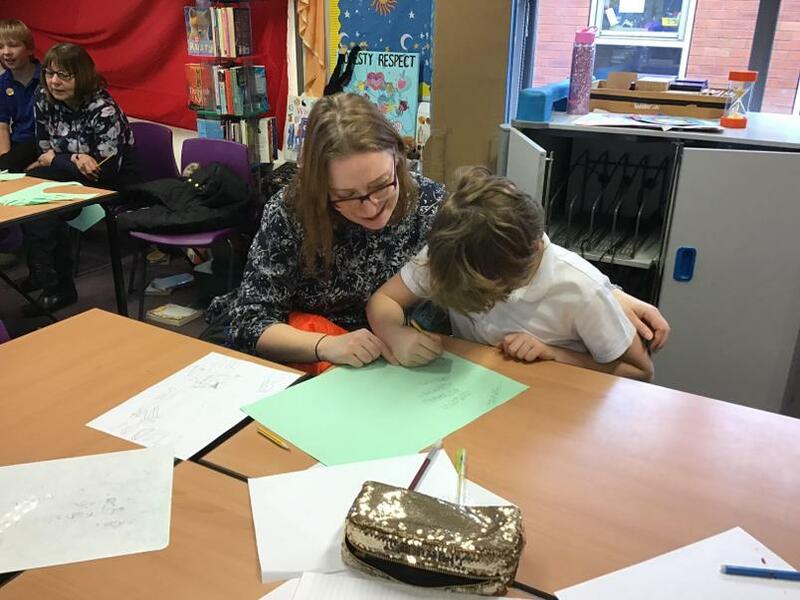 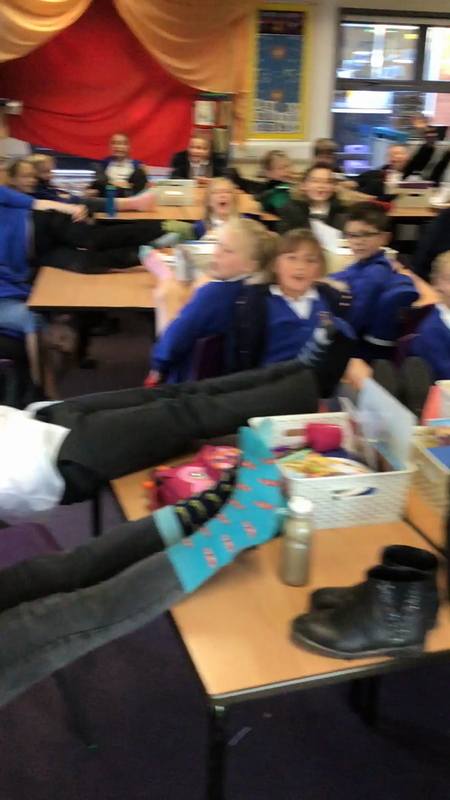 Yesterday, we celebrated Roald Dahl Day 2018. 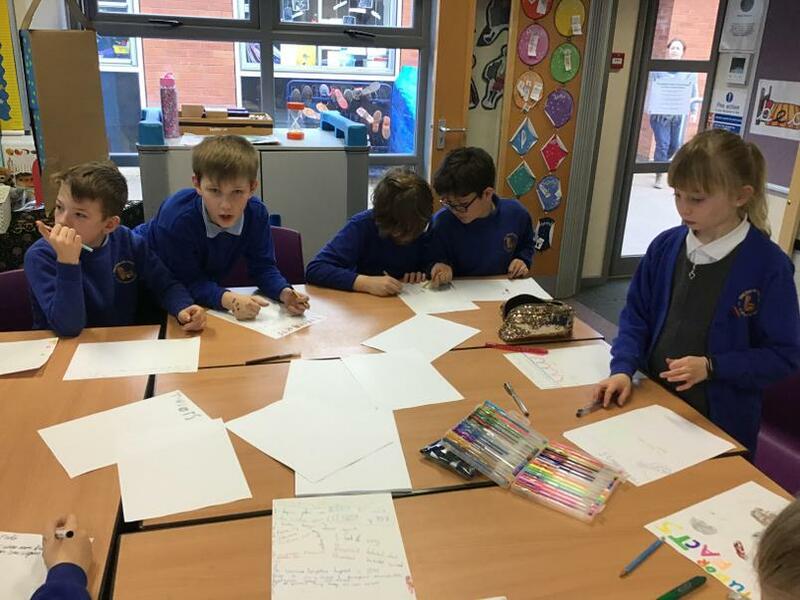 We had a great afternoon completing themed maths and creative writing challenges! 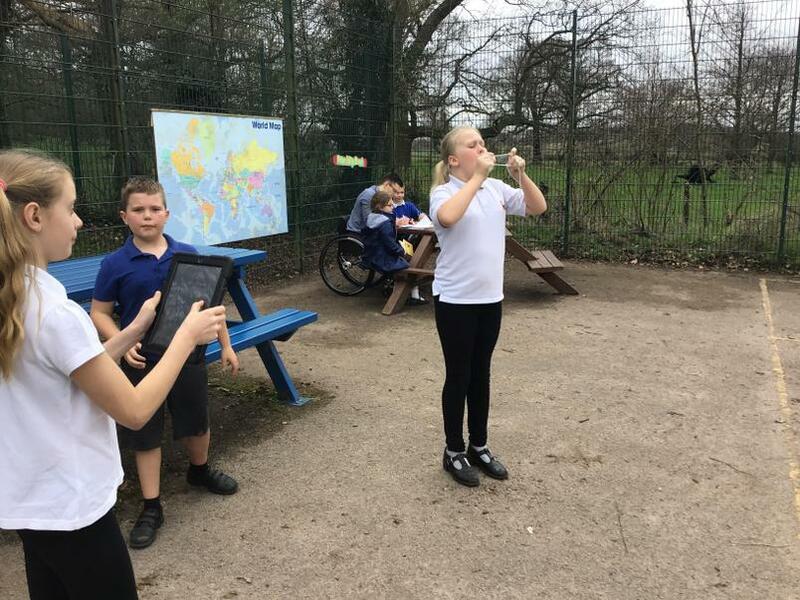 We have been enjoying practising our weekly spellings on the iPads using Spelling Shed. 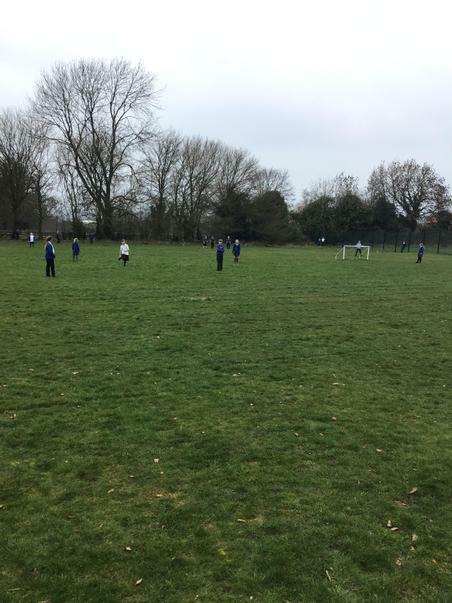 Remember, we can play on Spelling Shed at home as well and our test is on Monday afternoon! 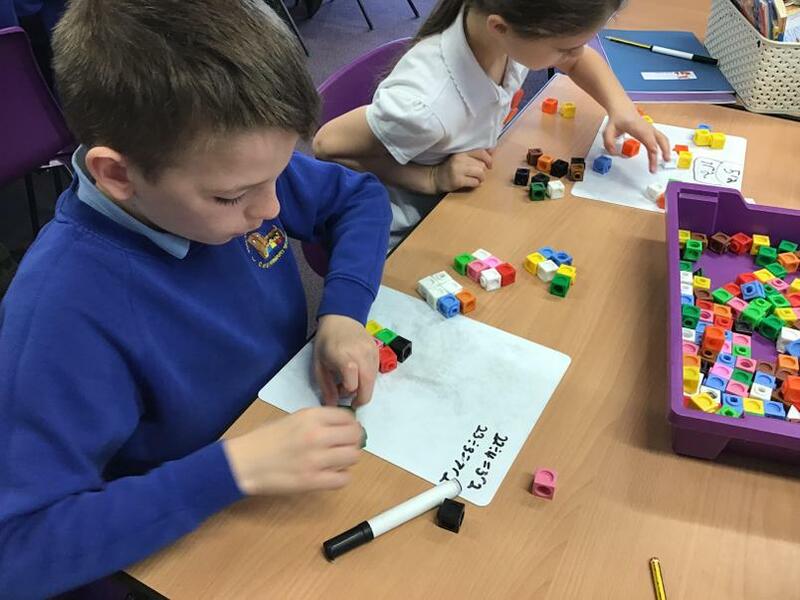 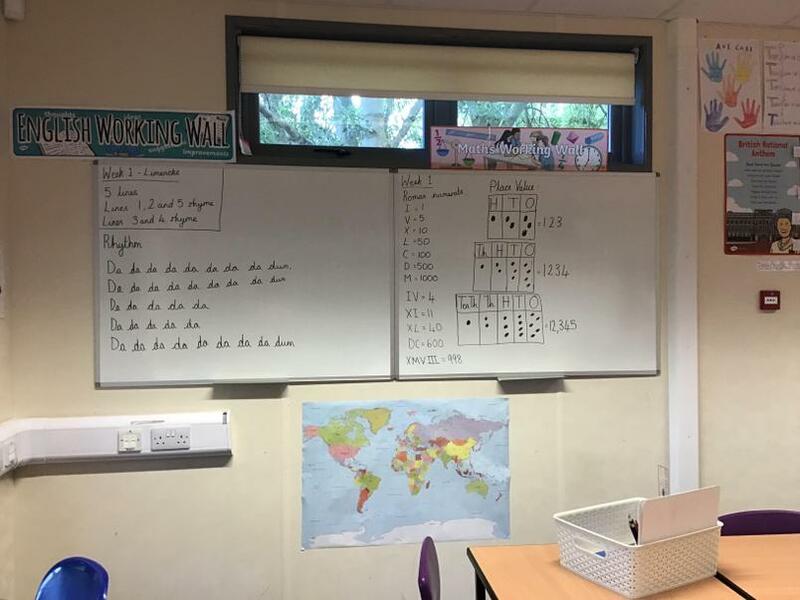 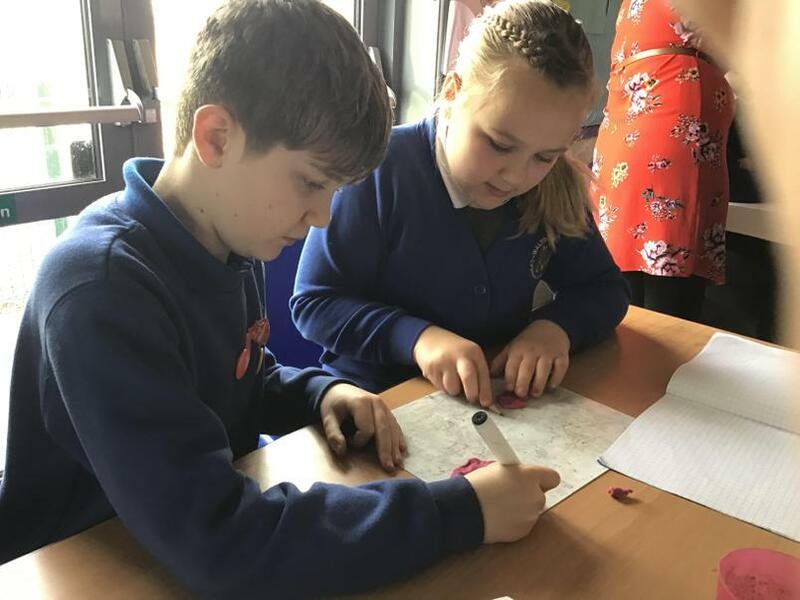 The children in Fox Class have been working very hard on their times tables! 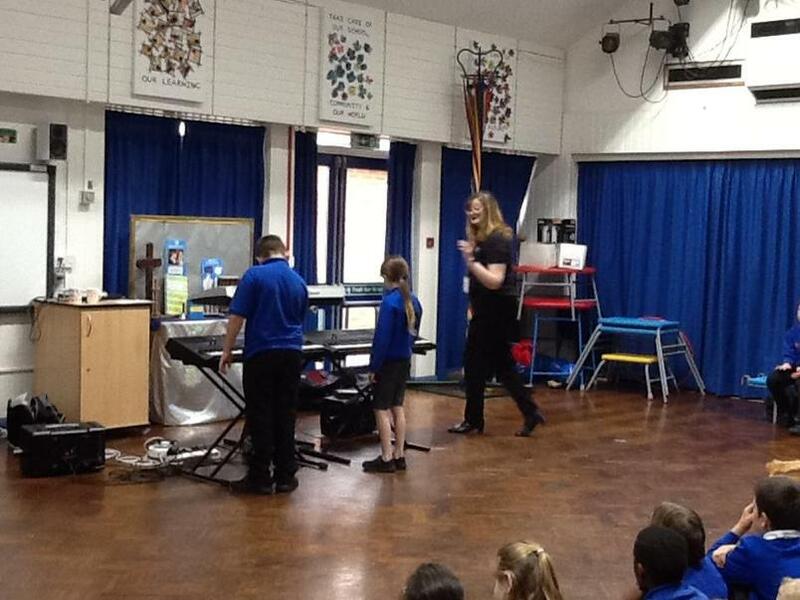 We've definitely got some Rock Gods in here! 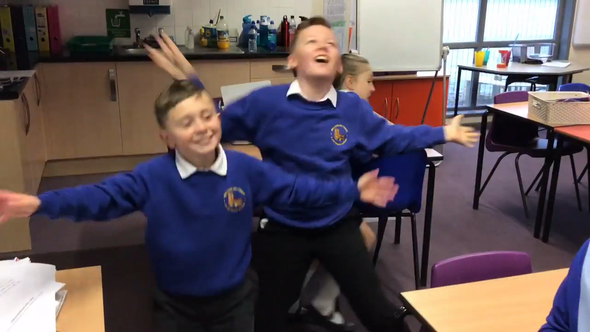 Here's hoping that you've had a wonderful Summer holiday. 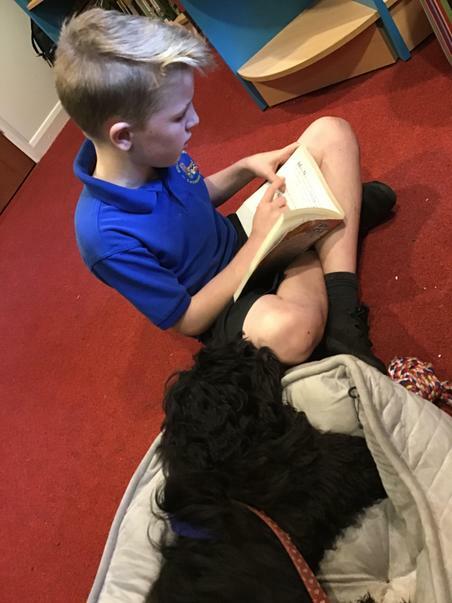 We hope you are well-rested and ready to start the new year! 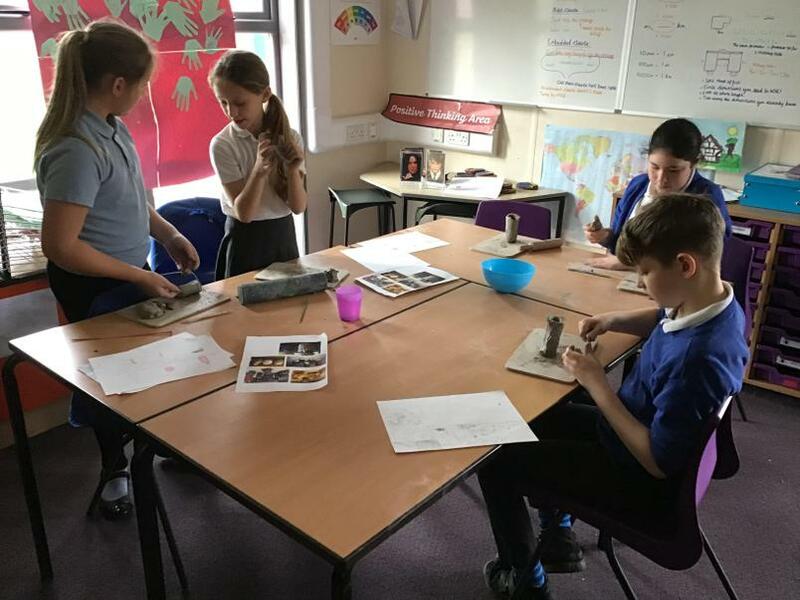 We will put some information up on the class page at the beginning of term about our first topic, but as we are the first Foxes at Walton, we will be starting the year by reading Fantastic Mr Fox as our class book. 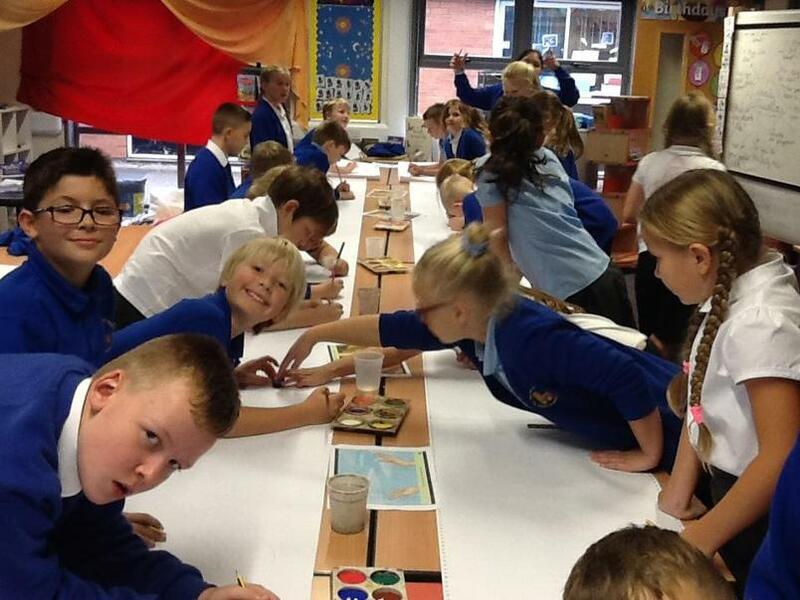 This will also give us some great ideas for Roald Dahl Day. 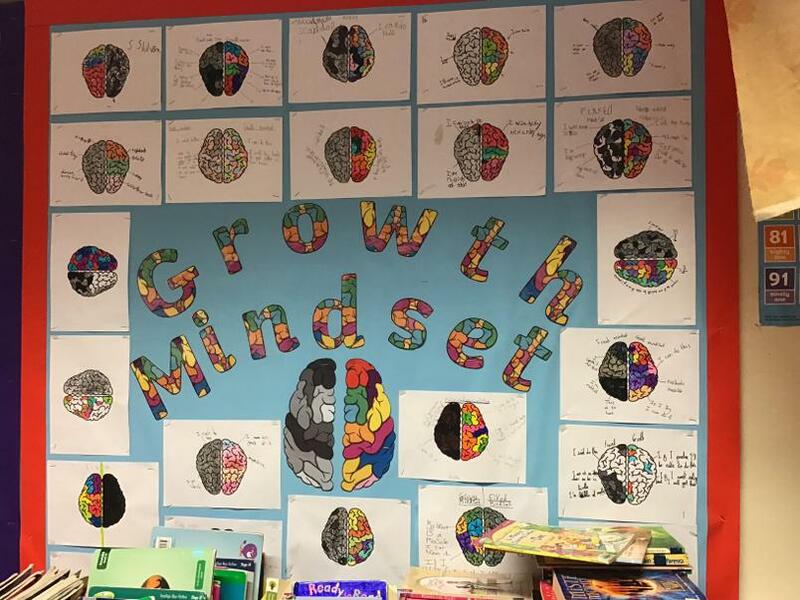 Remember, your most important tool this year will be your mind. 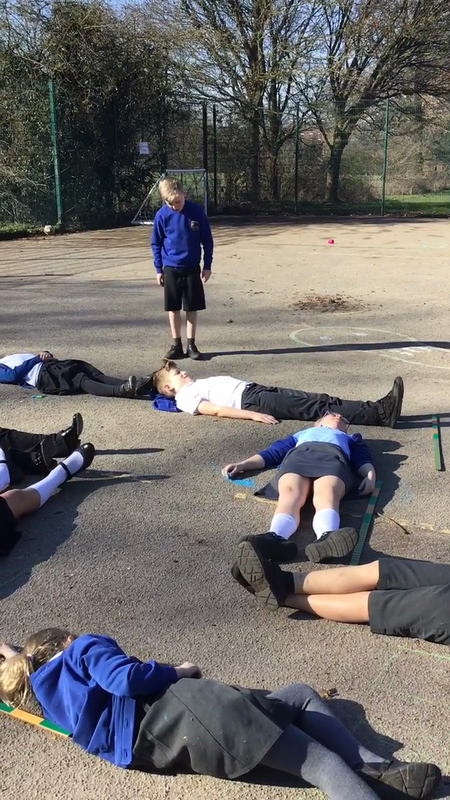 Every brain is a muscle so let's start exercising it and helping it grow even stronger! 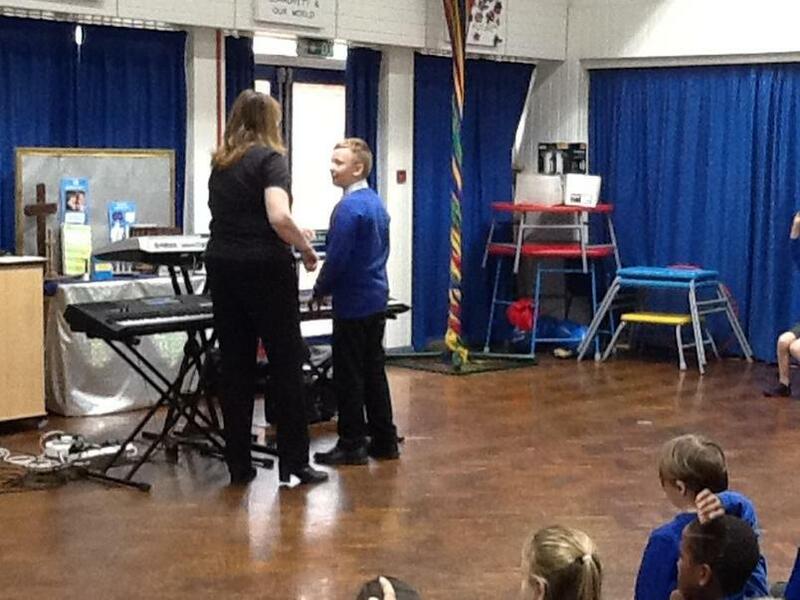 Mrs Stewart and Mr Willetts.